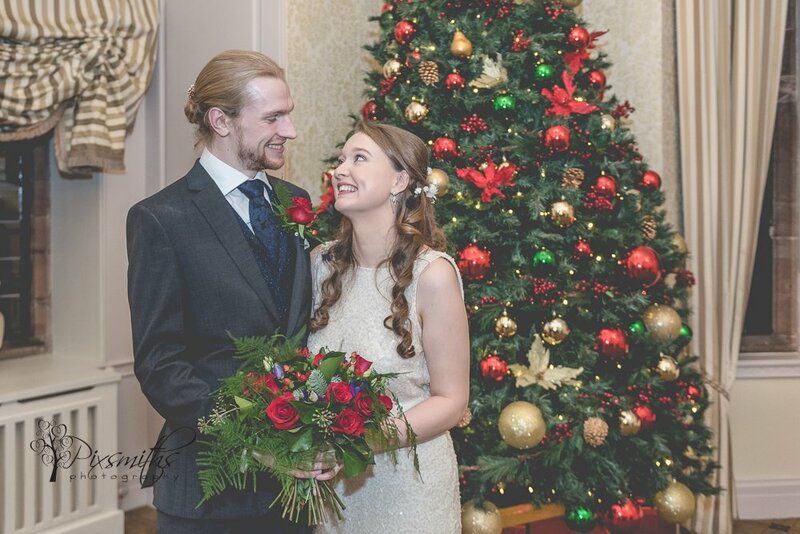 Oh such a festive winter wedding at Inglewood Manor, The rooms beautifully decked and adorned with garlands and several Christmas trees. 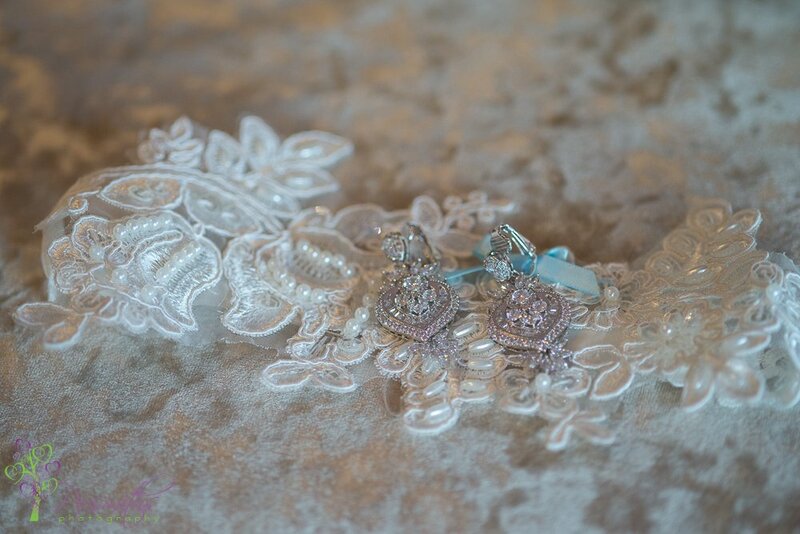 So many gorgeous details. 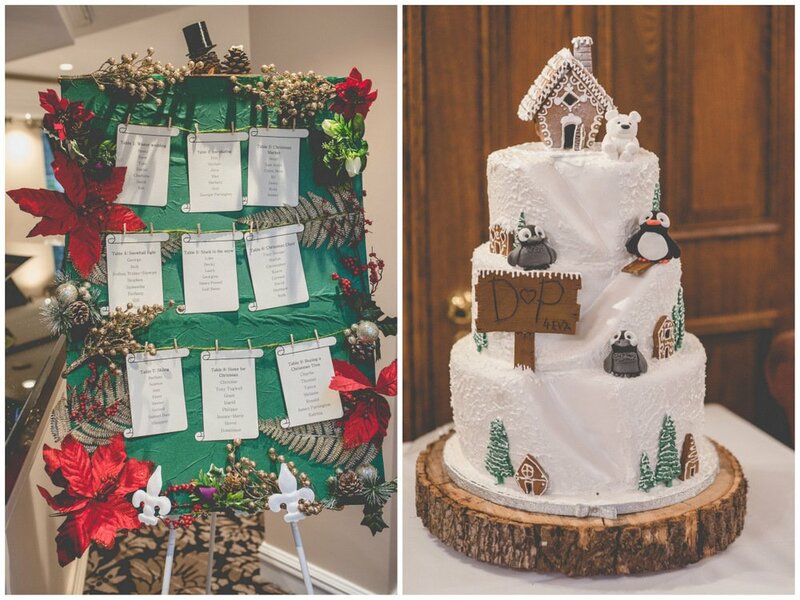 The snow cake with penguins and polar bear and topped with a gingerbread house. 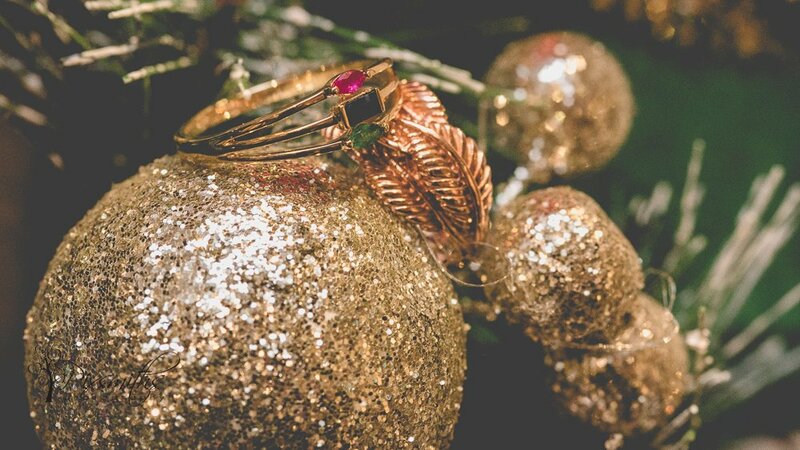 Really fittig for the festive theme. 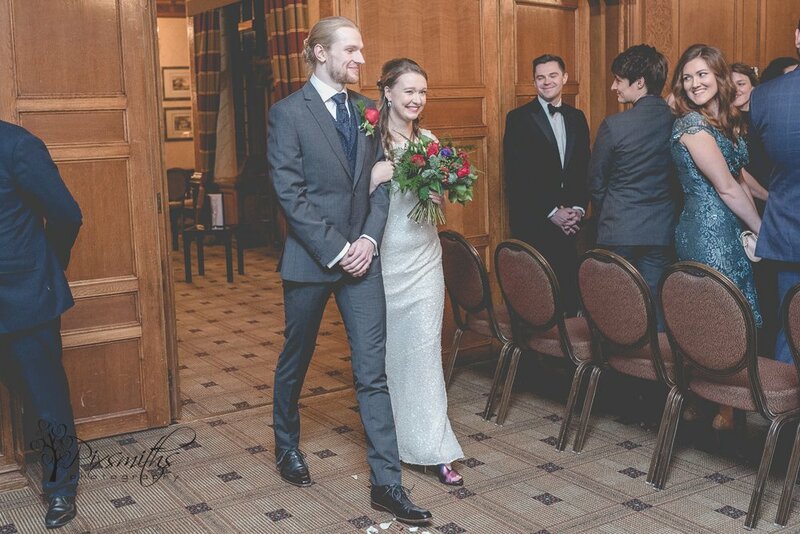 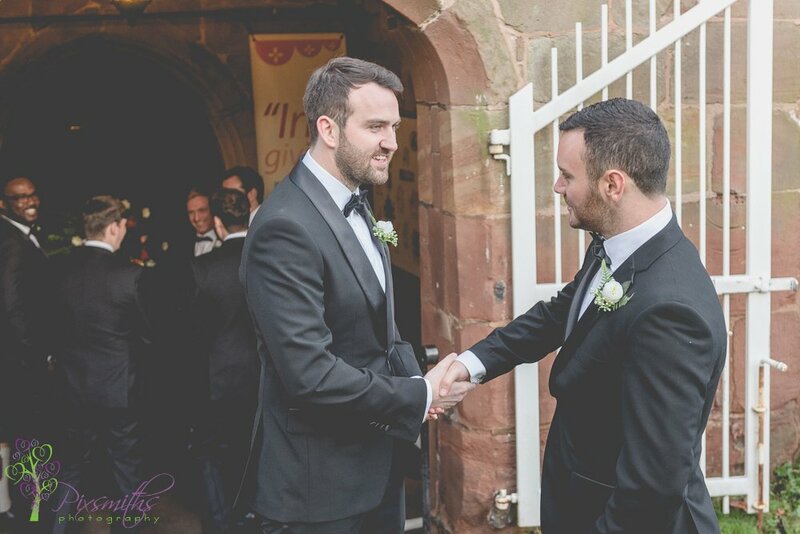 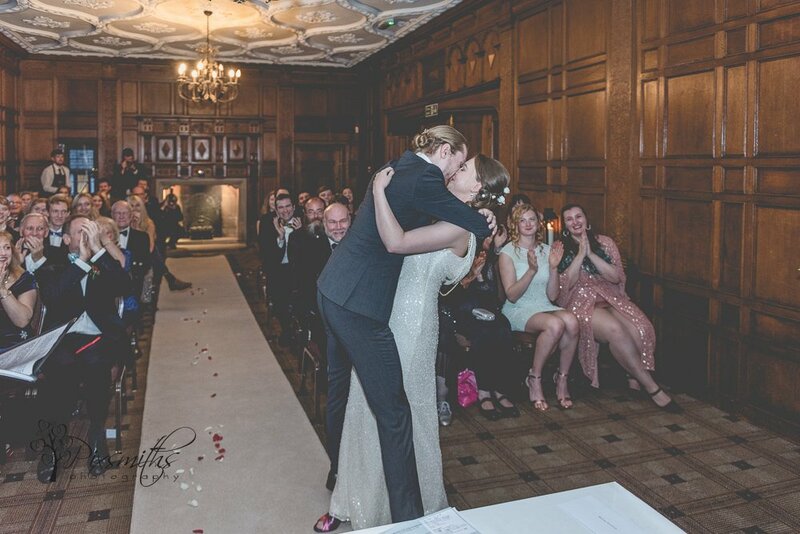 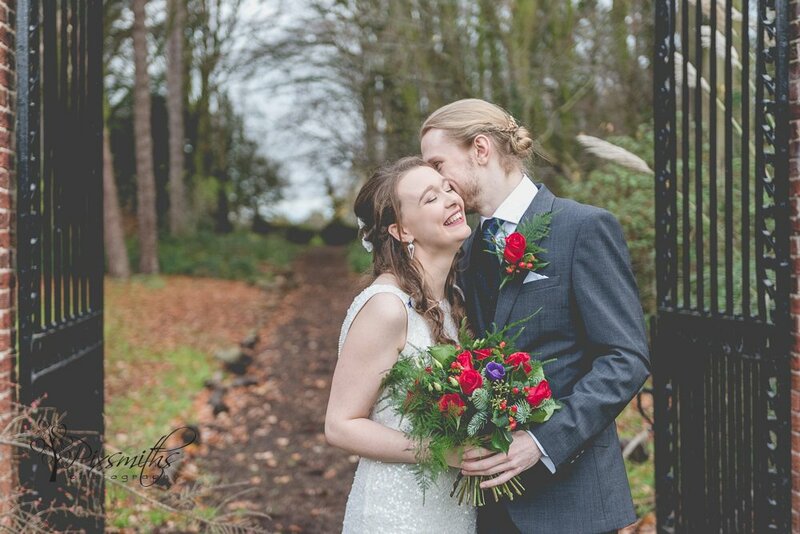 Oh and our couple were blooming amazing too, totally non traditional enjoying a first look before the ceremony and then walking down the aisle together. 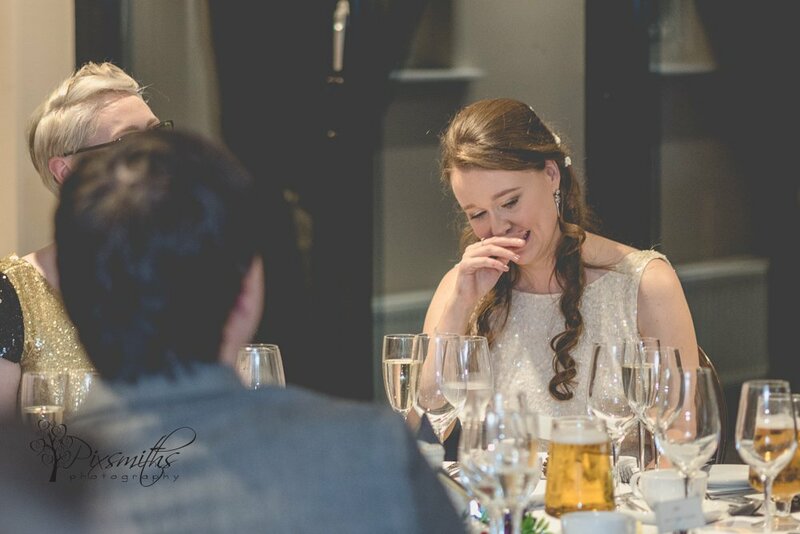 So relaxed with each other, it was a delight to see and we loved their many giggles! 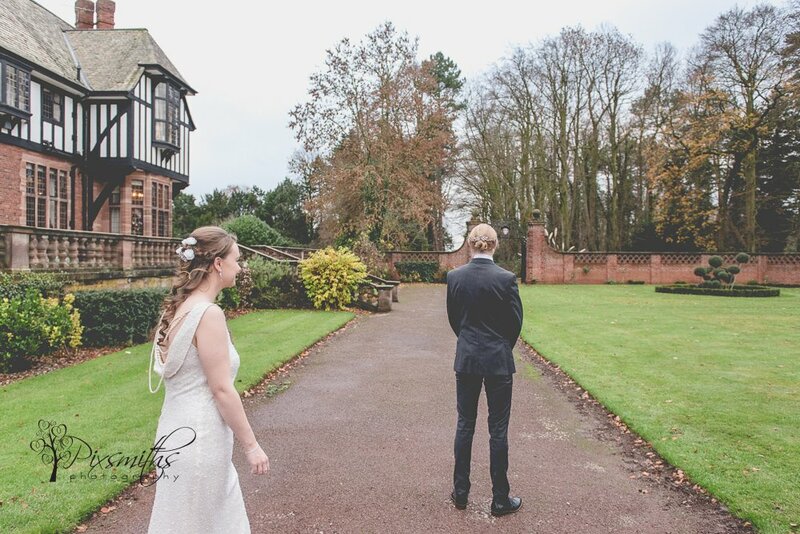 Inglewood has so many areas to take portraits we could avoid being overlooked by guests arriving for the wedding ceremony. 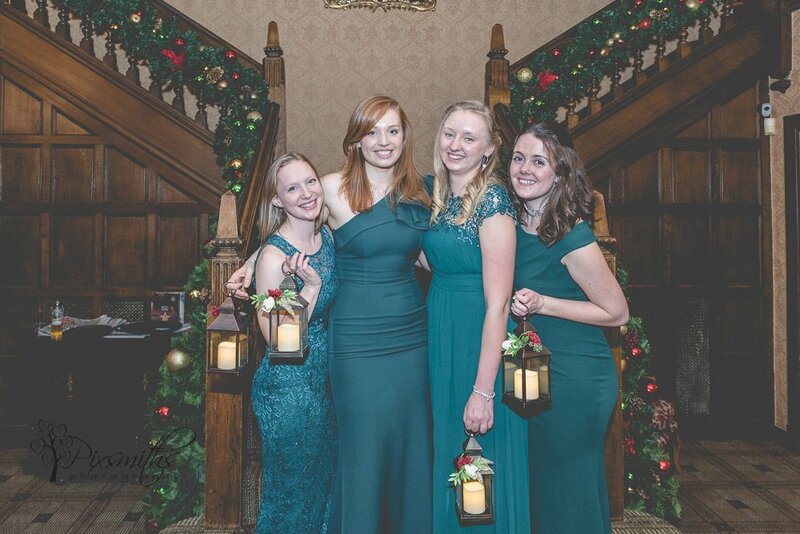 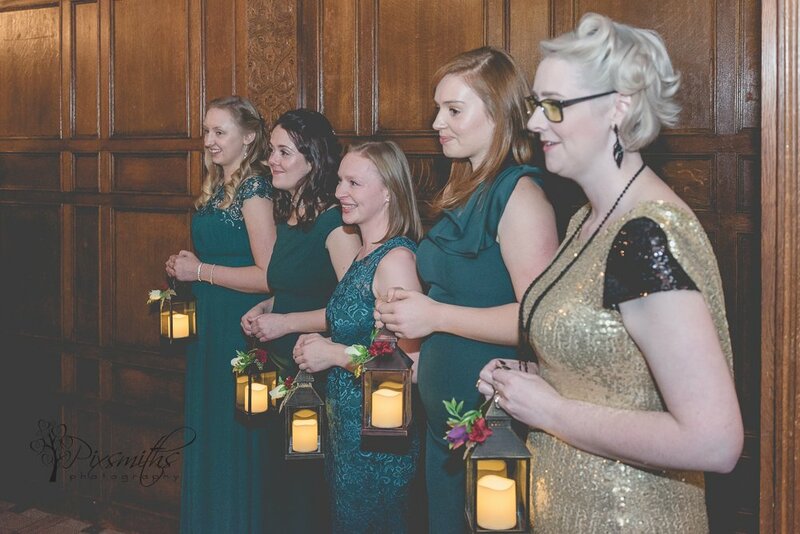 The Bridesmaids carrying lanterns which really fitted the Christmas theme. 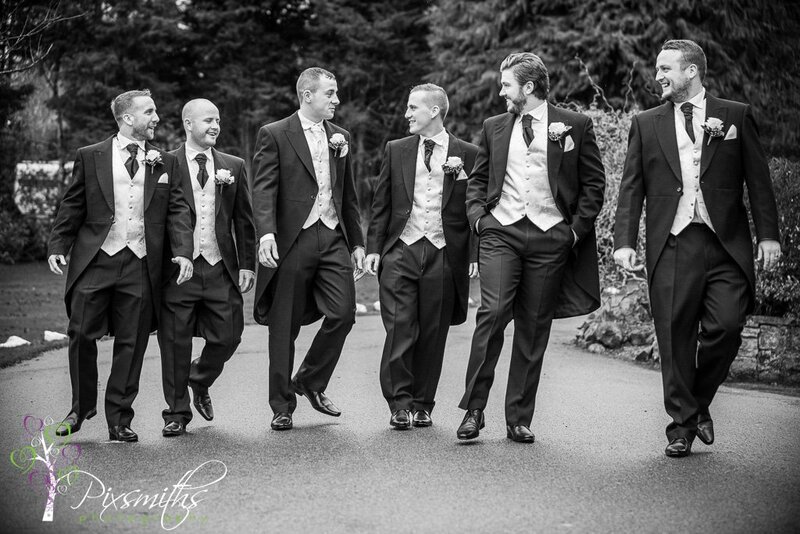 There were a few groups but with plenty of time set aside and great cooperation they were soon done. 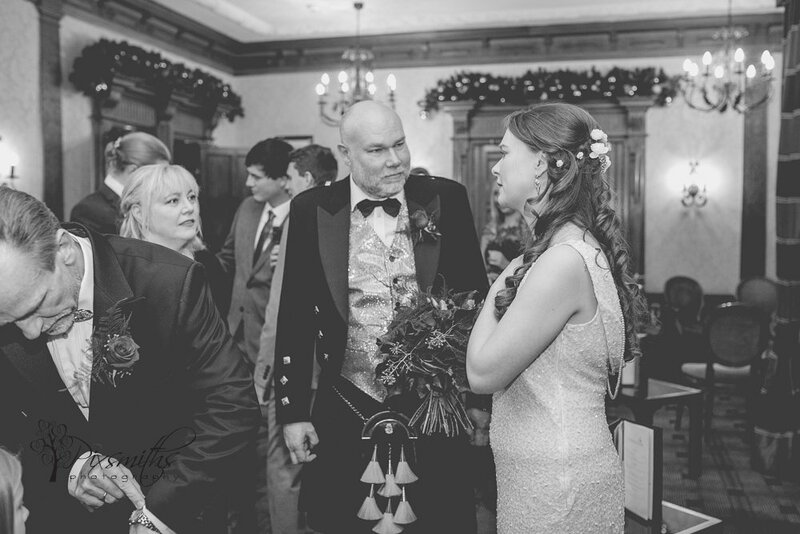 Family pictures are so important, especially when families had travelled far and wide, many from New Zealand to be her for Penny and David. 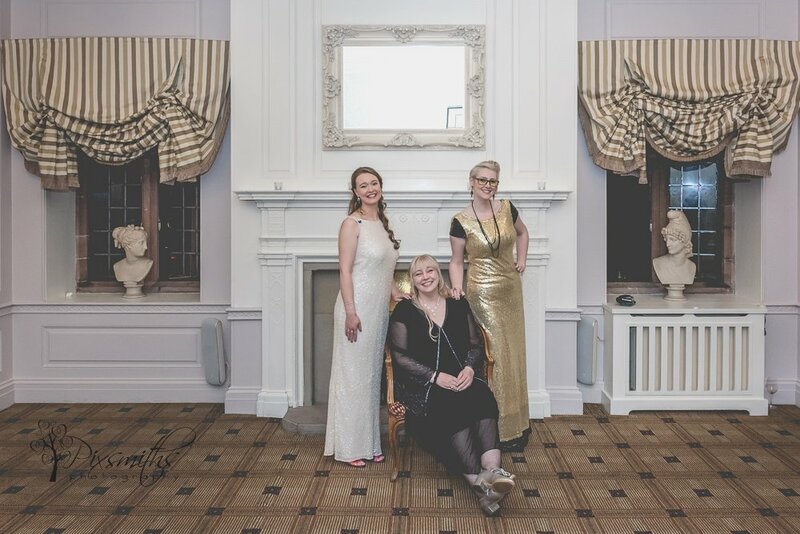 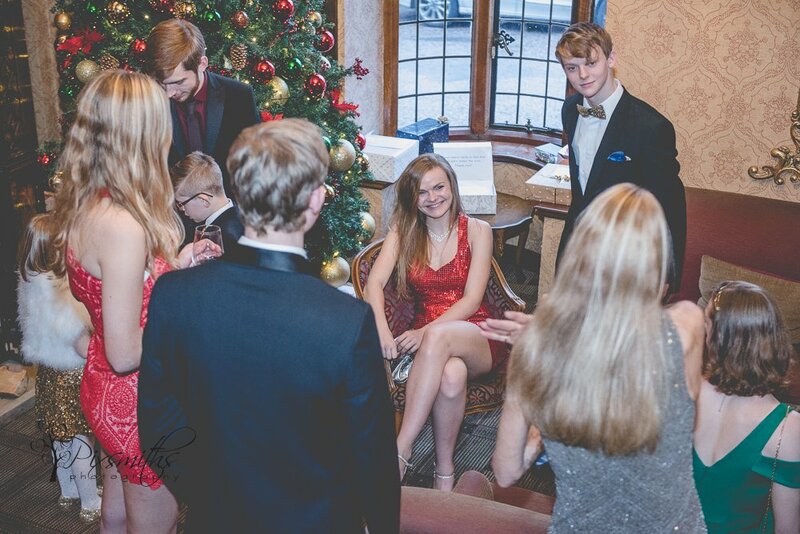 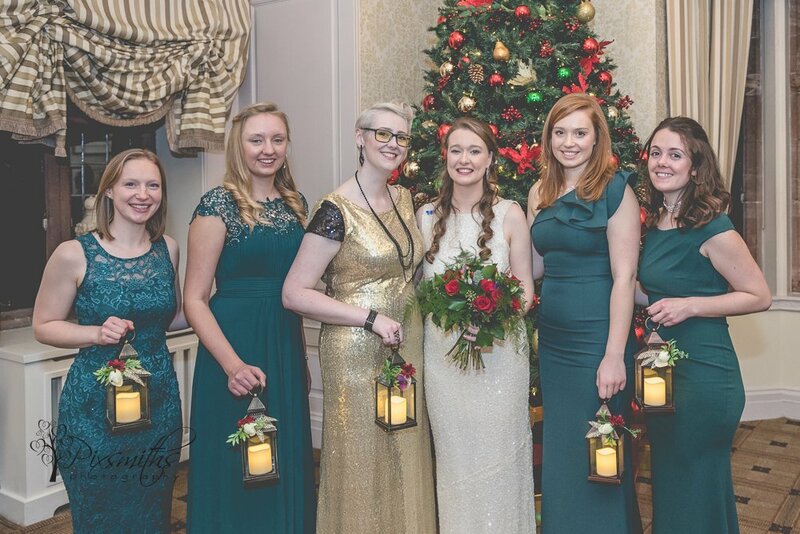 The staircase is a lovely option for photos for small groups but for larger ones we used the side room with its beautiful Christmas tree and whitish walls. 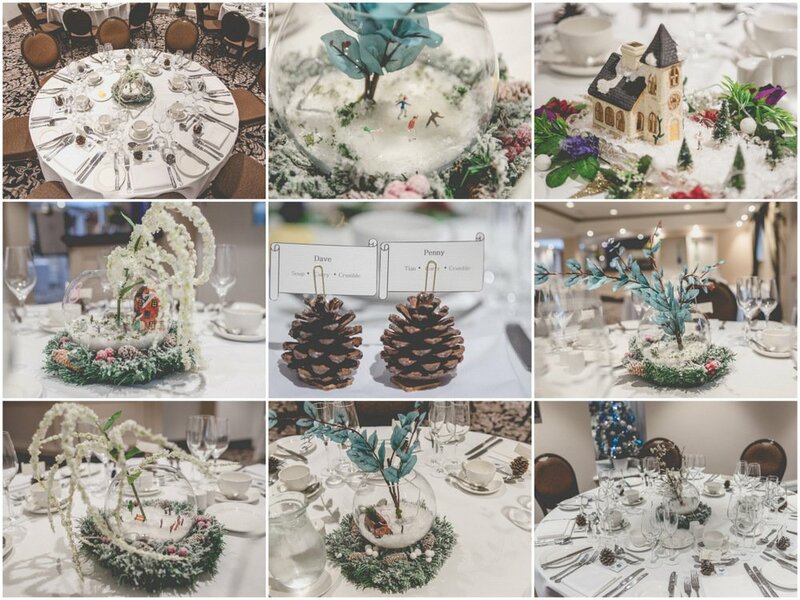 The table centre pieces were cute miniature winter scenes in fish bowls , all carefully painted by Penny herself – how creative! 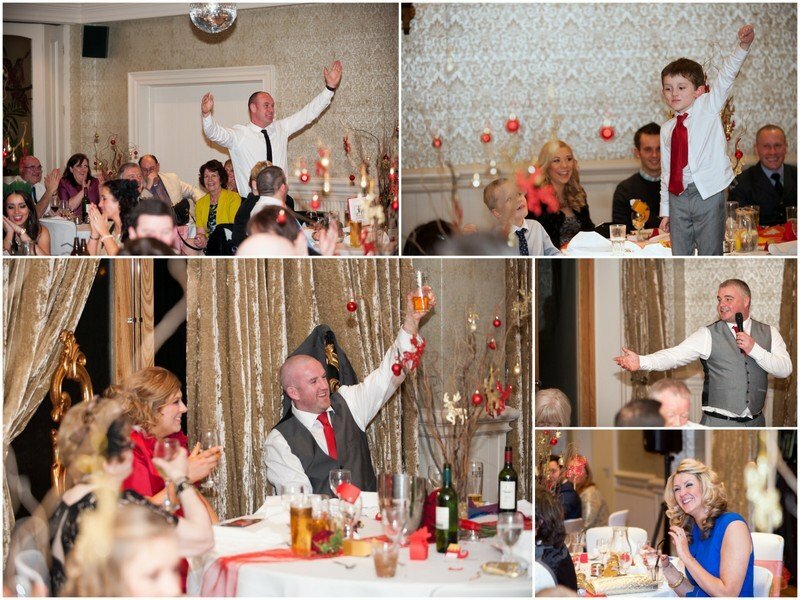 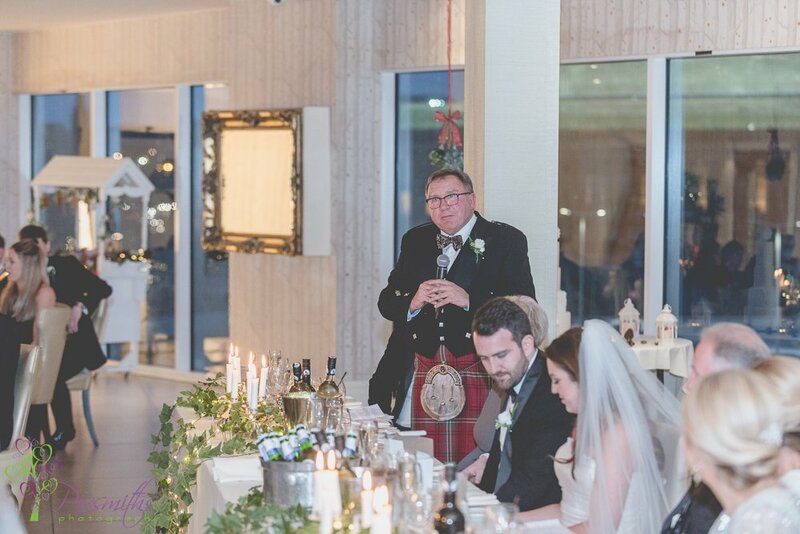 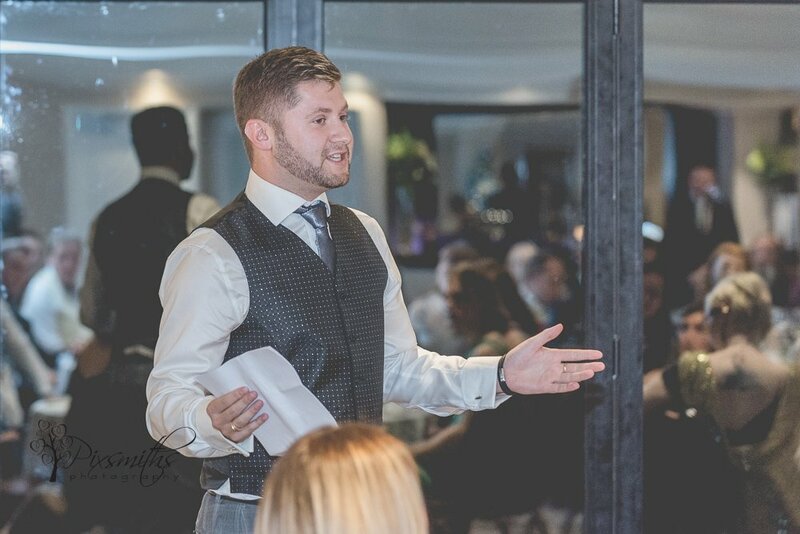 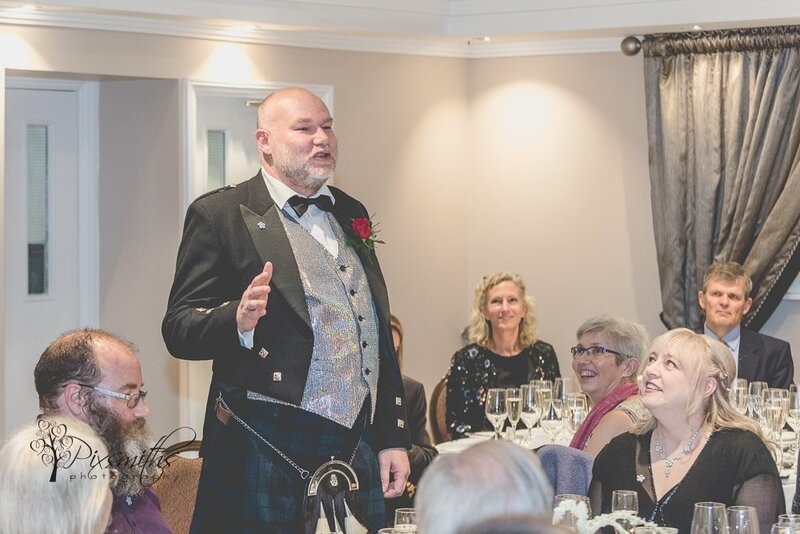 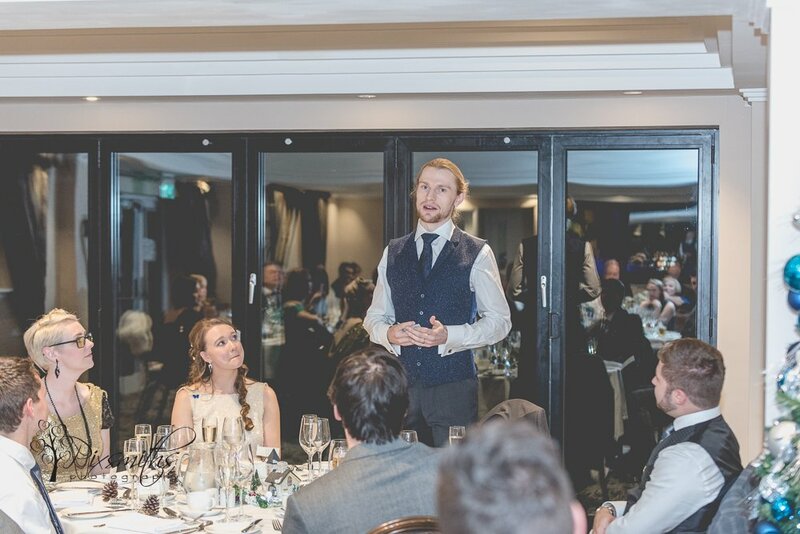 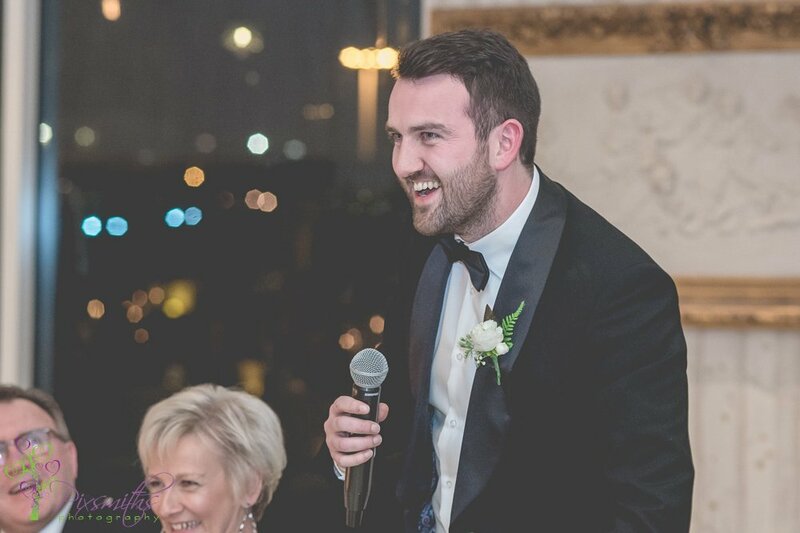 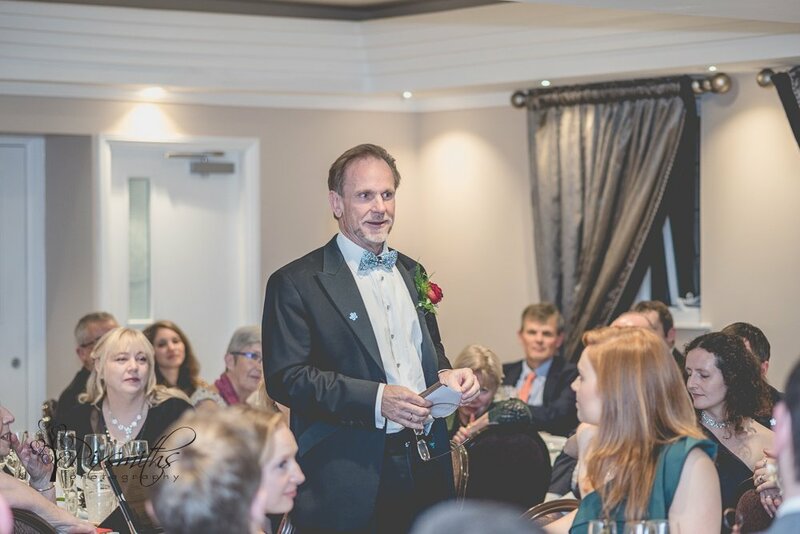 There were several speeches – Father of Bride, Mother of Groom, Groom, Bestman and Bride’s sister! 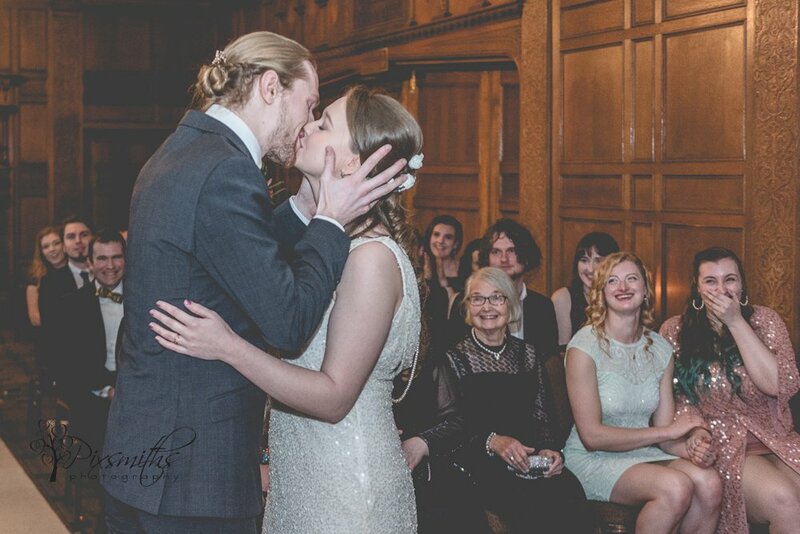 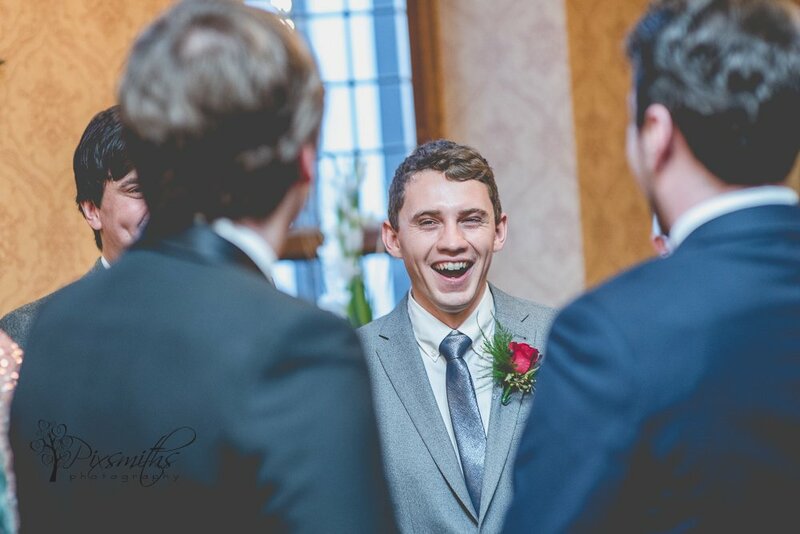 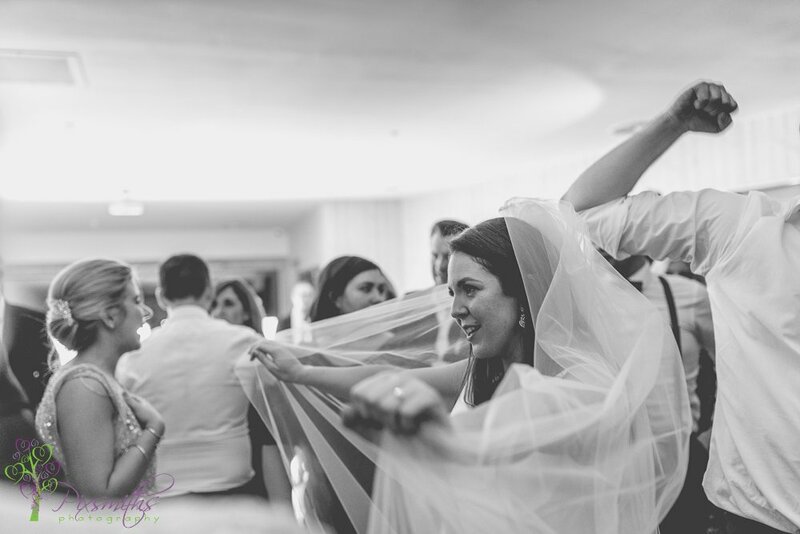 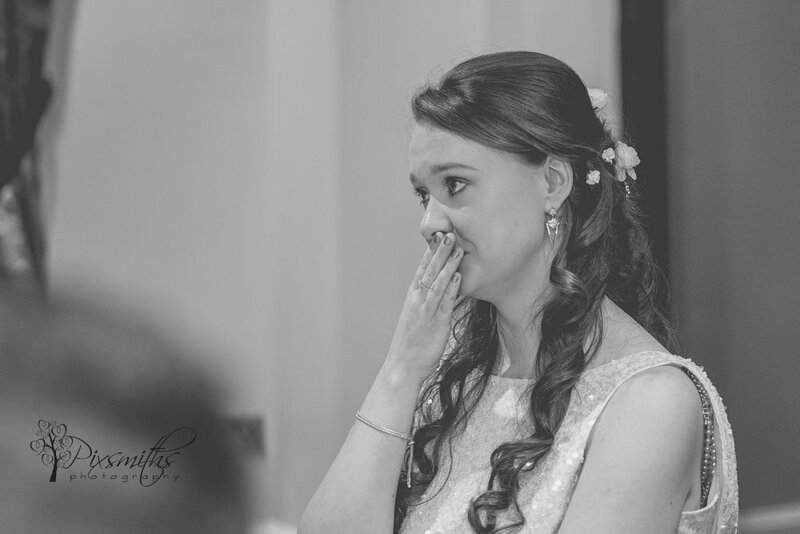 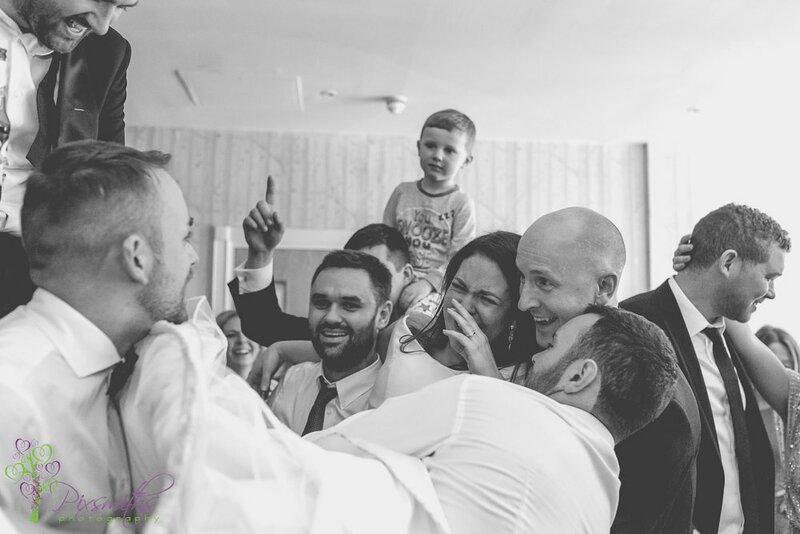 we love to capture the emotion and reactions during these. 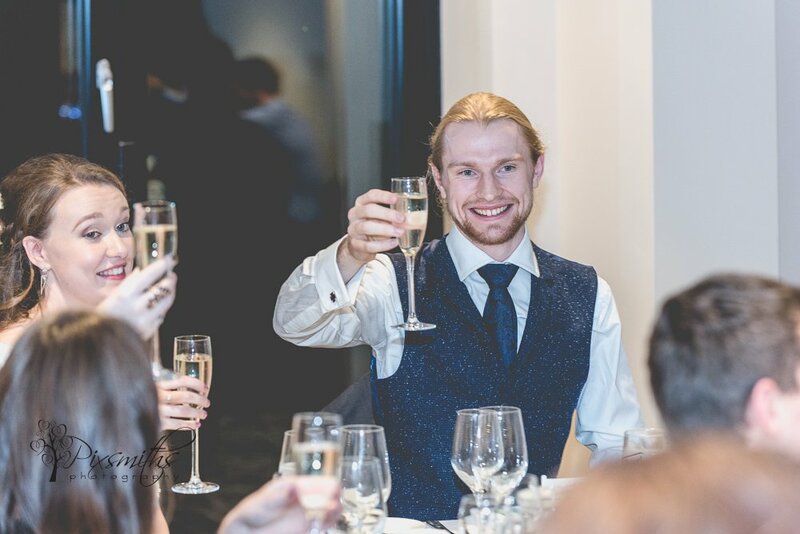 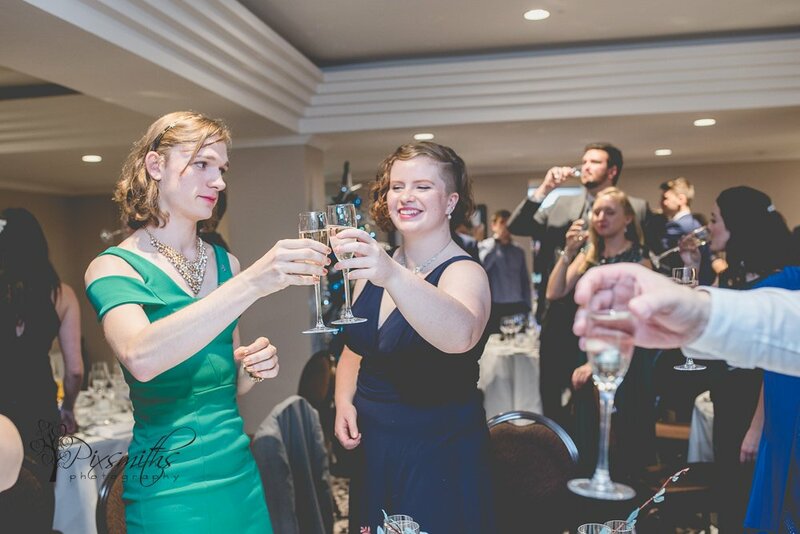 Plenty of emotion, laughter and toasts to enjoy. 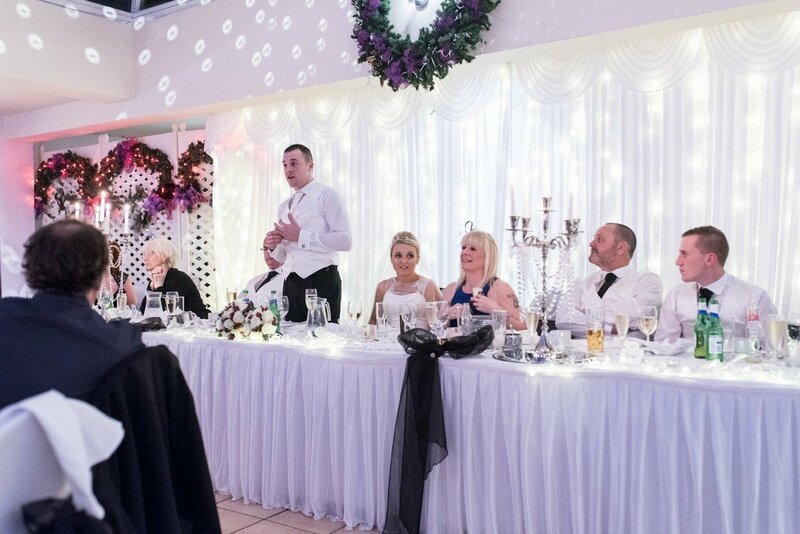 The speeches were before the meal and afterwards we left the party to enjoy their food and to continue the celebrations into the evening. 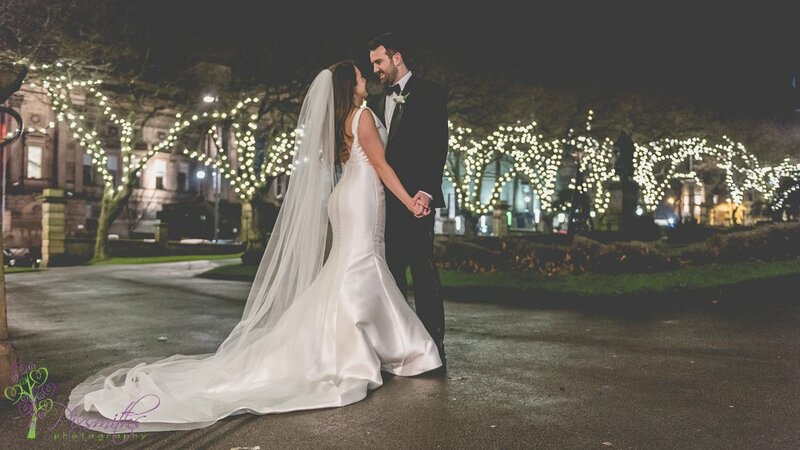 This was one of our short coverage twilight weddings and shows just how much can be captured in a few hours if you don’t require your photographers all day. 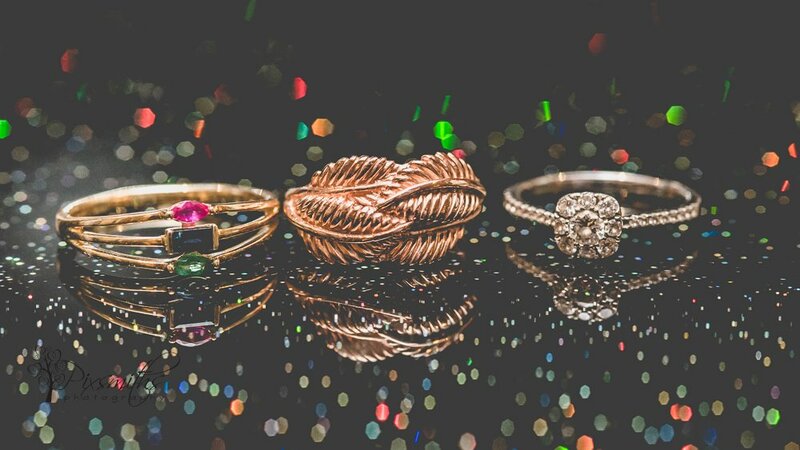 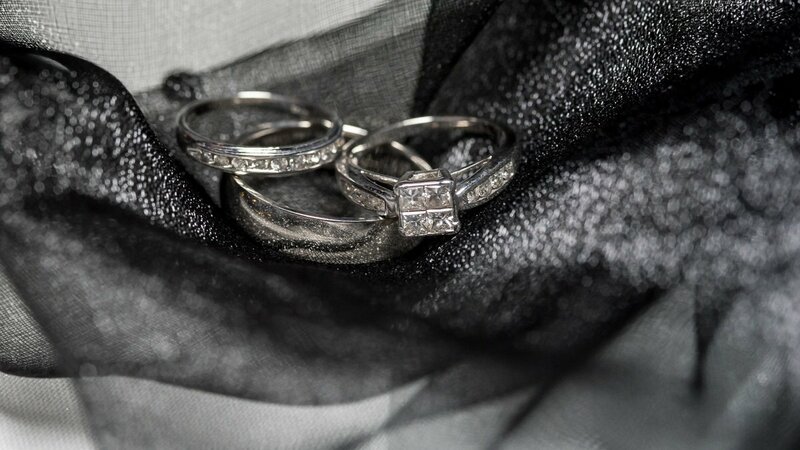 Of course we took a couple of signature ring shots that we love to do – the bar in the Burton Suite made for a fab reflection and colour for the rings – how unusual are they! 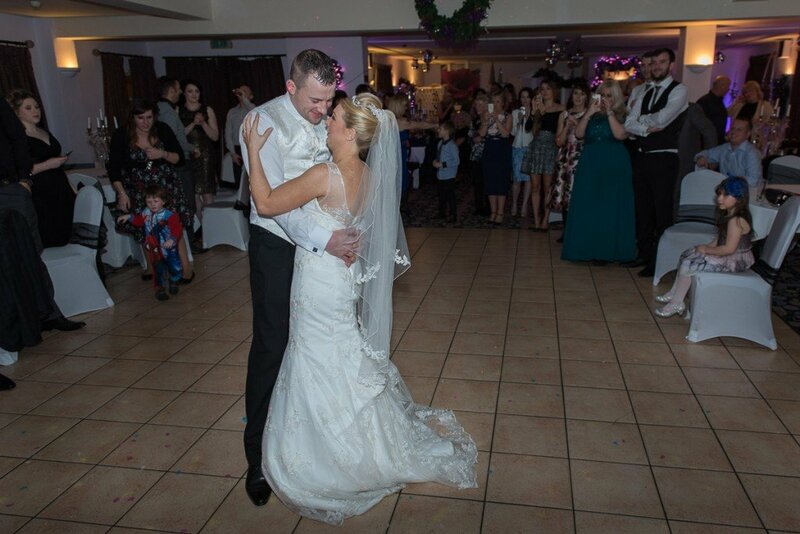 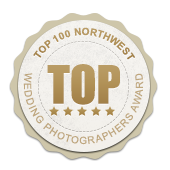 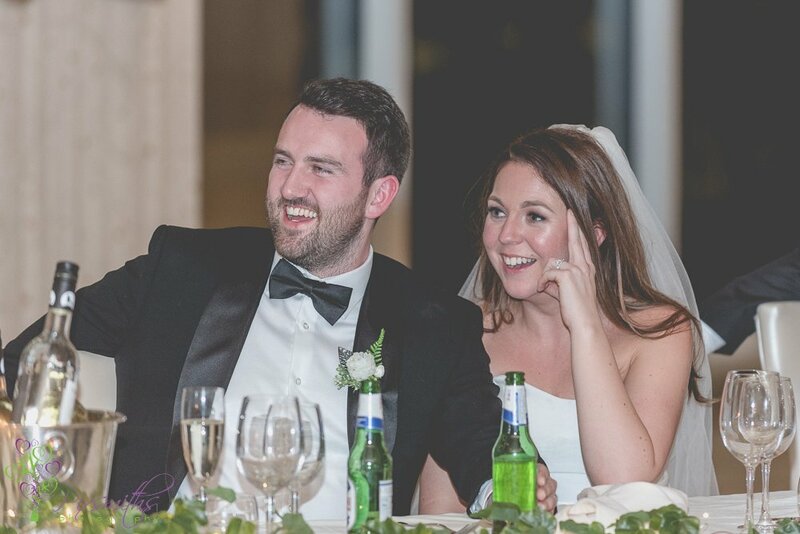 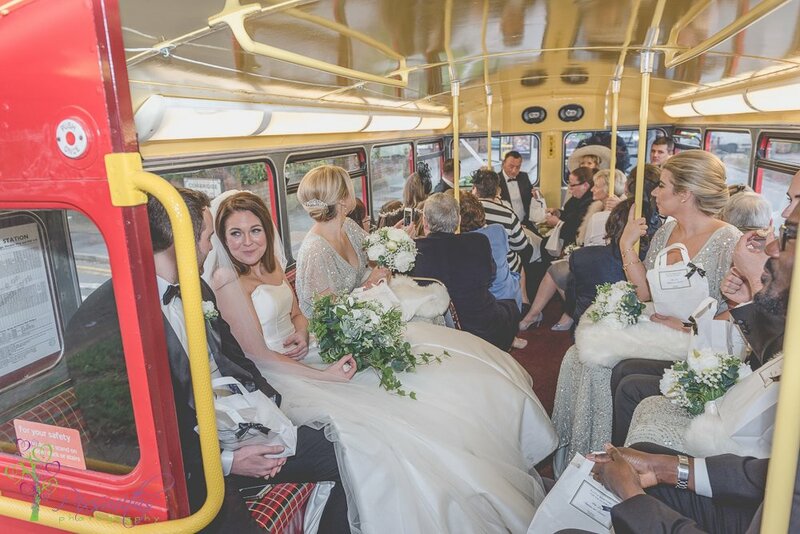 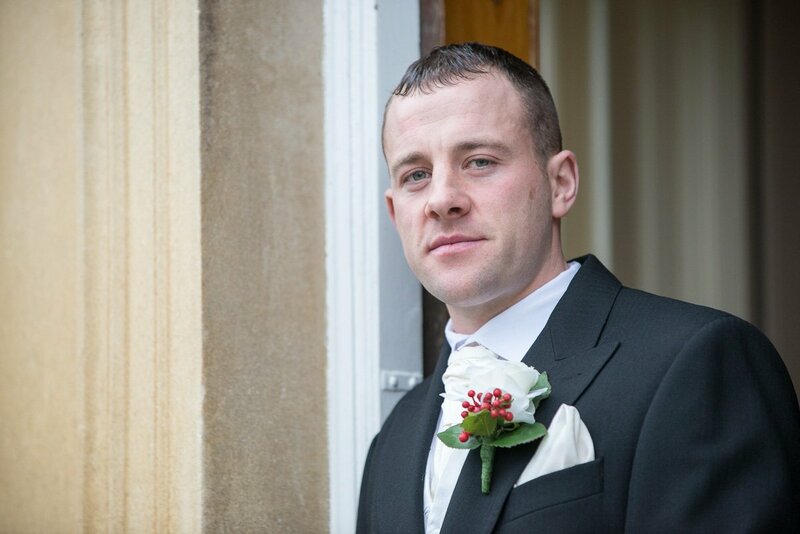 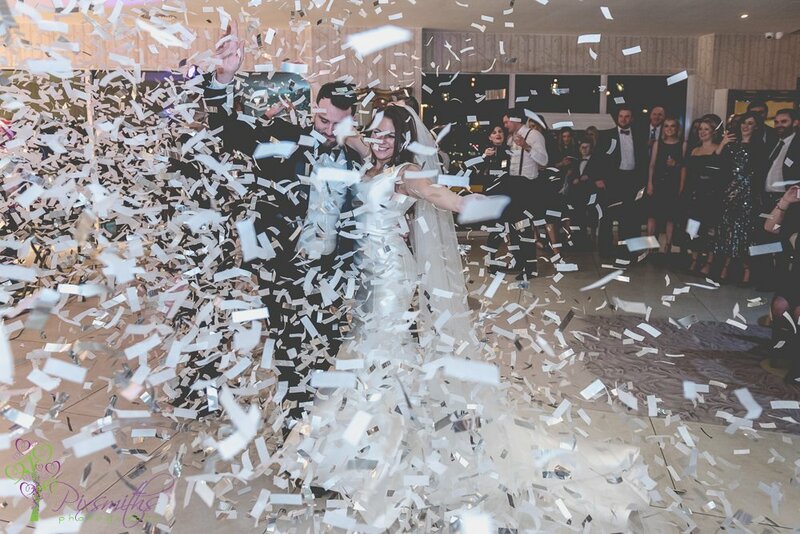 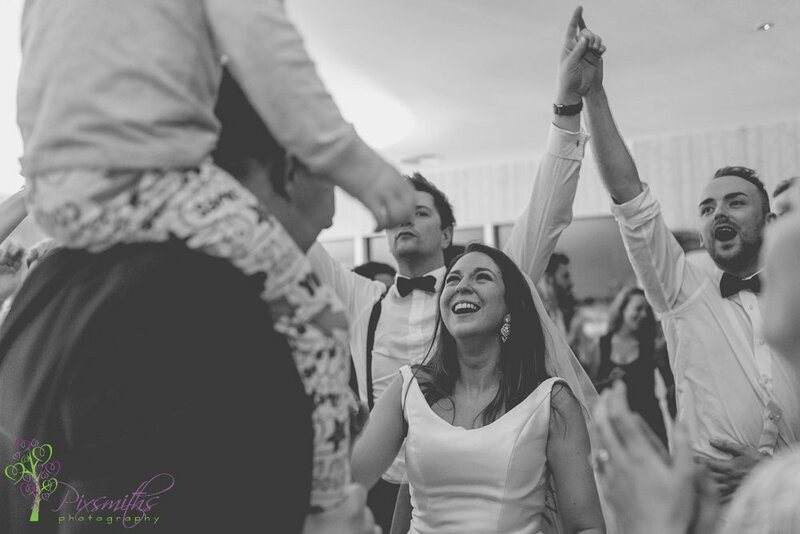 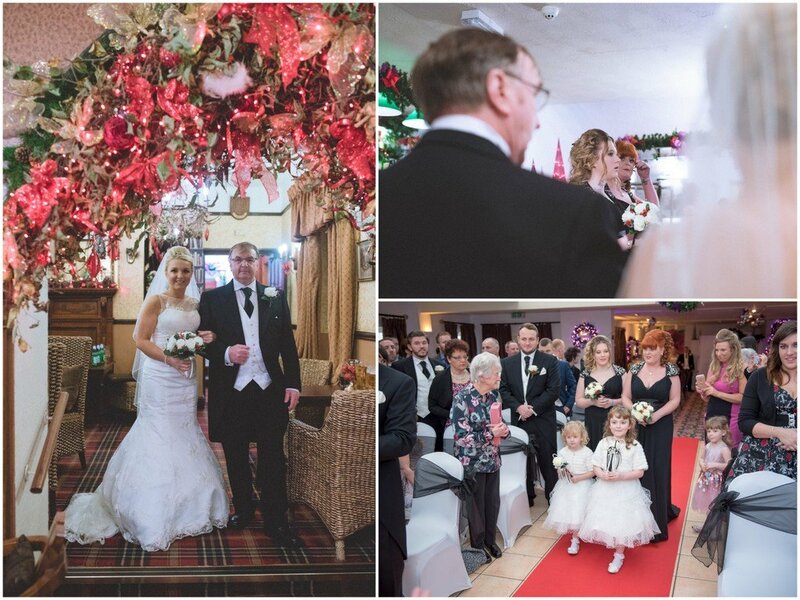 Many congratulation David and Penny – it’s evident to see how much you enjoyed your day. 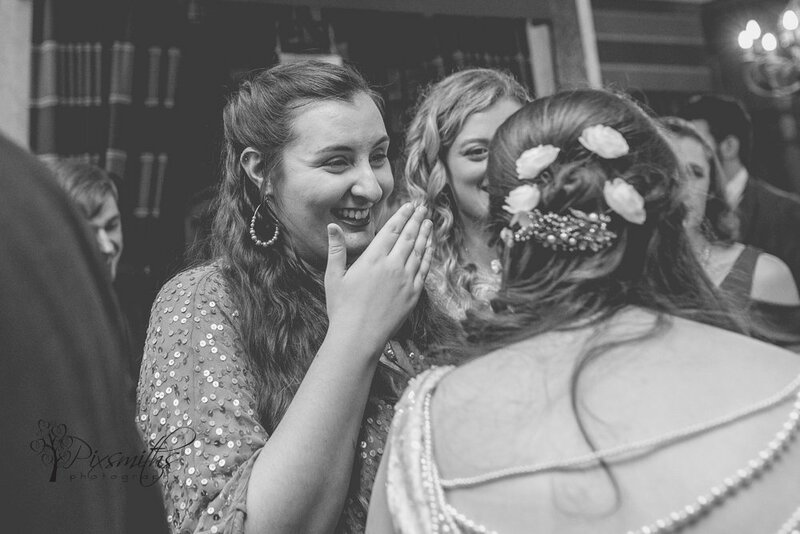 Thank you for doing things your way and for asking us to capture the most important parts for you. 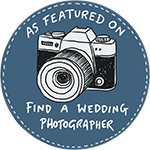 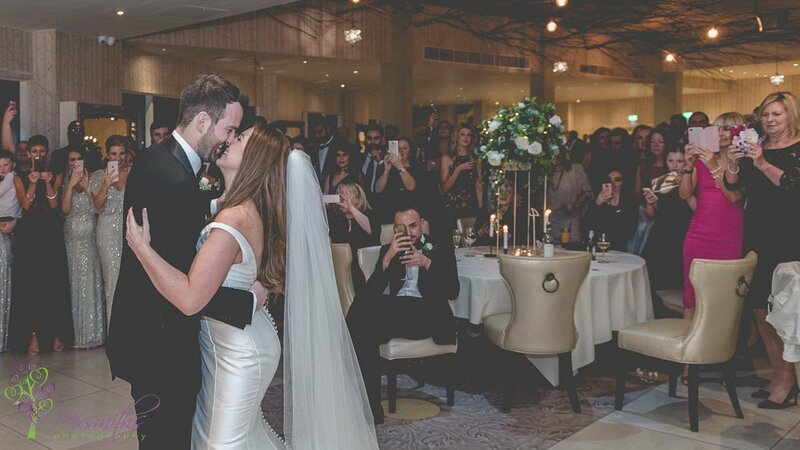 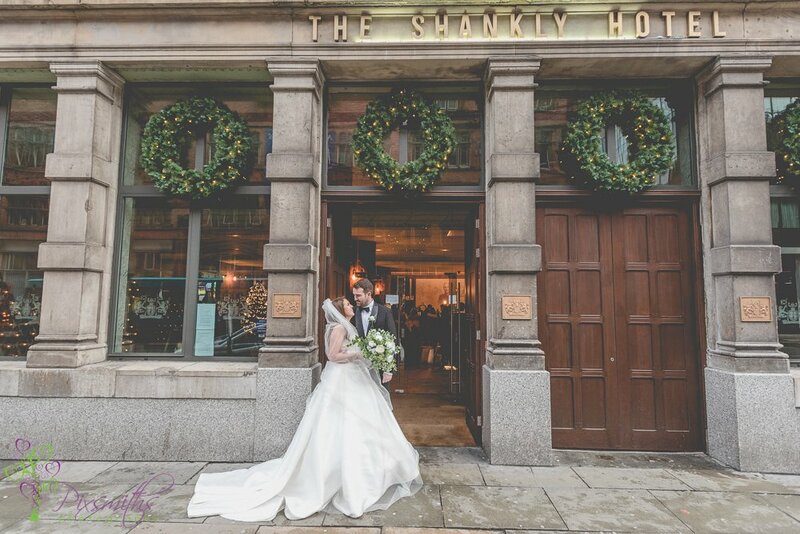 When Stephanie and Laurence announced their engagement from sunny climes we gave a squeal of excitement …and then a bigger one when they asked us to be their Shankly Hotel wedding photographer! 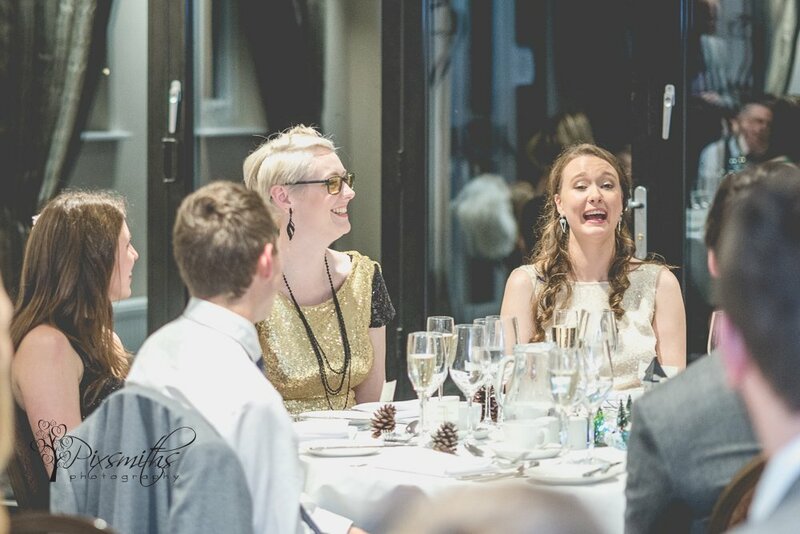 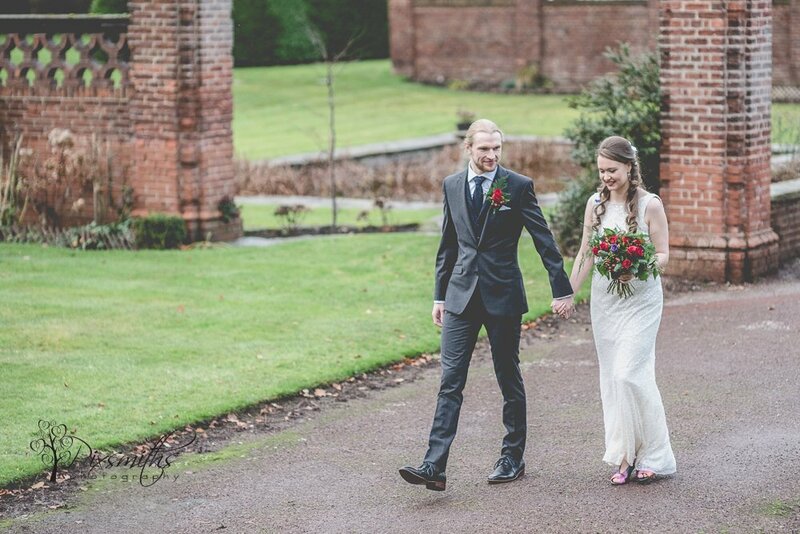 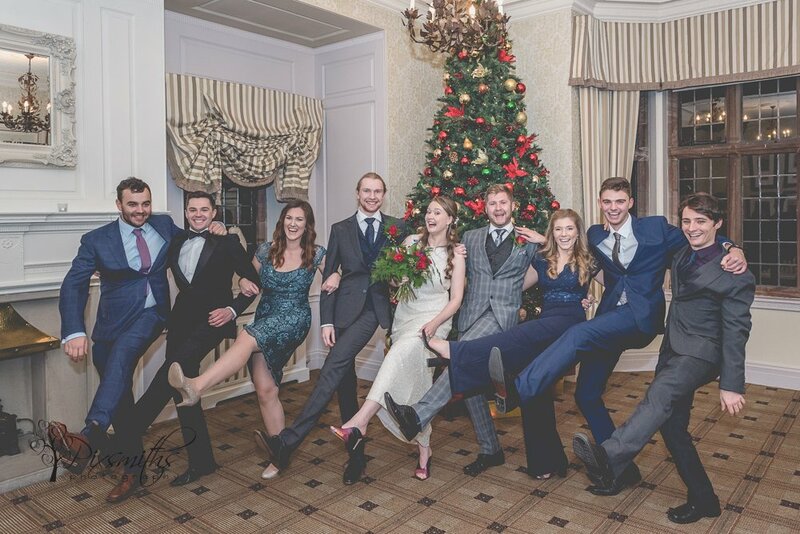 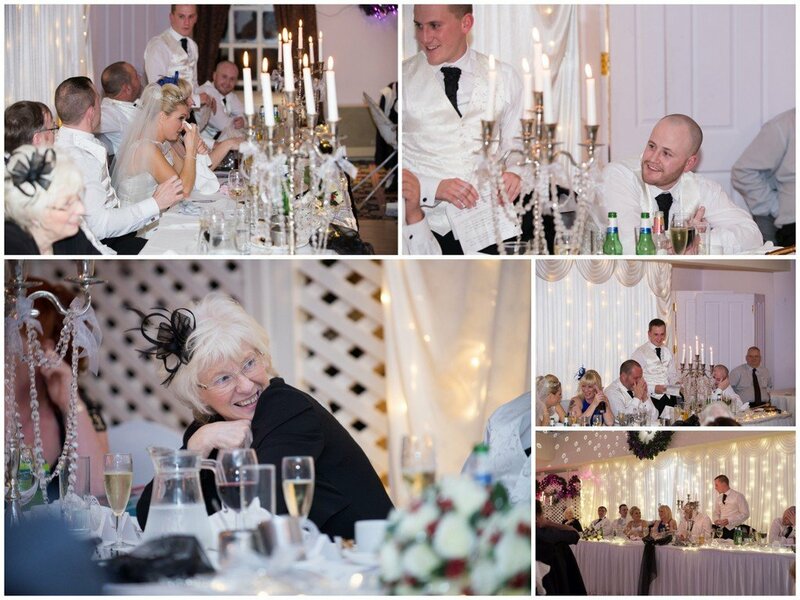 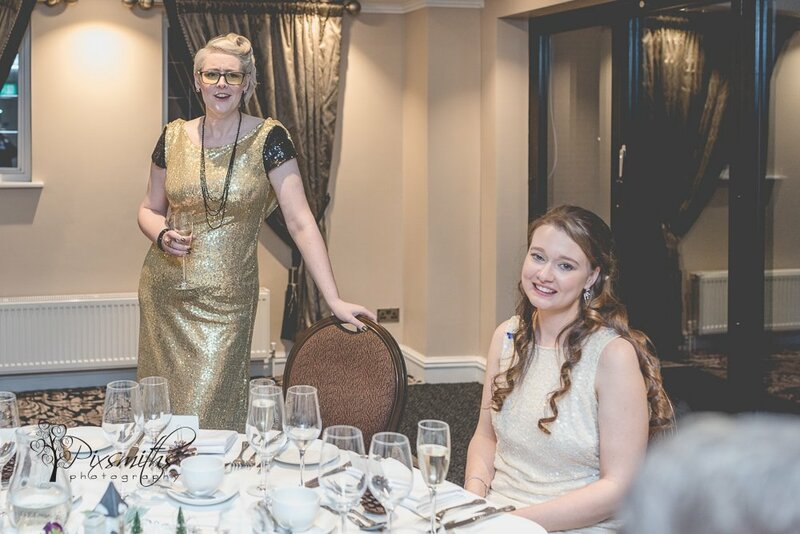 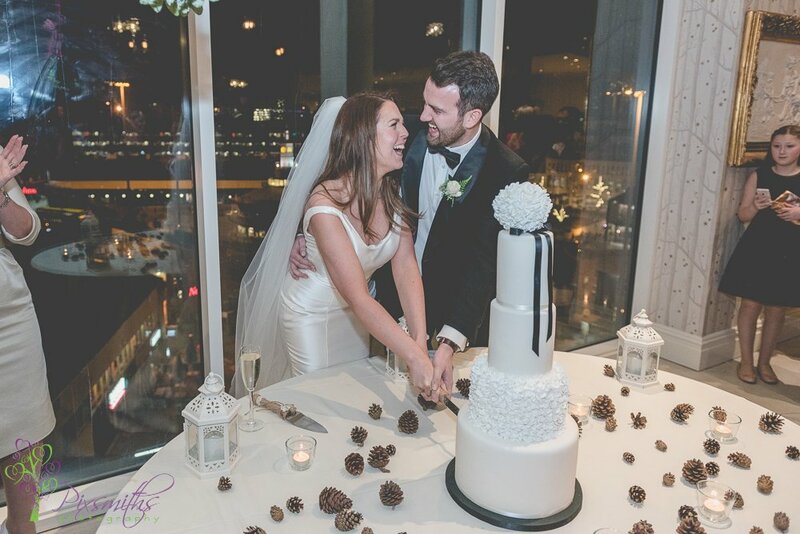 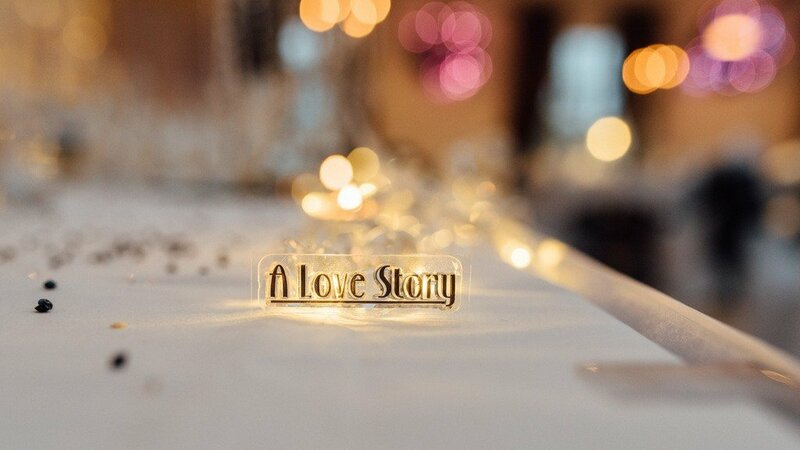 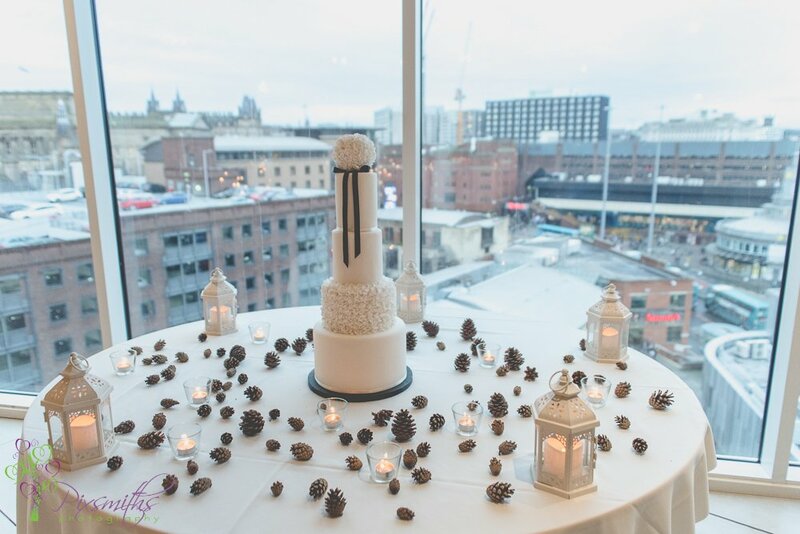 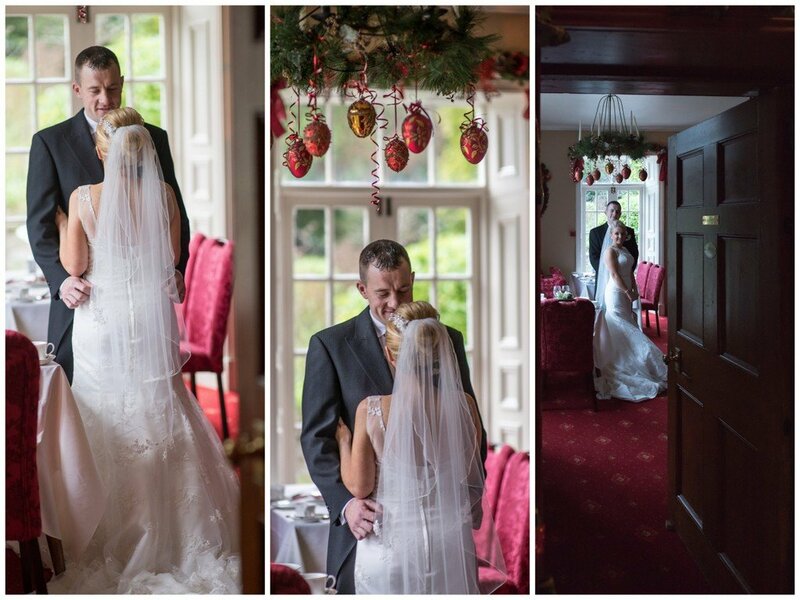 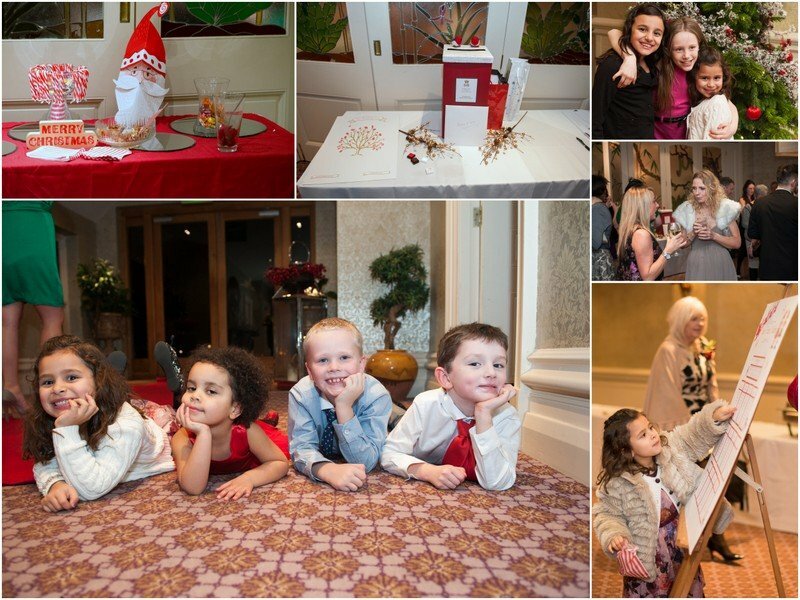 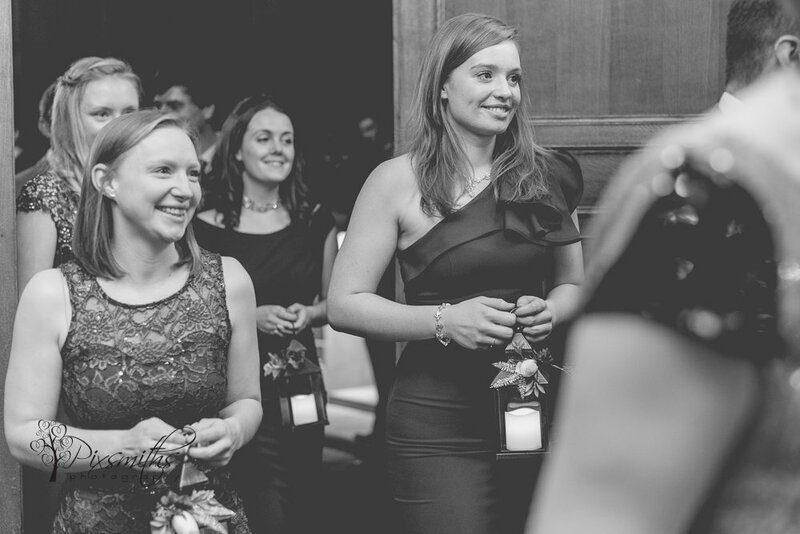 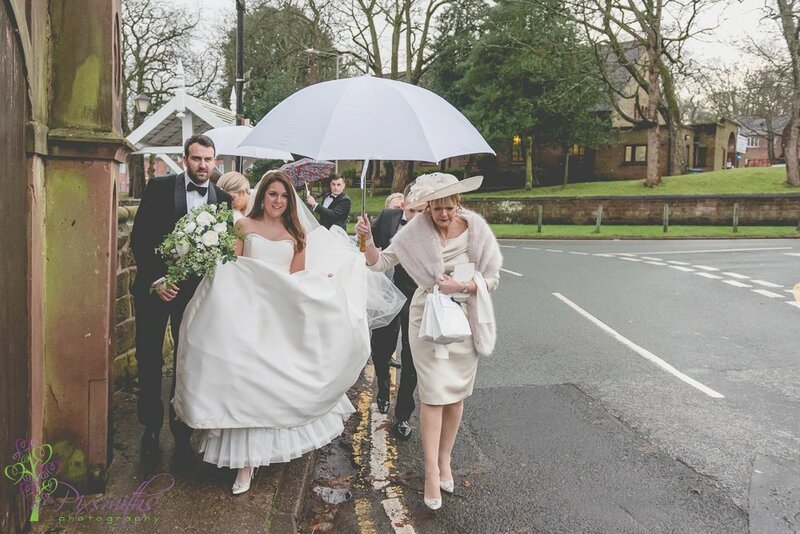 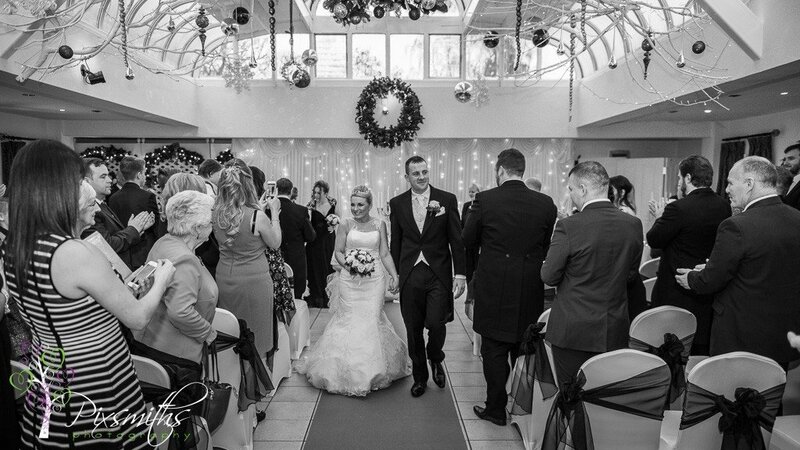 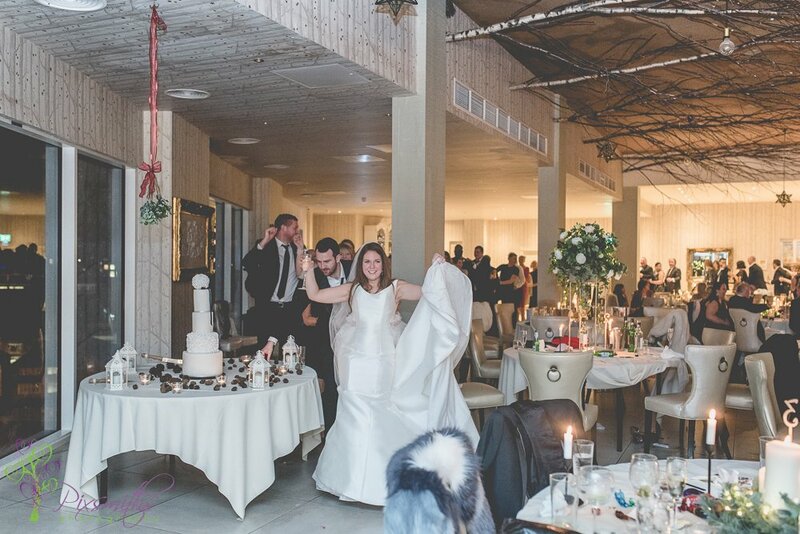 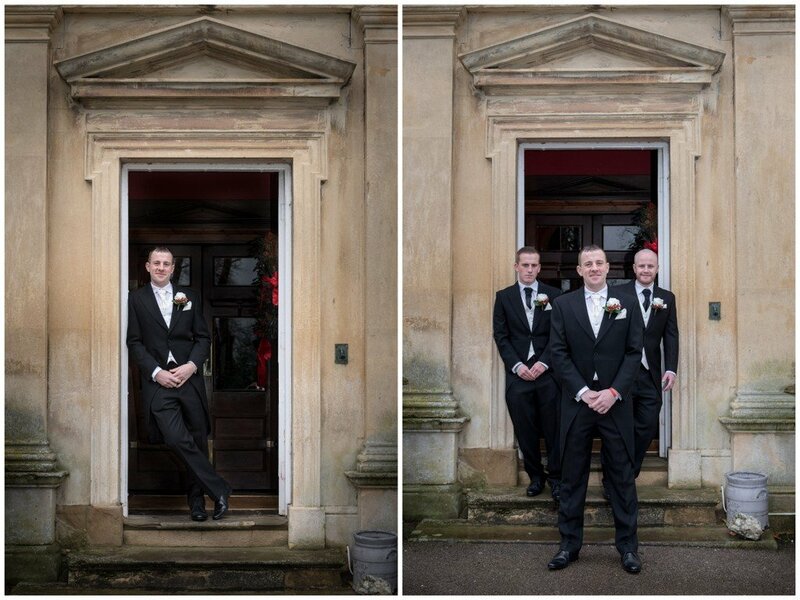 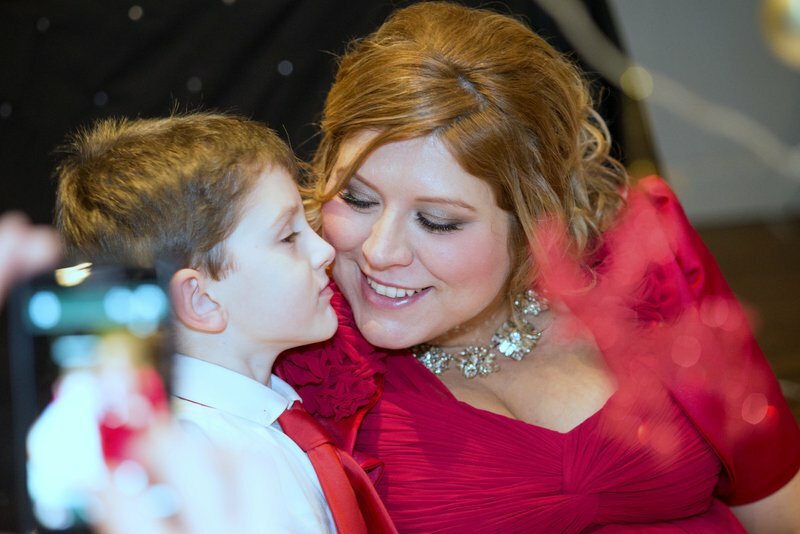 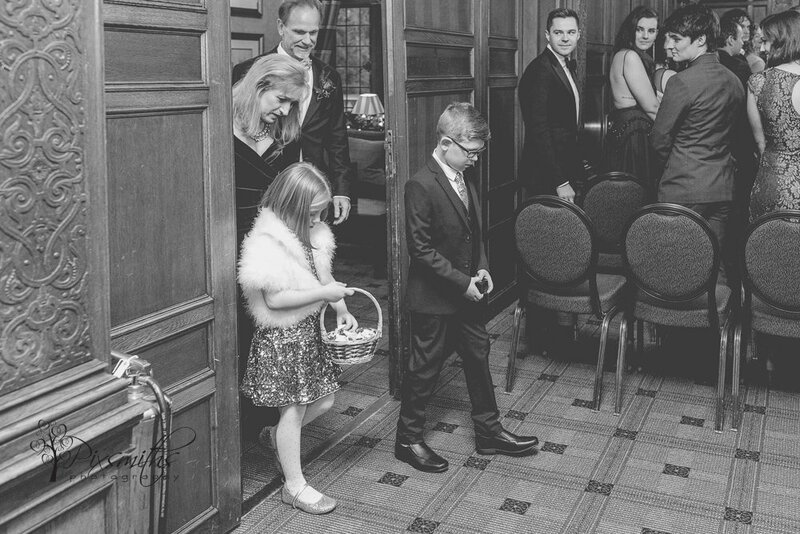 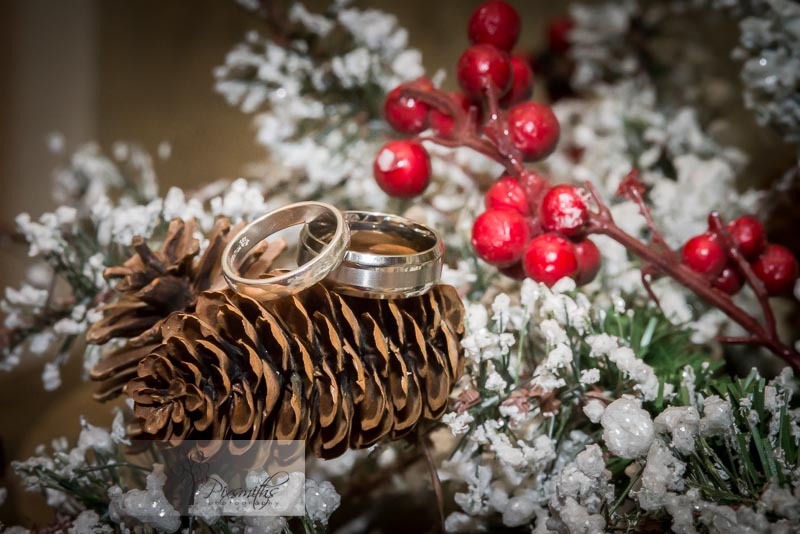 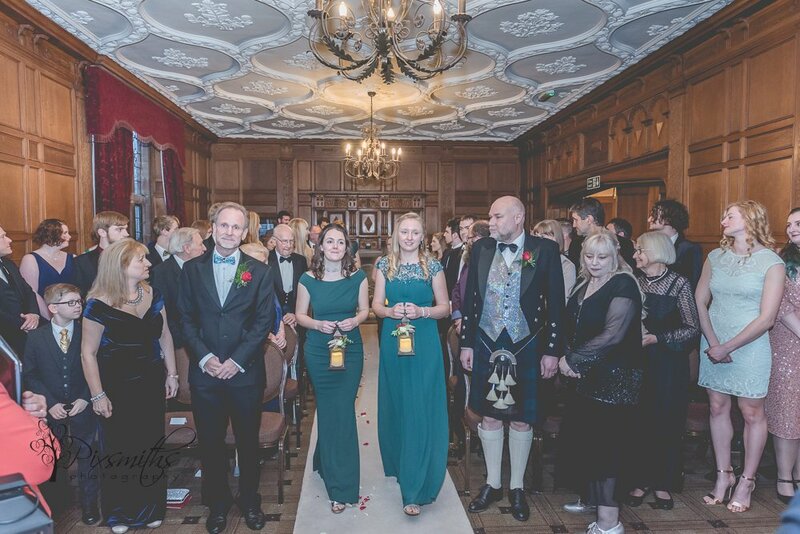 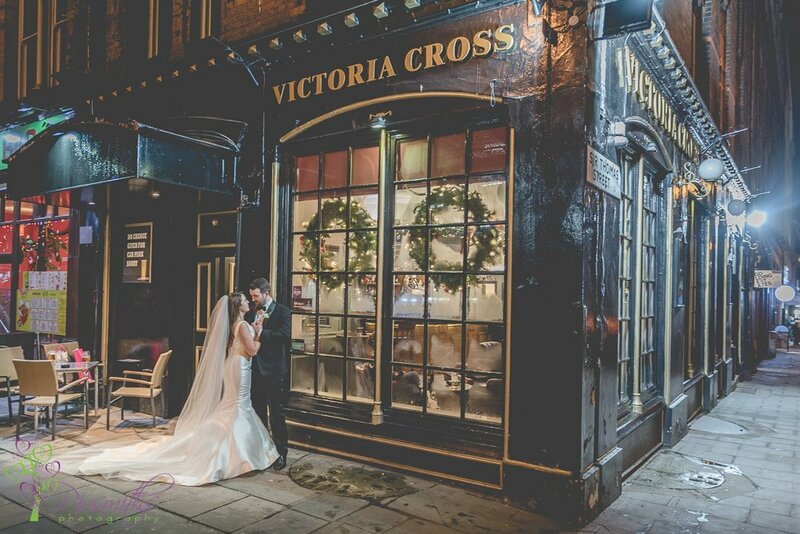 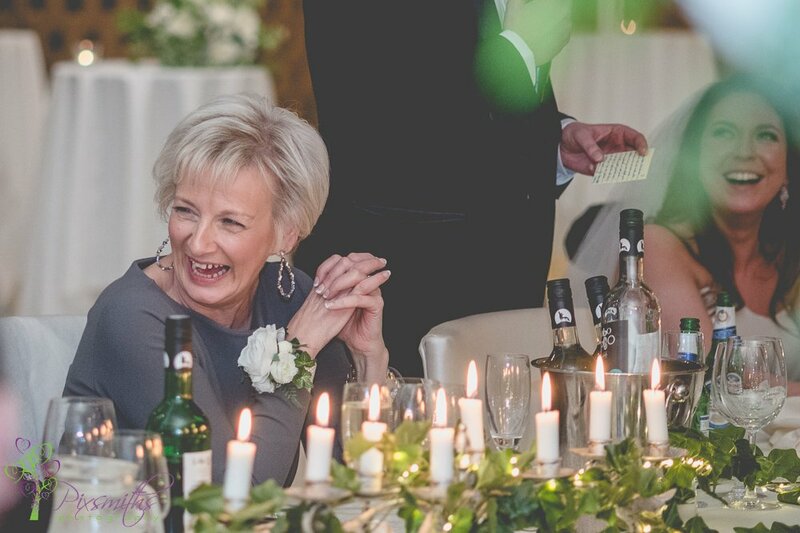 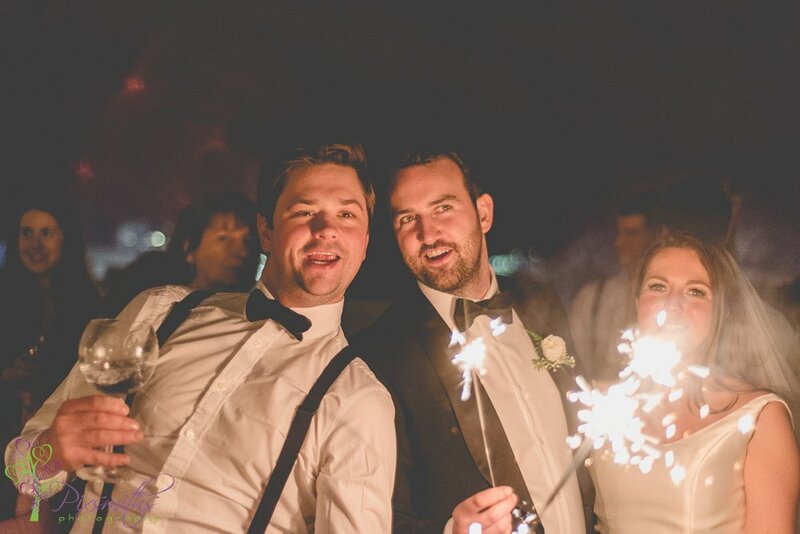 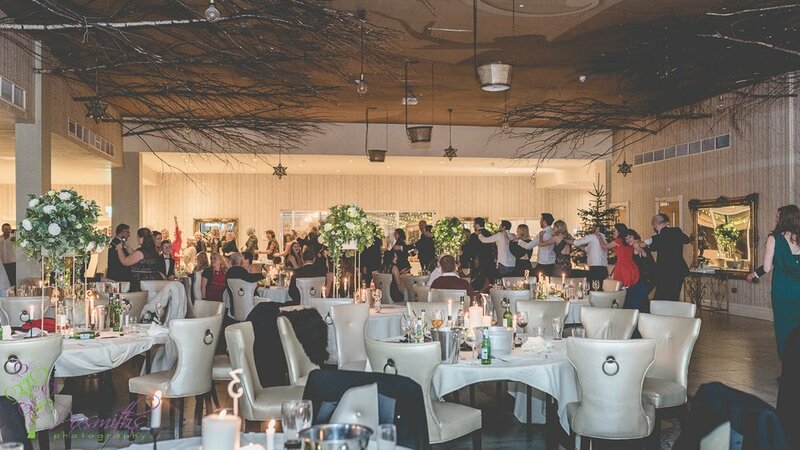 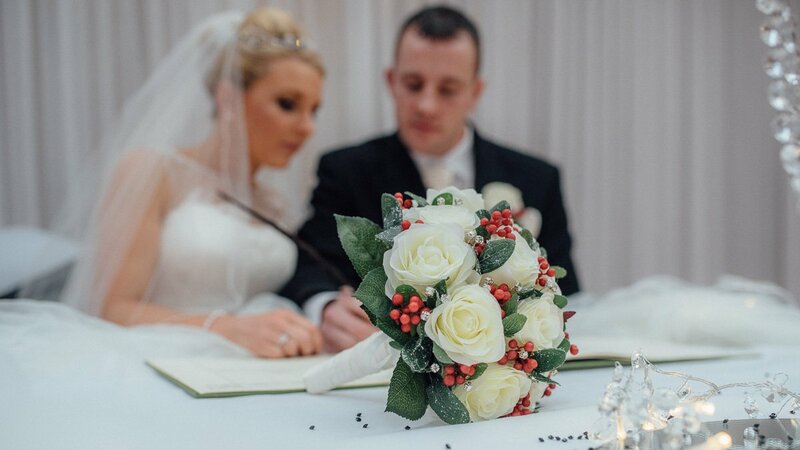 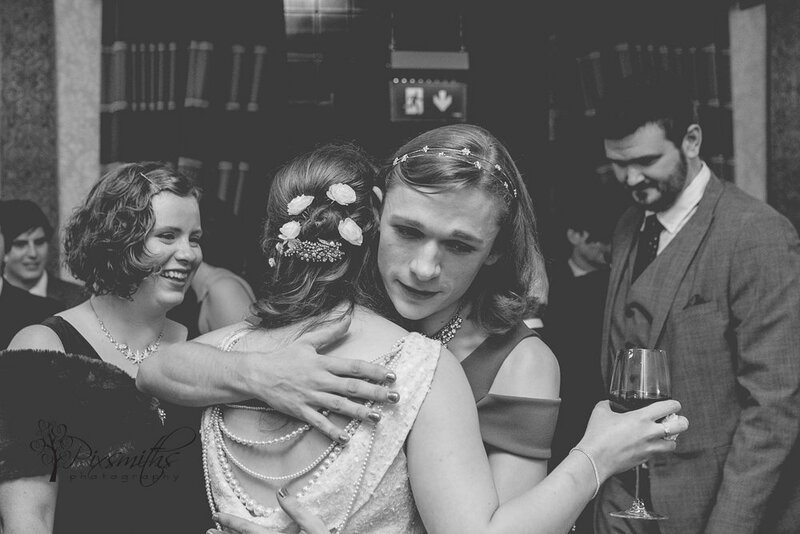 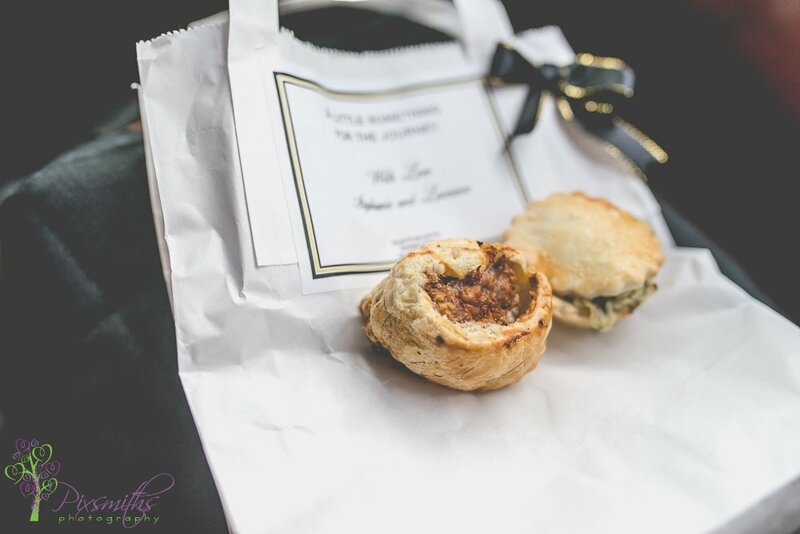 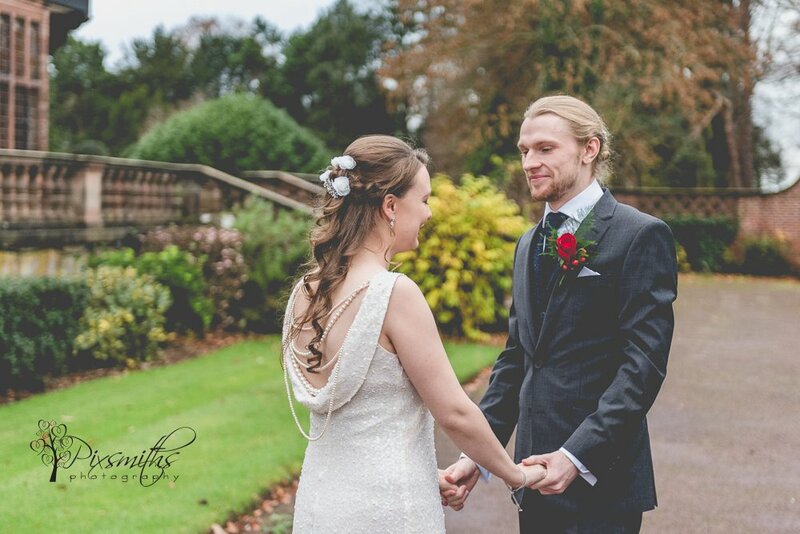 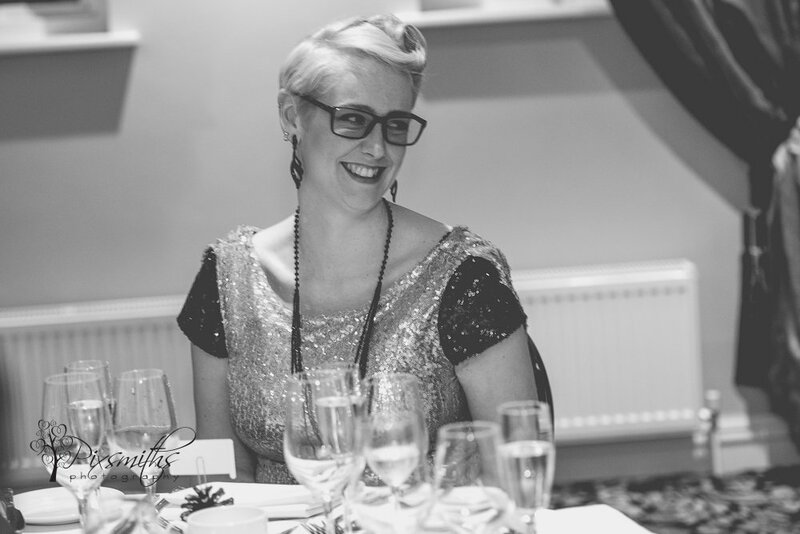 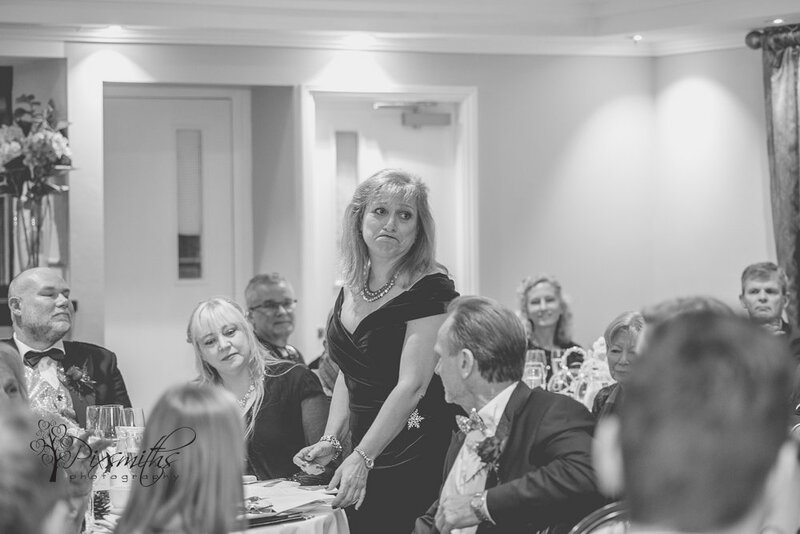 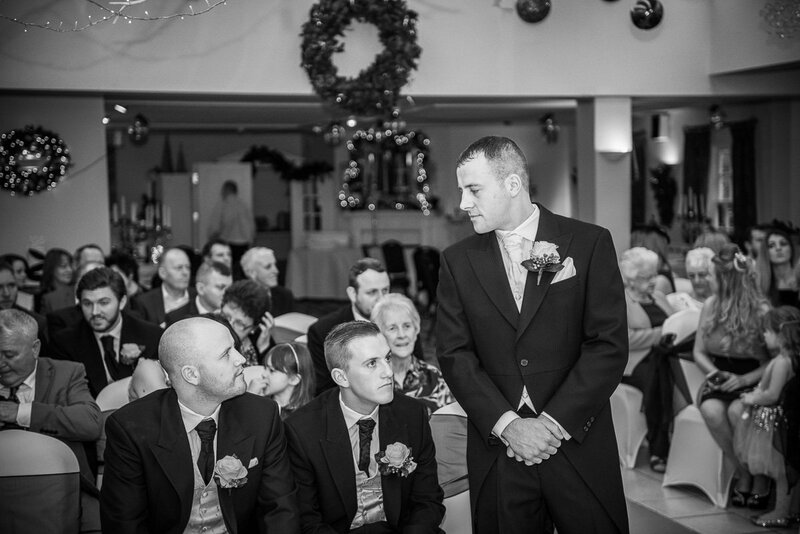 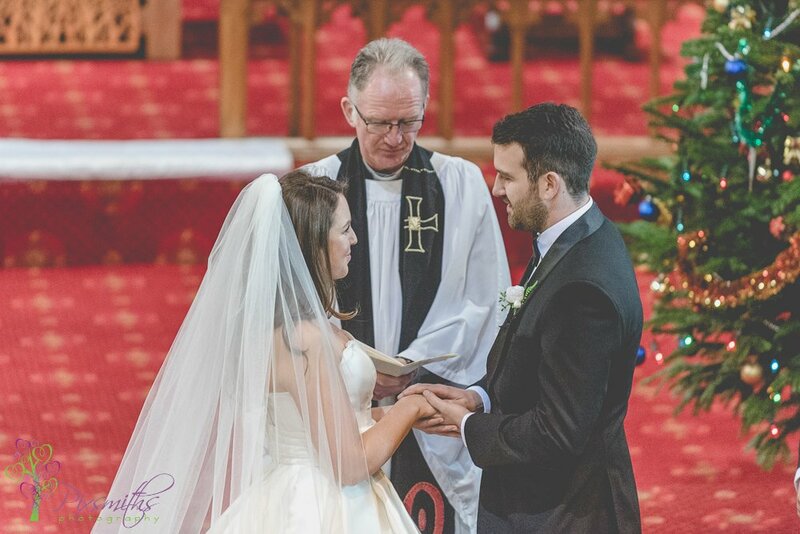 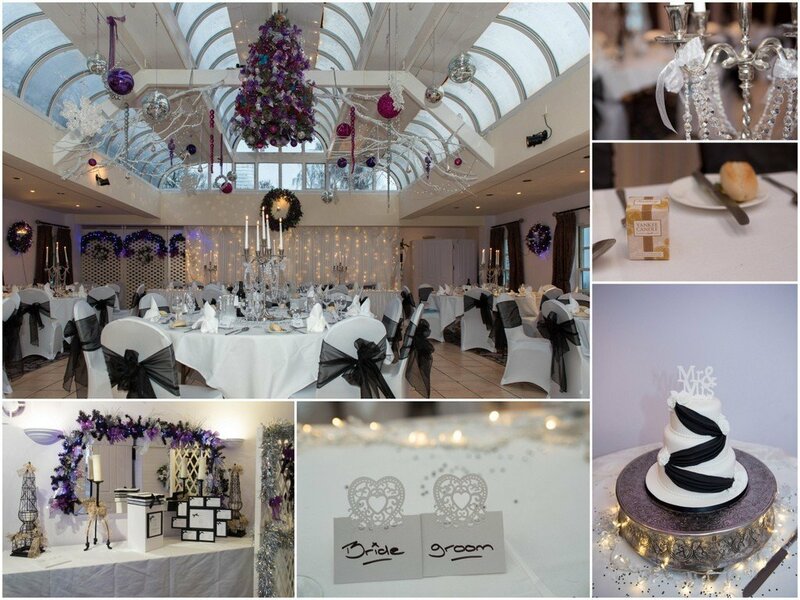 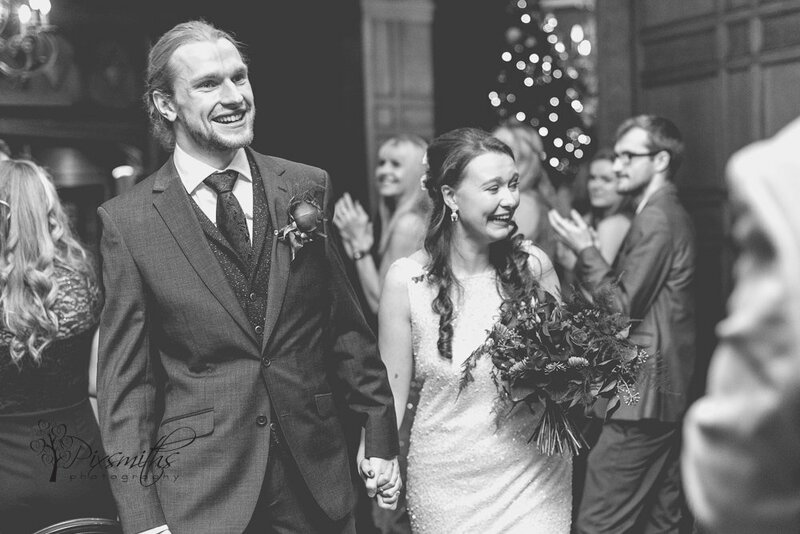 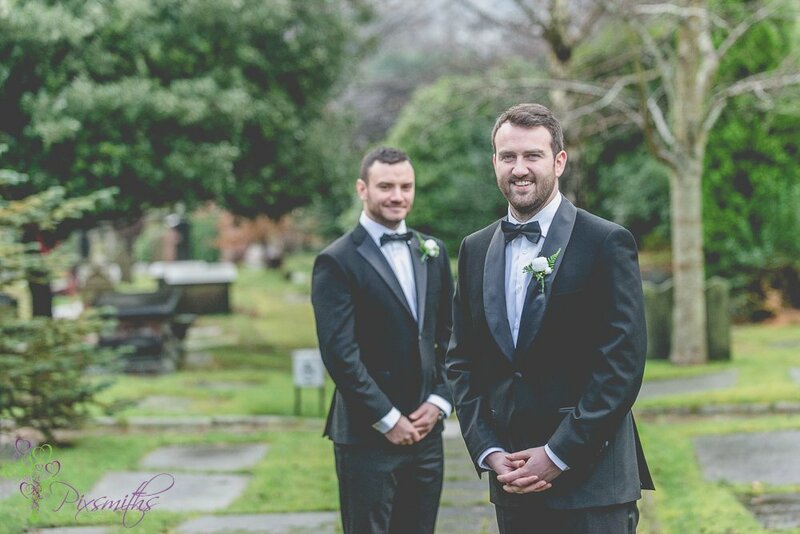 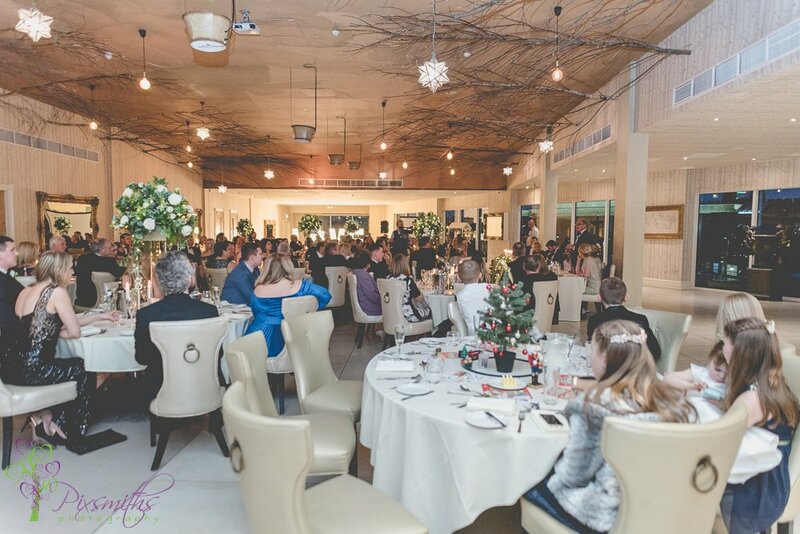 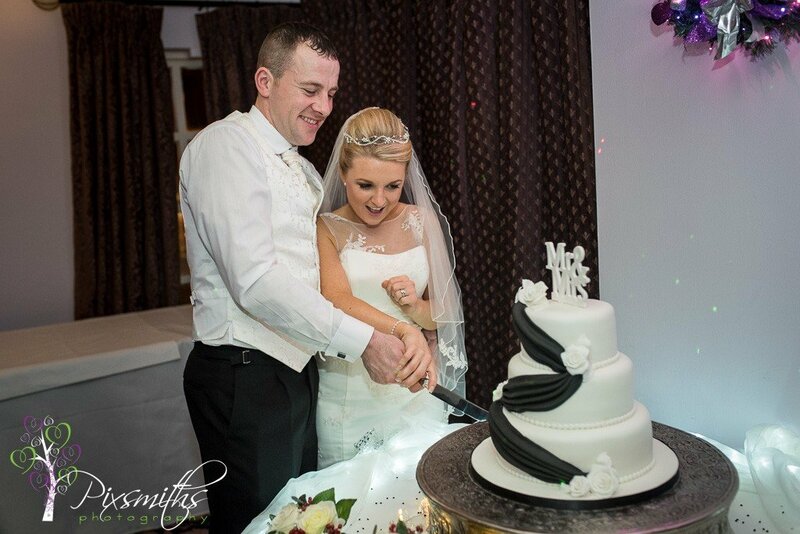 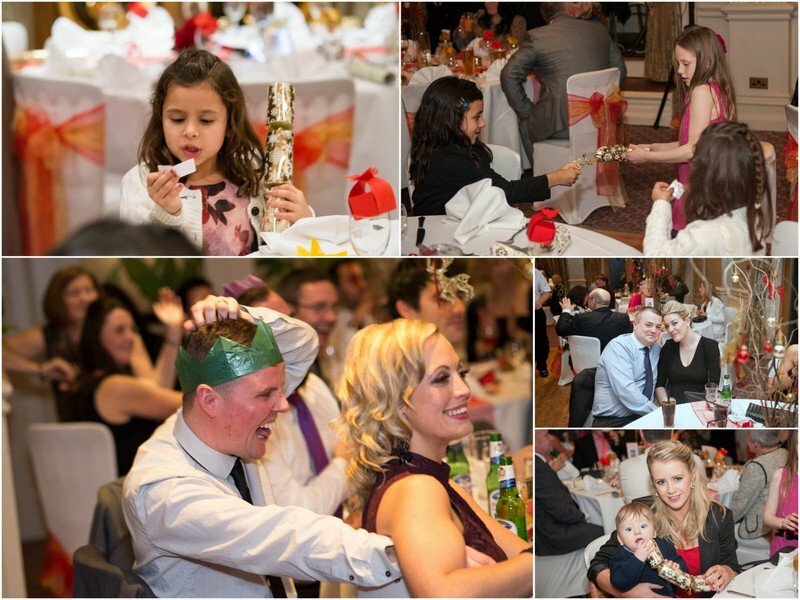 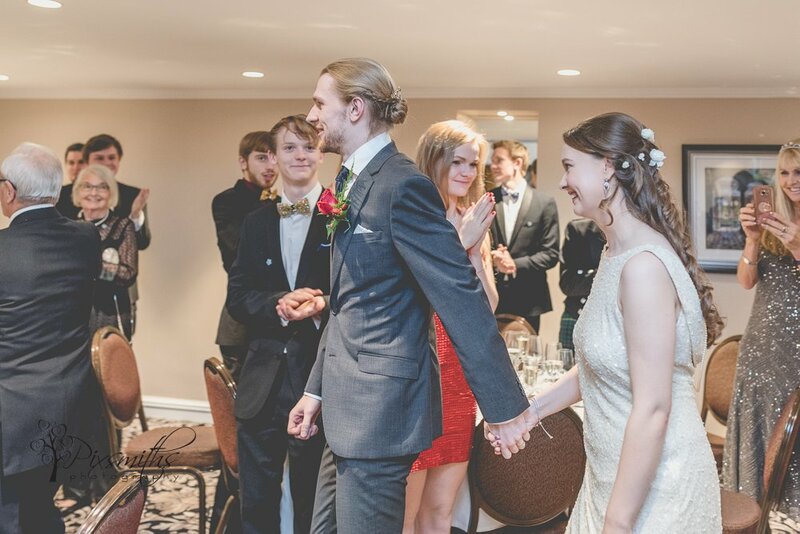 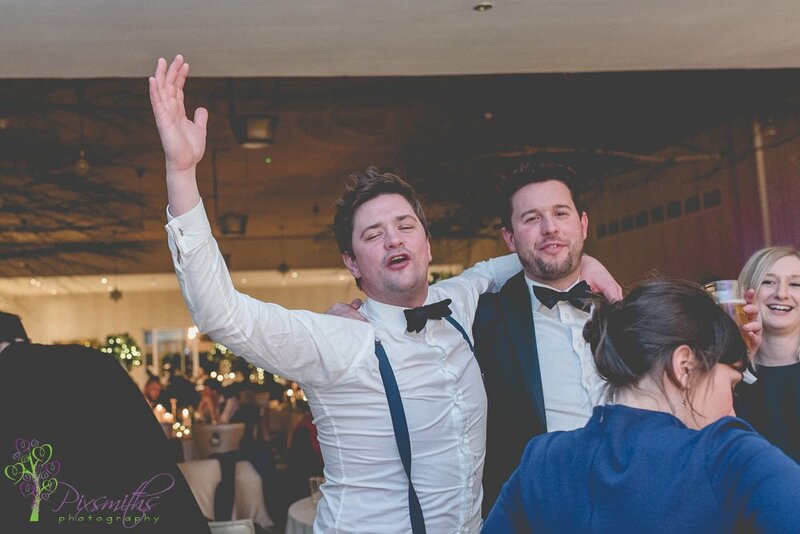 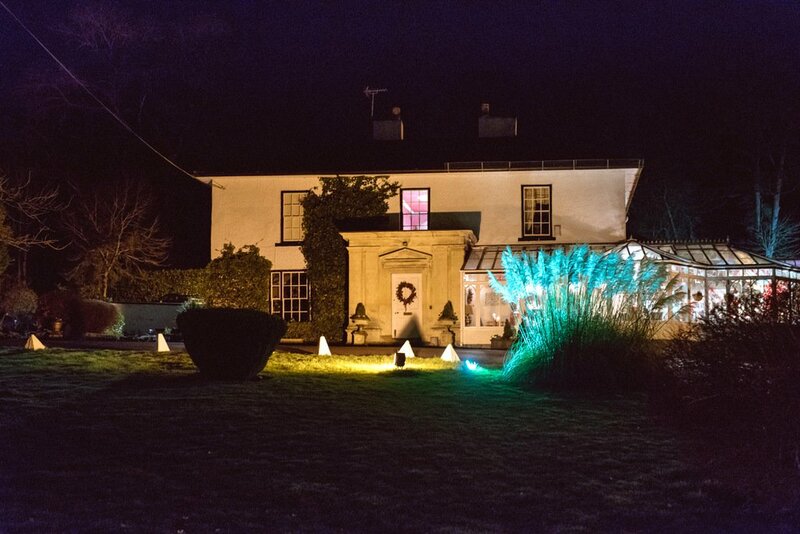 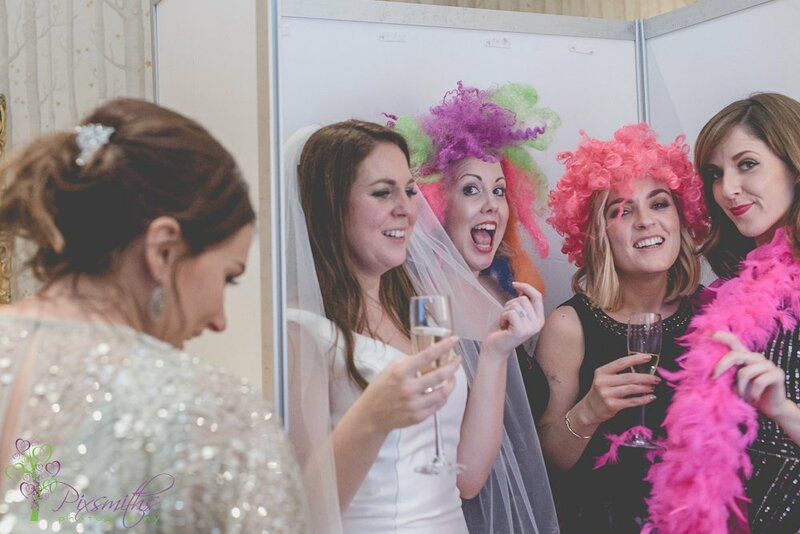 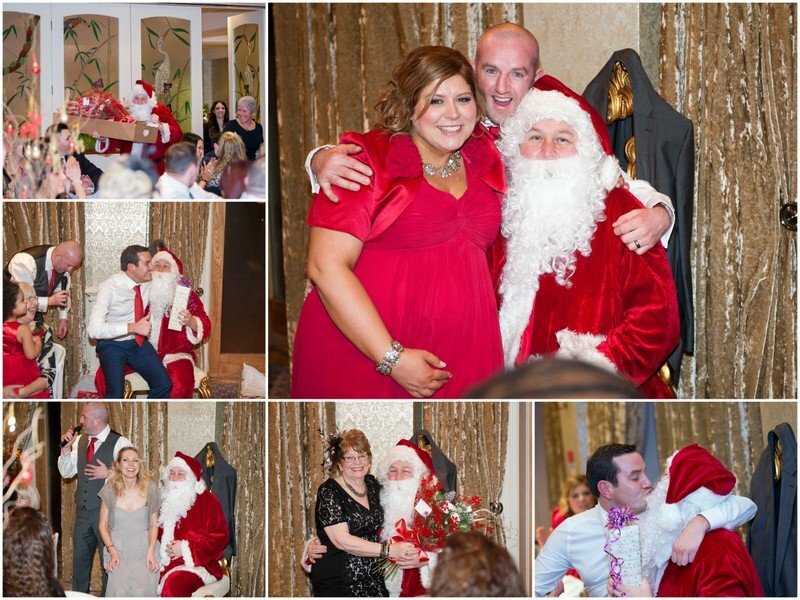 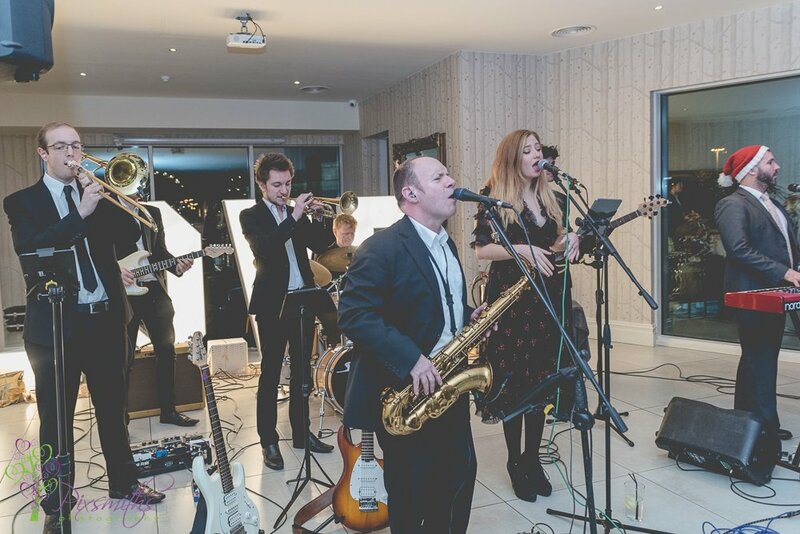 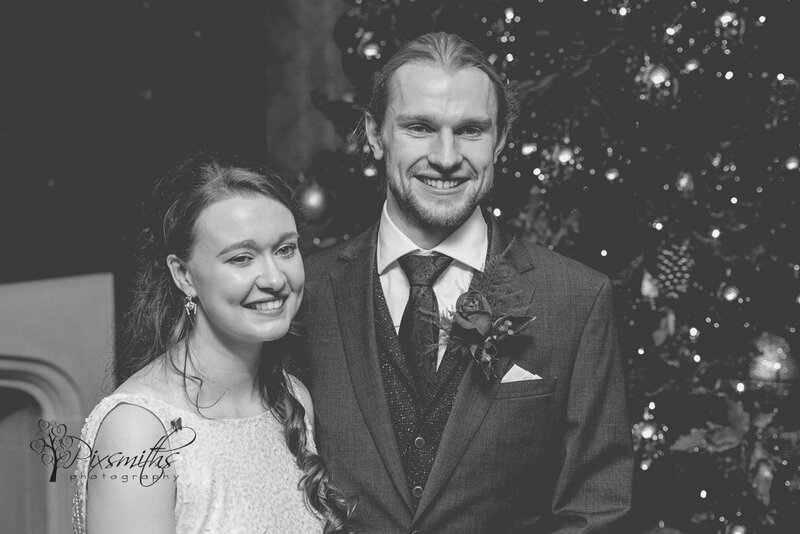 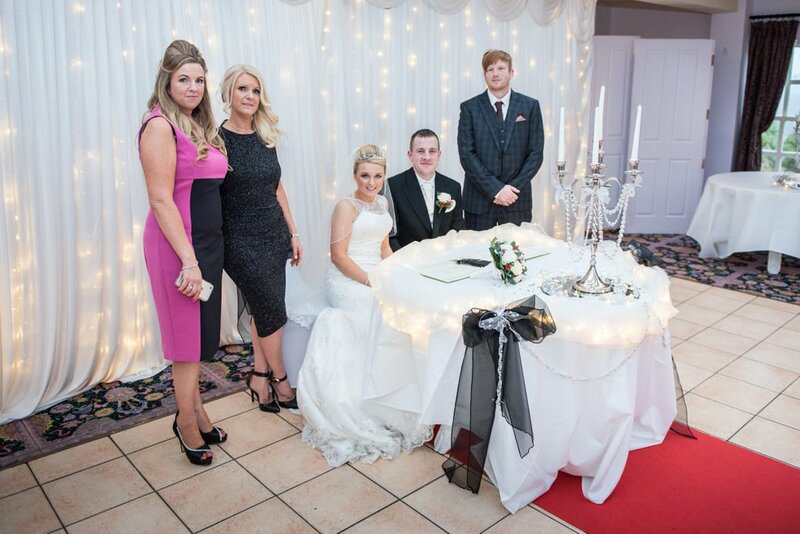 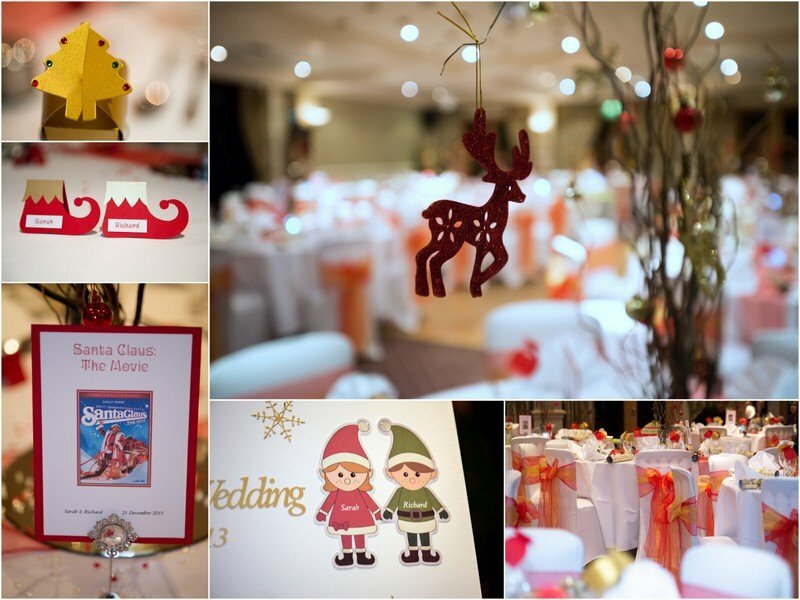 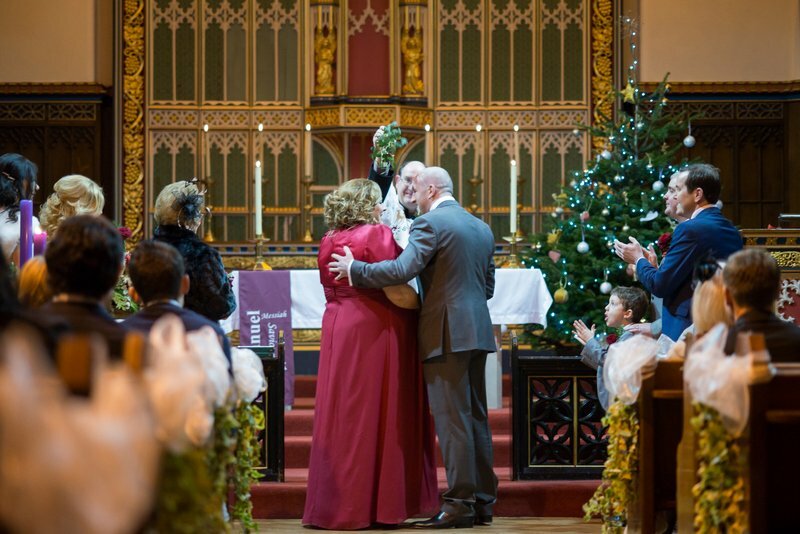 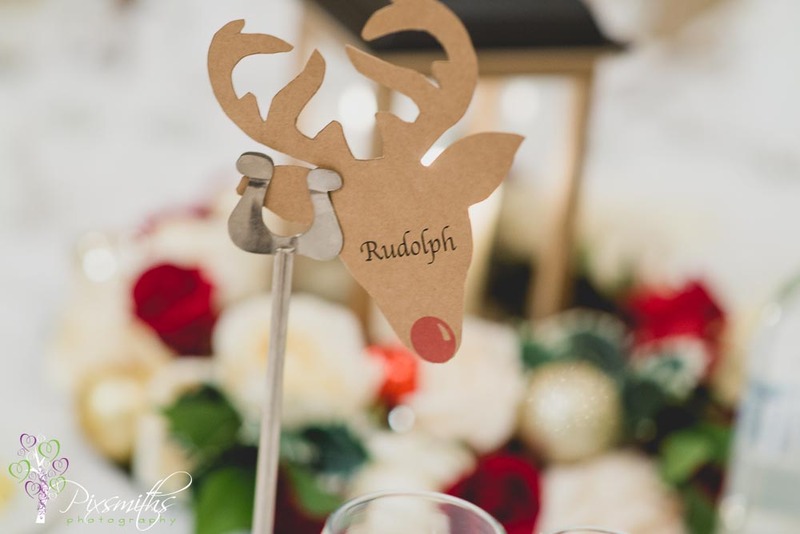 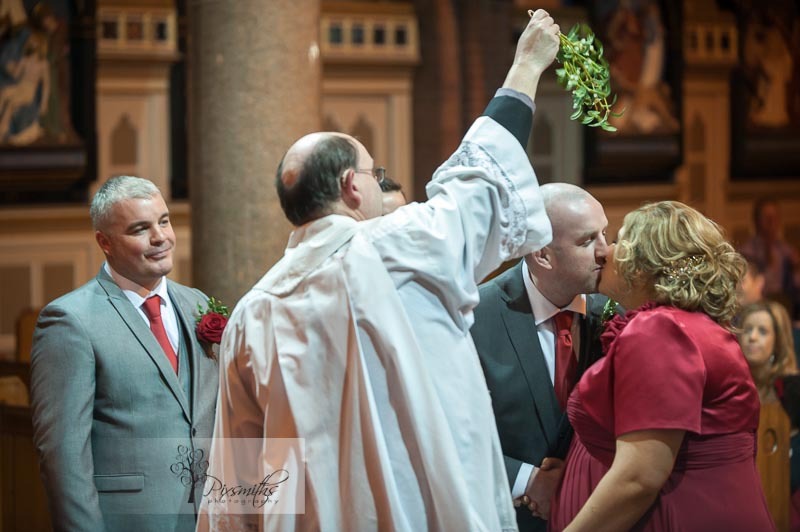 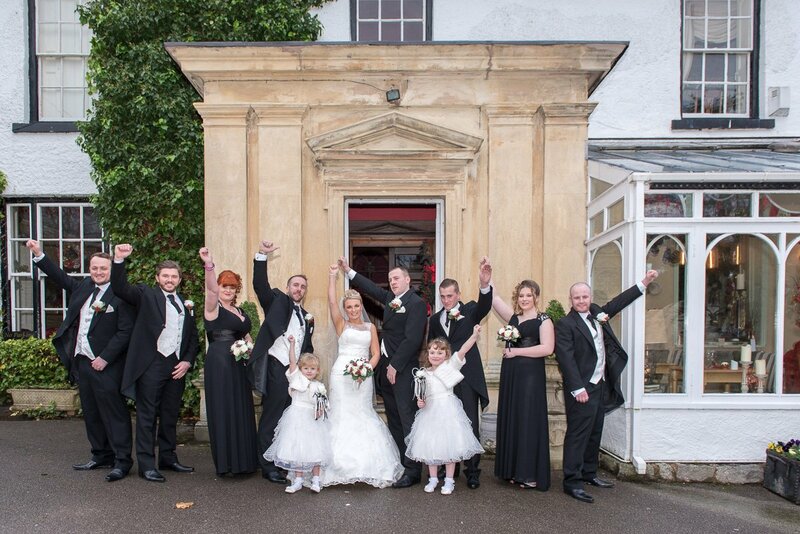 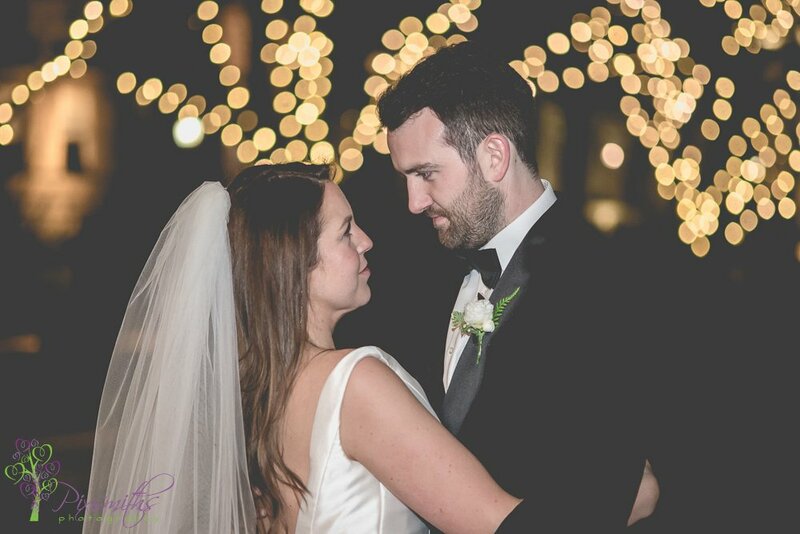 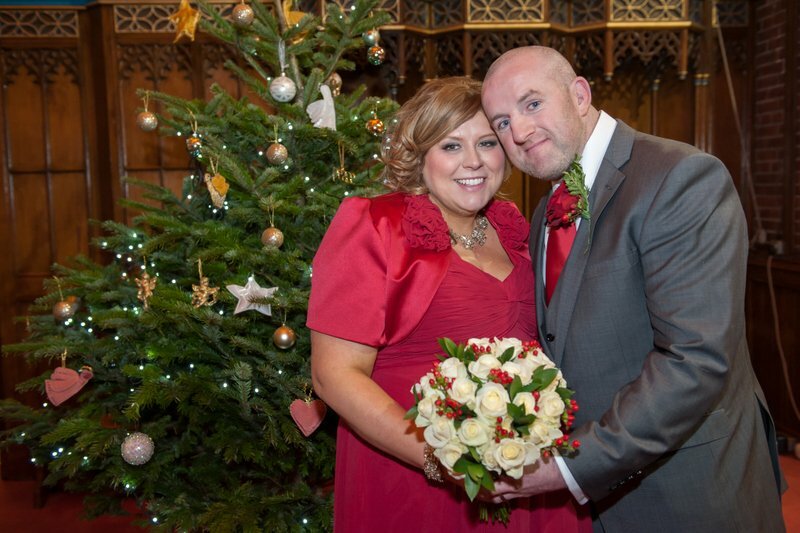 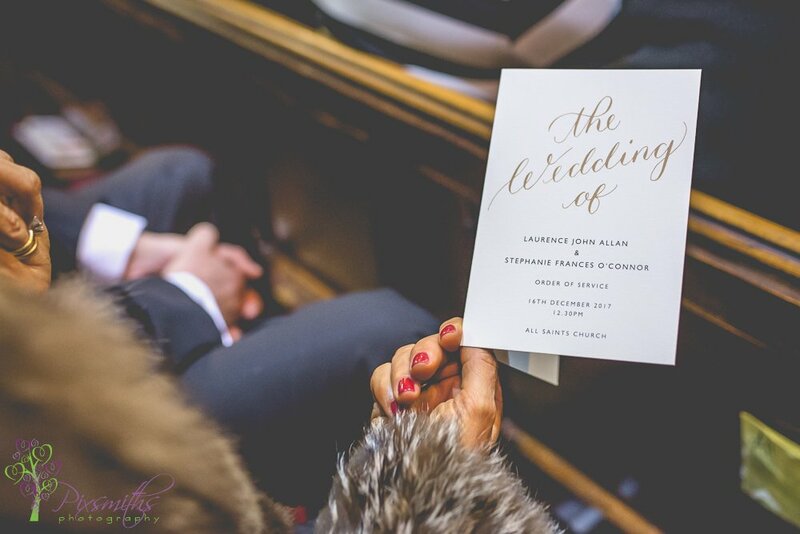 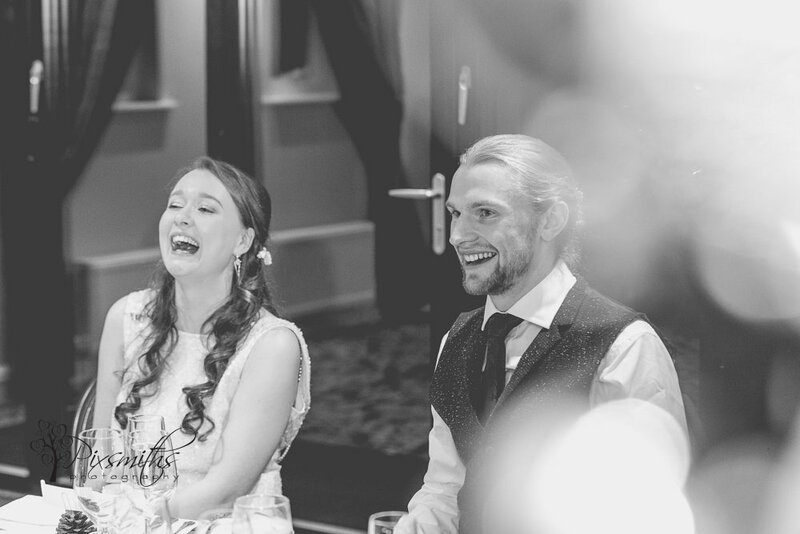 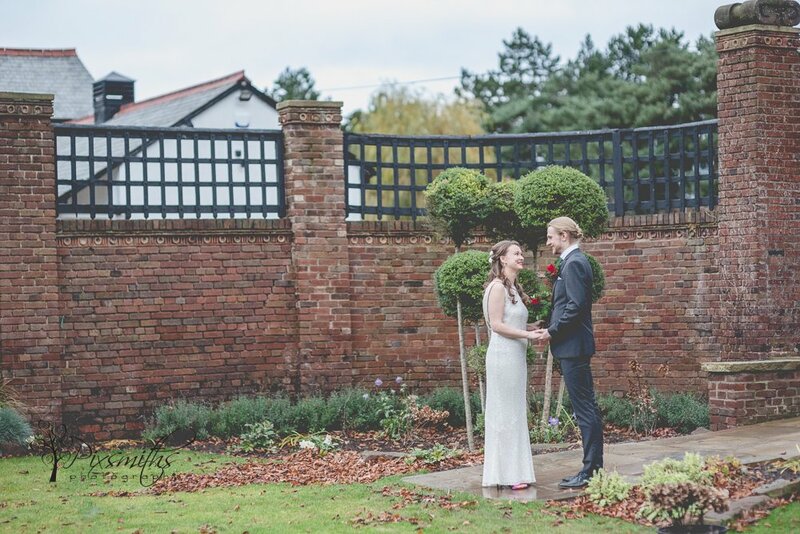 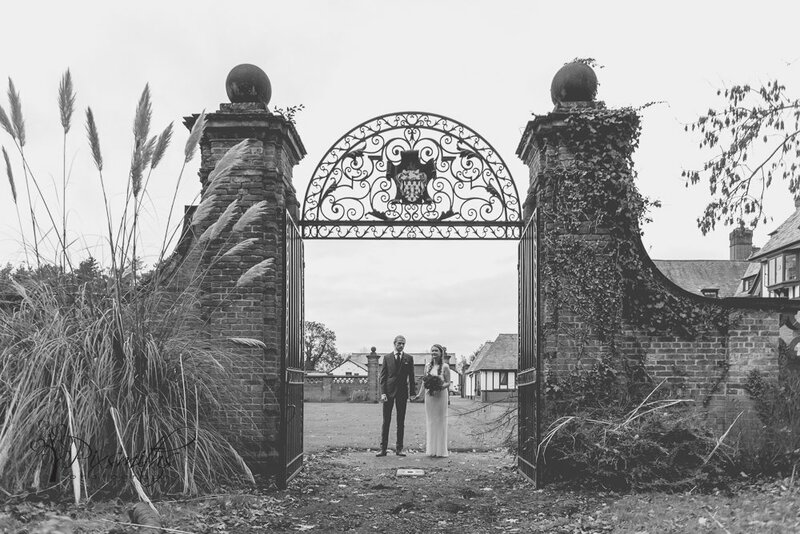 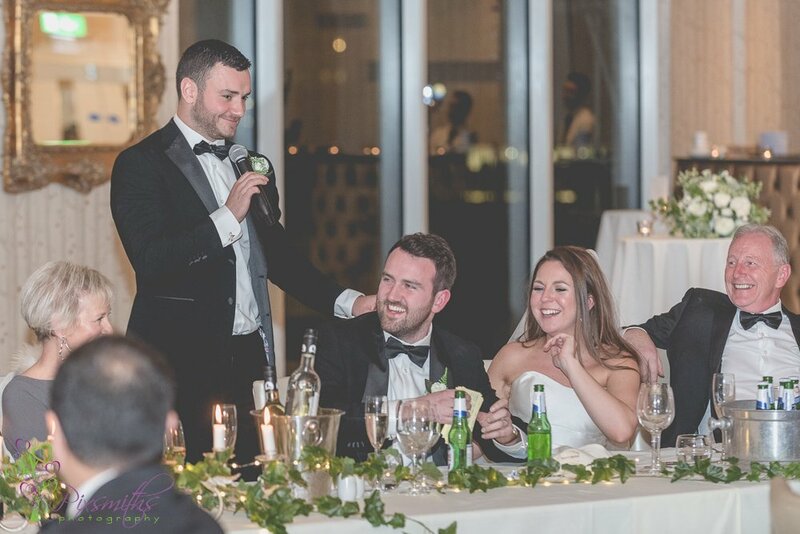 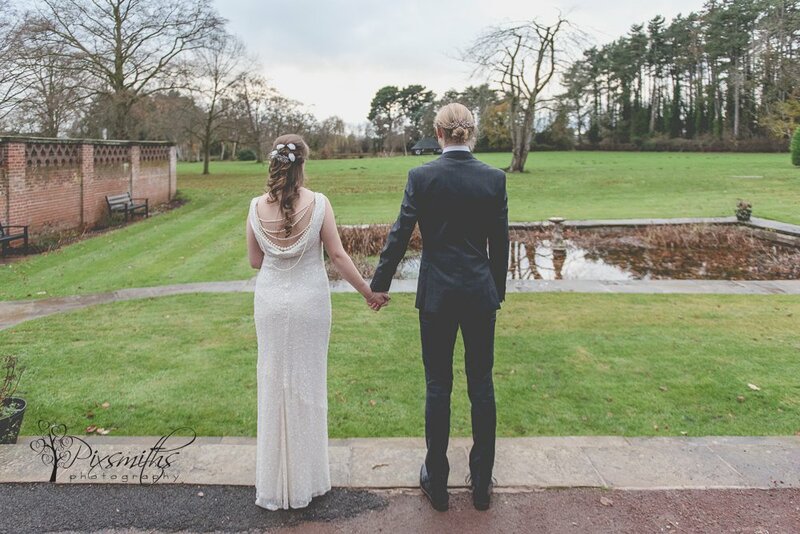 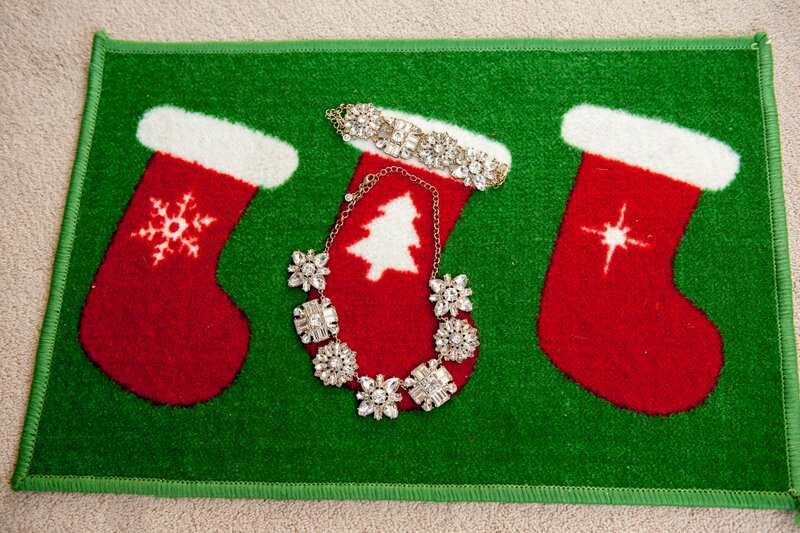 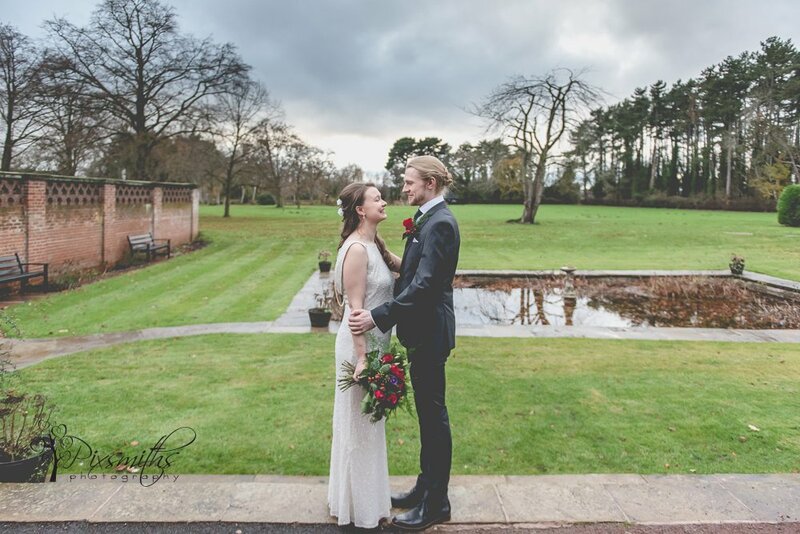 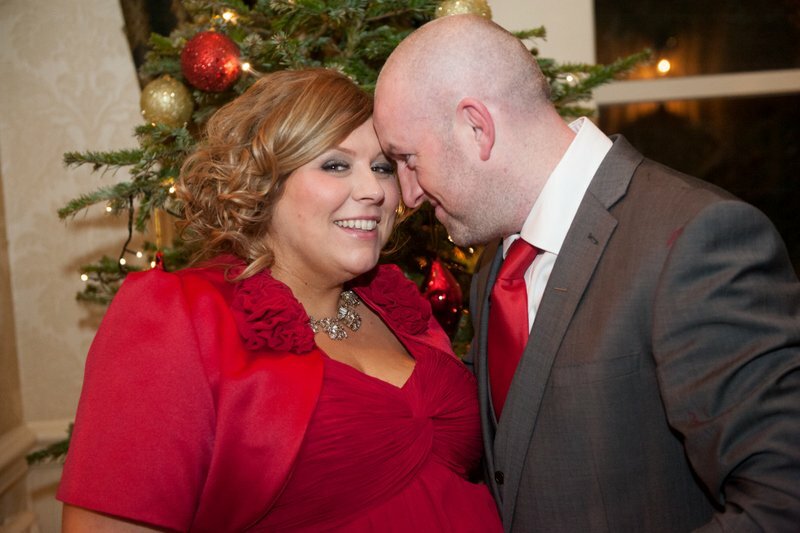 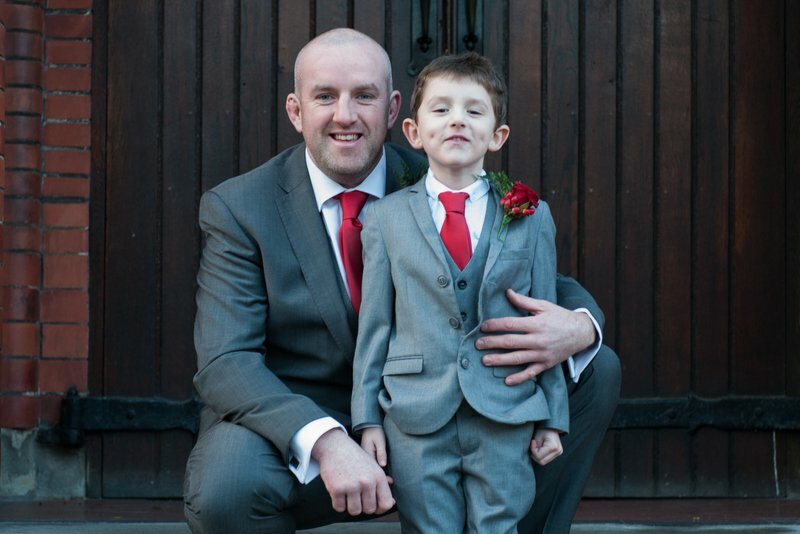 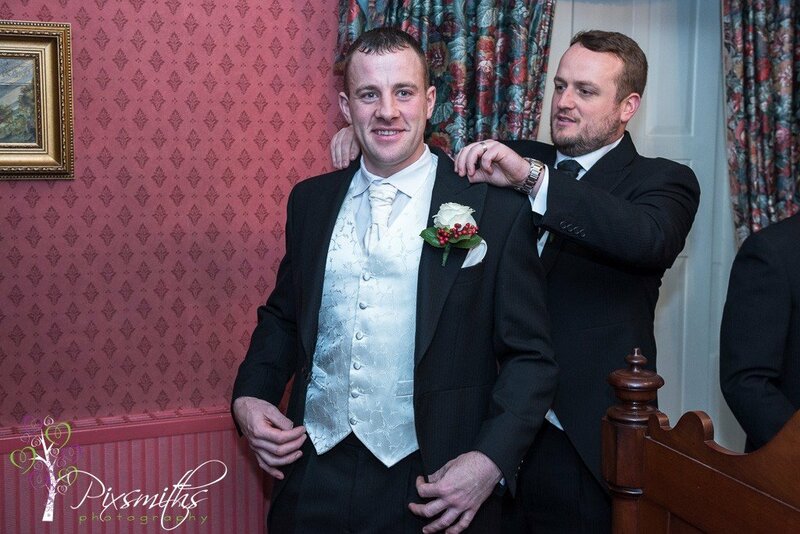 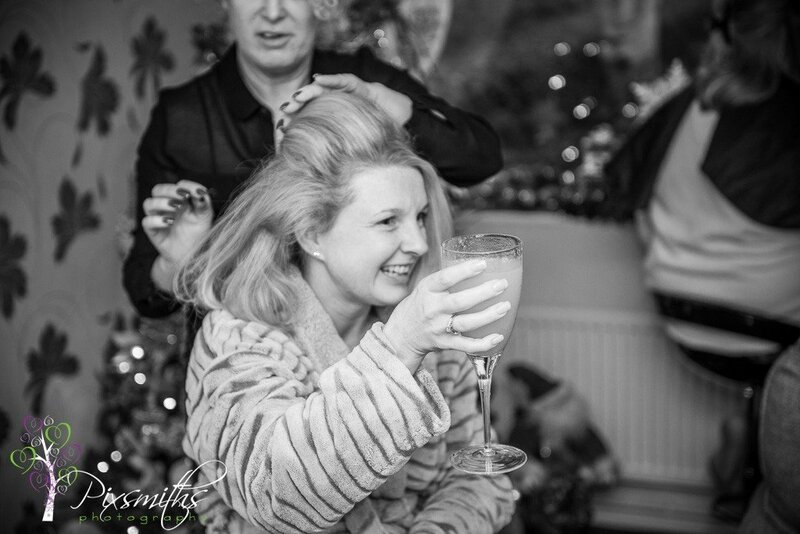 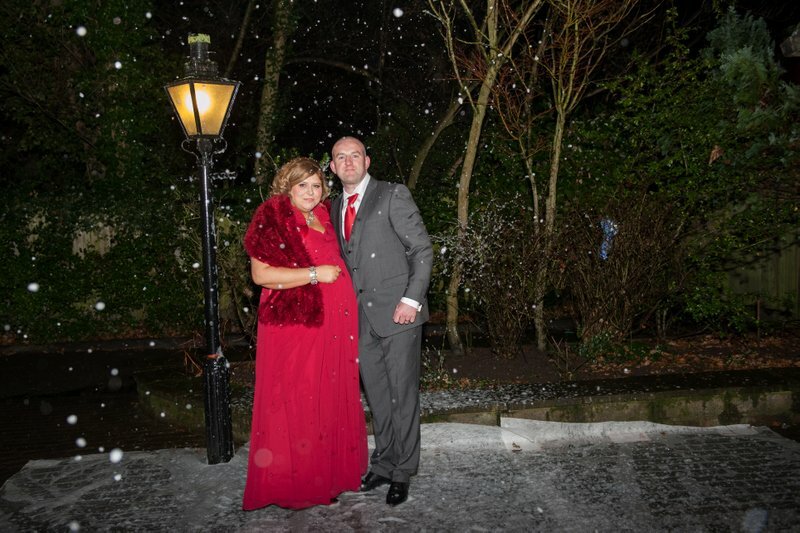 A mid December wedding with Christmas as the theme and a black tie event…with lots of fun! 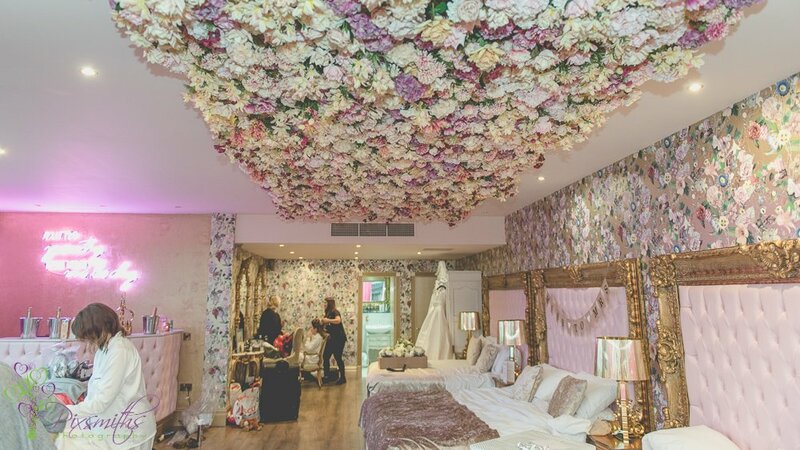 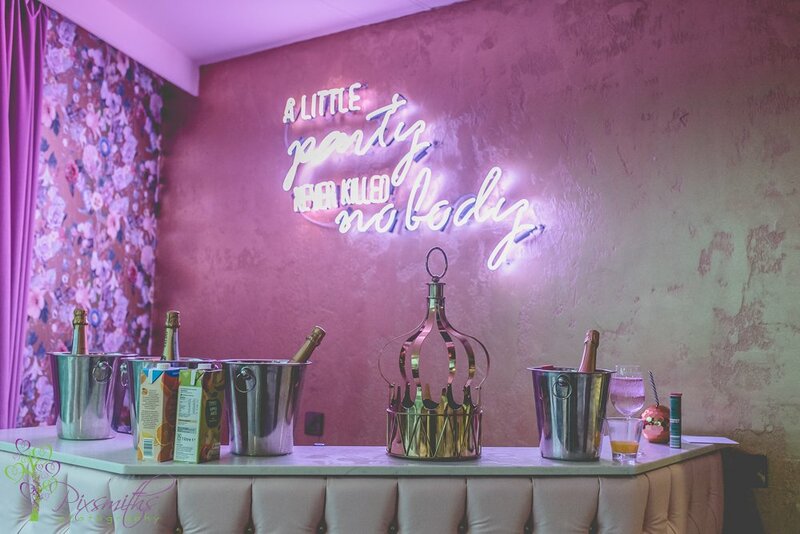 – wow all those beds and flowered ceiling plus its own bar and dressing area. 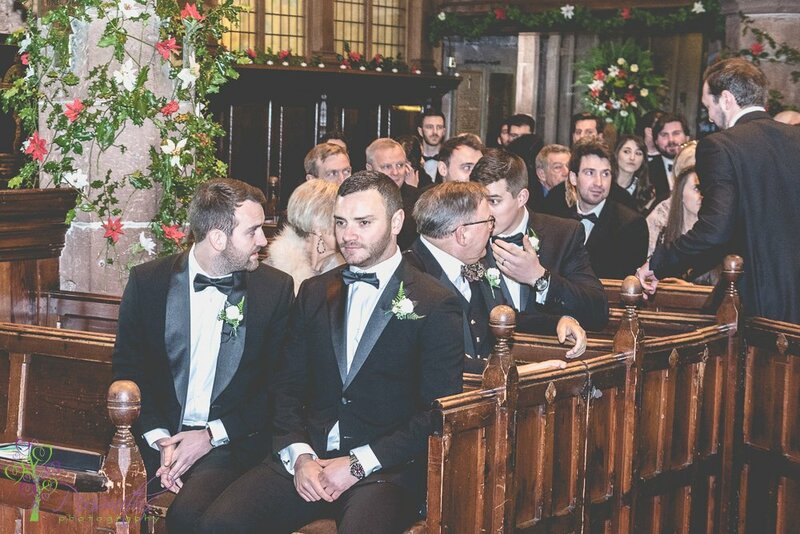 The Men’s floor was a more sombre grey and room smaller ..well certainly for amount of men getting ready! 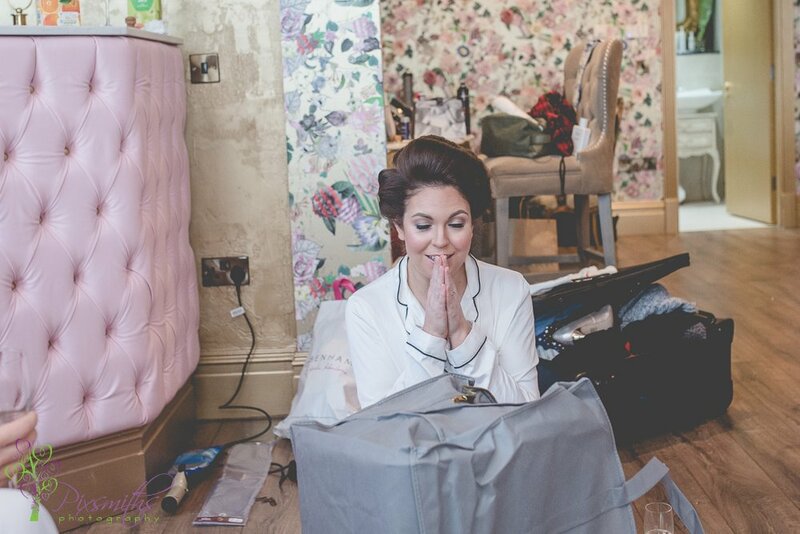 A lovely relaxed time for the preparations and capturing the reactions to the gifts sent to each other. 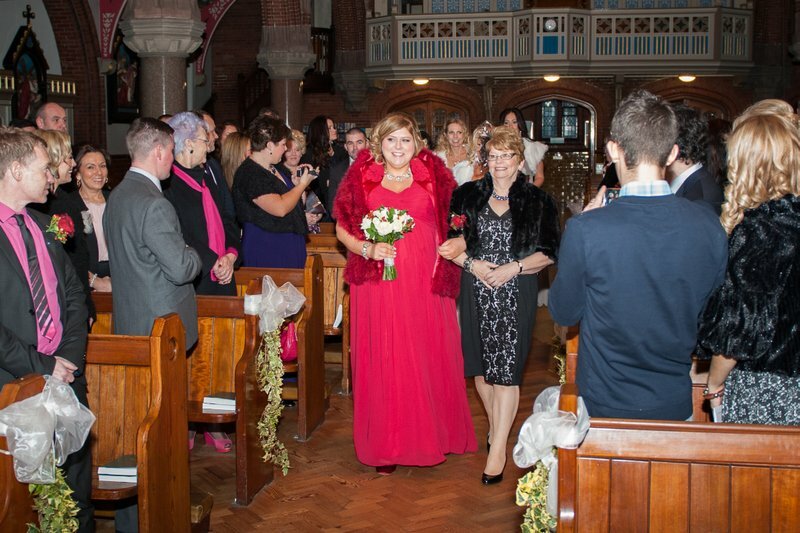 Soon it was time to head to the church for the ceremony at the family church of All saints at Childwall. 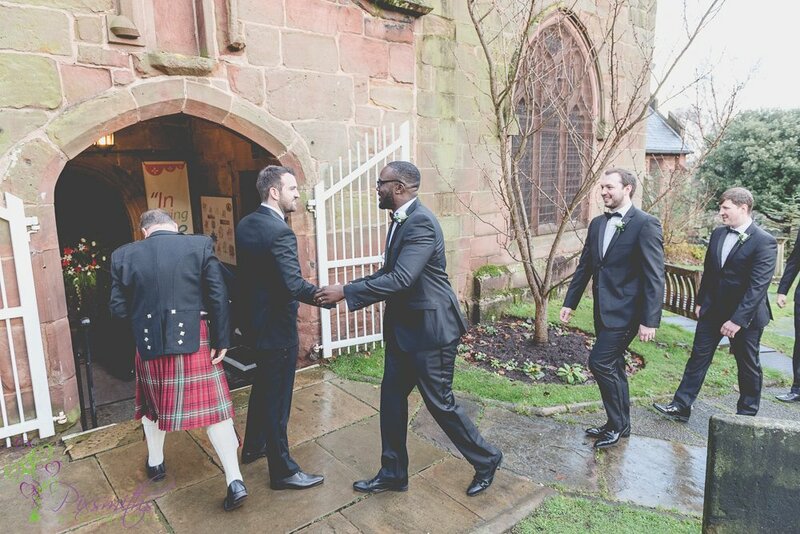 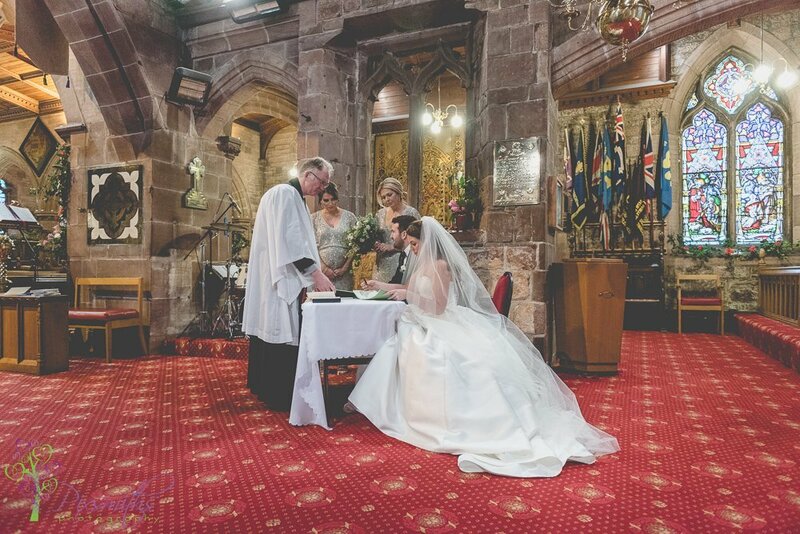 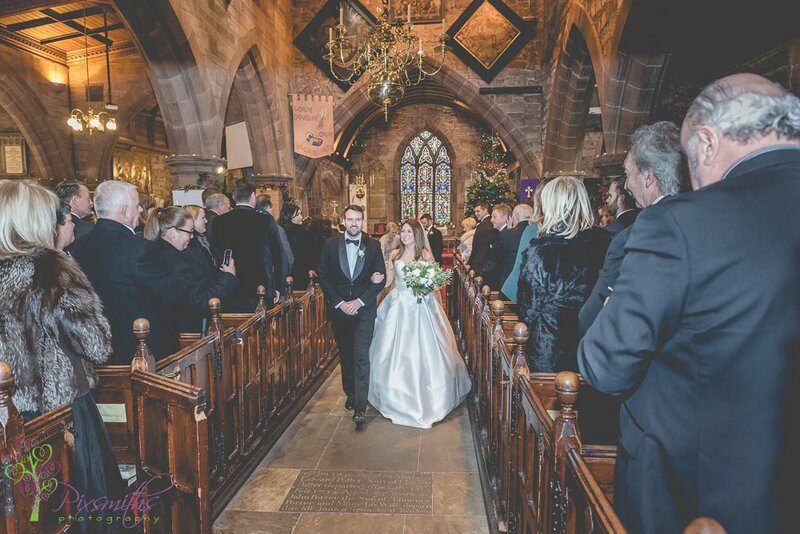 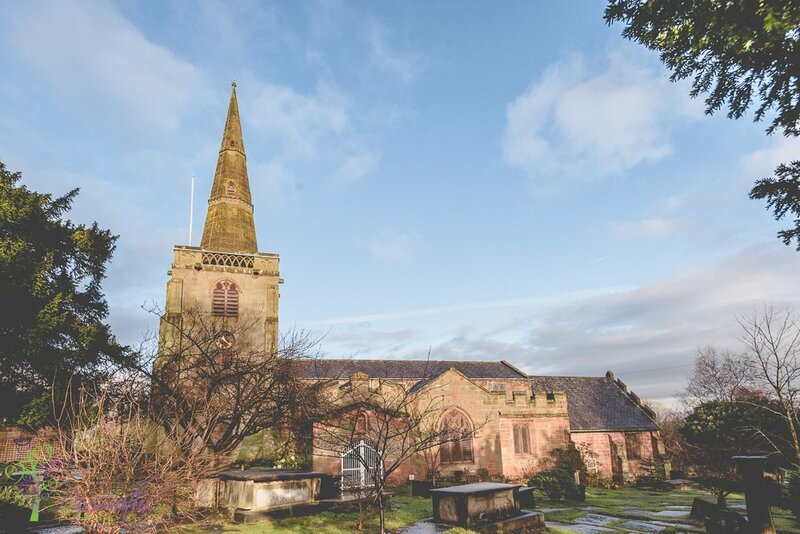 We had shot a previous winter wedding at All Saints and it was delightful to be back at this beautiful Grade I listed building,the only medieval church remaining in the Metropolitan borough of Liverpool. 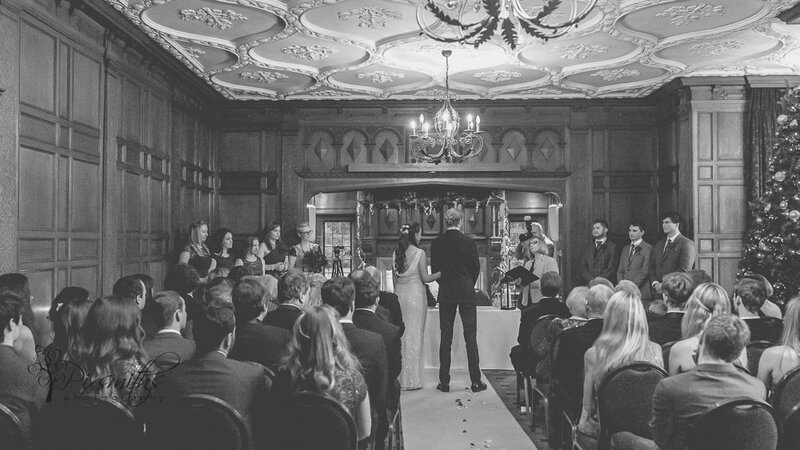 A beautiful ceremony. 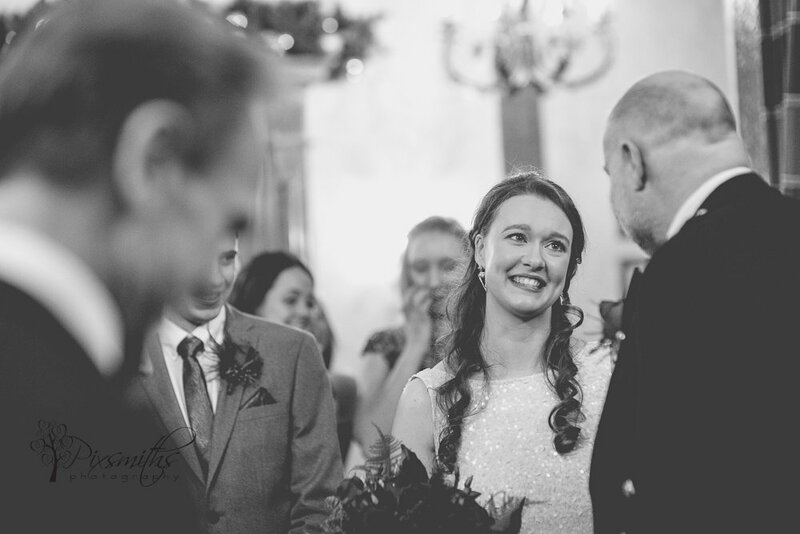 Stephanie looked radiant as she entered to her waiting Laurence. 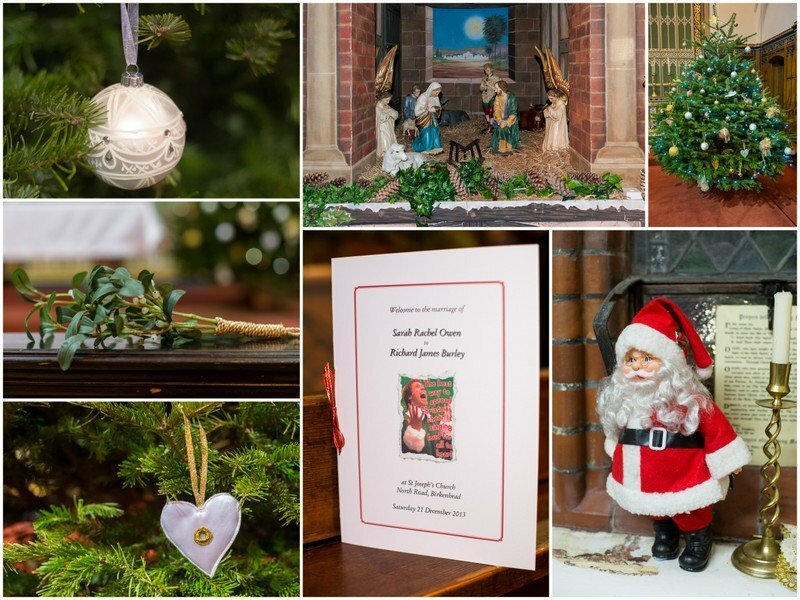 We had carols and beautiful Welsh singing and a Christmas tree of course. 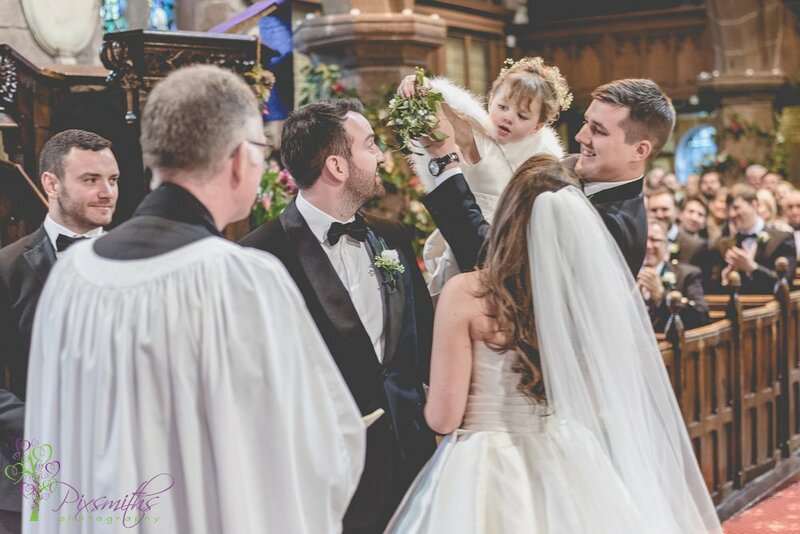 Mistletoe was held over the couple for the first kiss by the Stephanie’s cute flower girl niece. 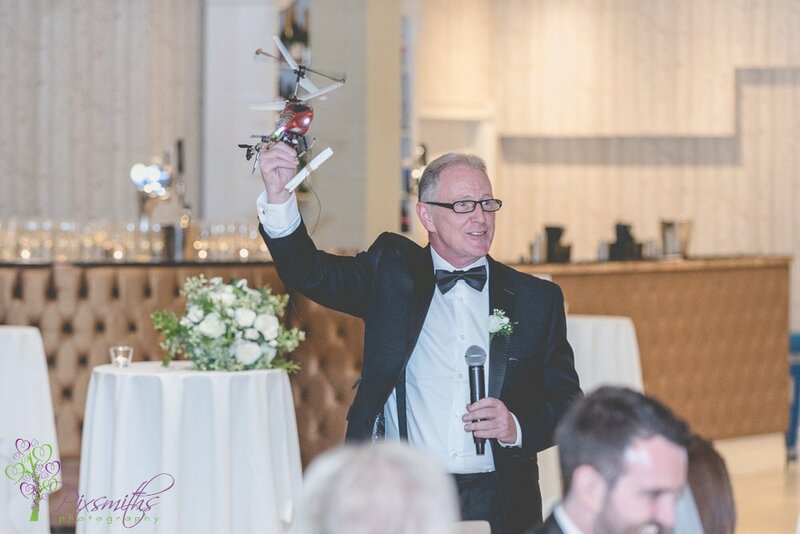 Delicious meal with speeches in between courses – we had helicopter and messages to our happy couple from sports personalities Michael Owen, Frankie Detorri and Didi Hamann. 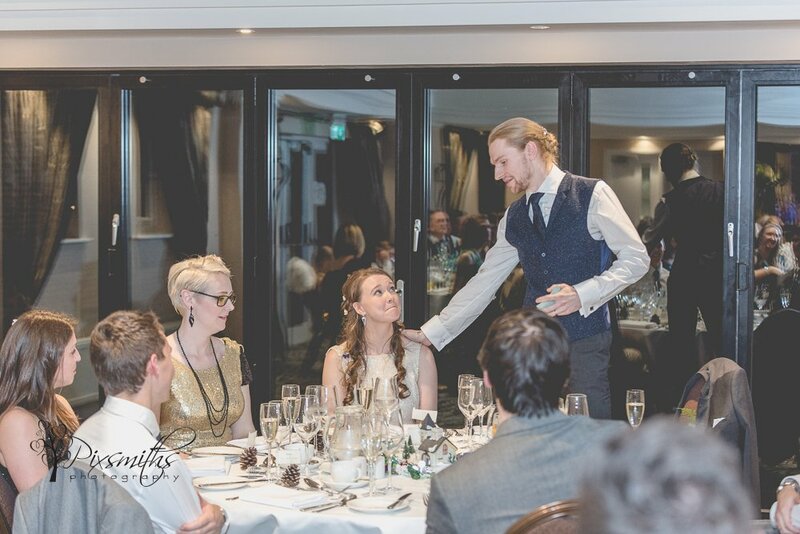 Totally captivated Stephanie and Laurence. 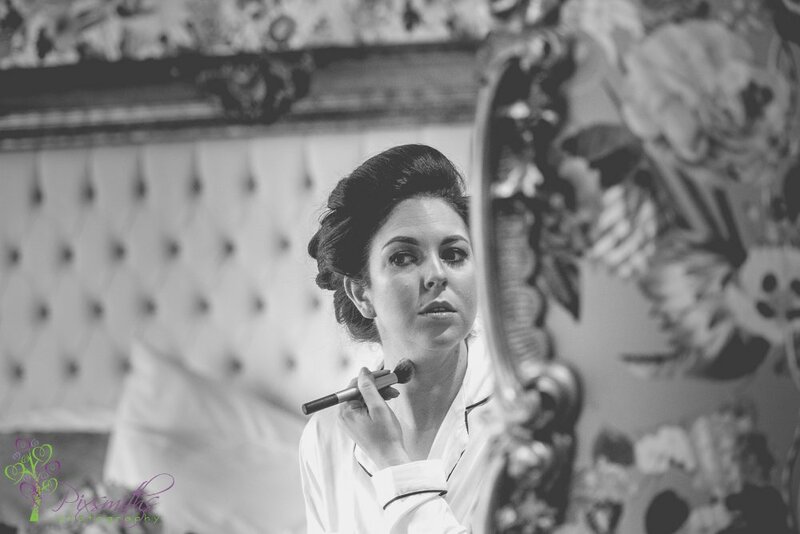 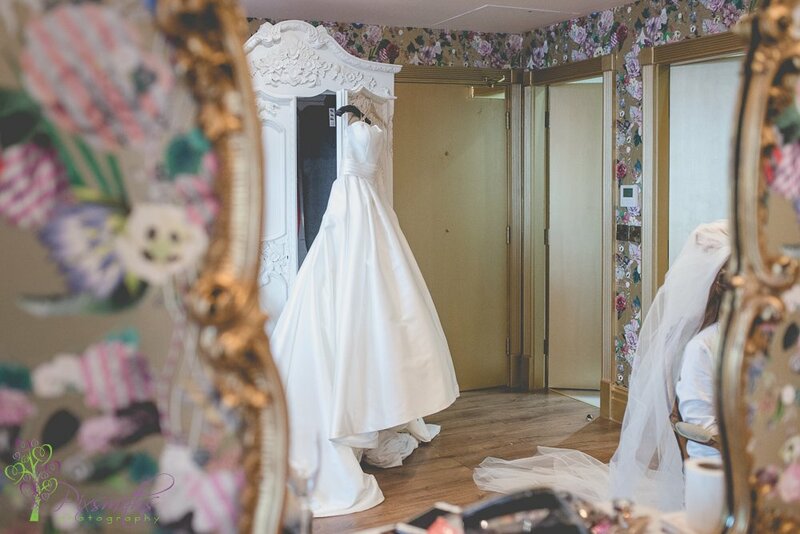 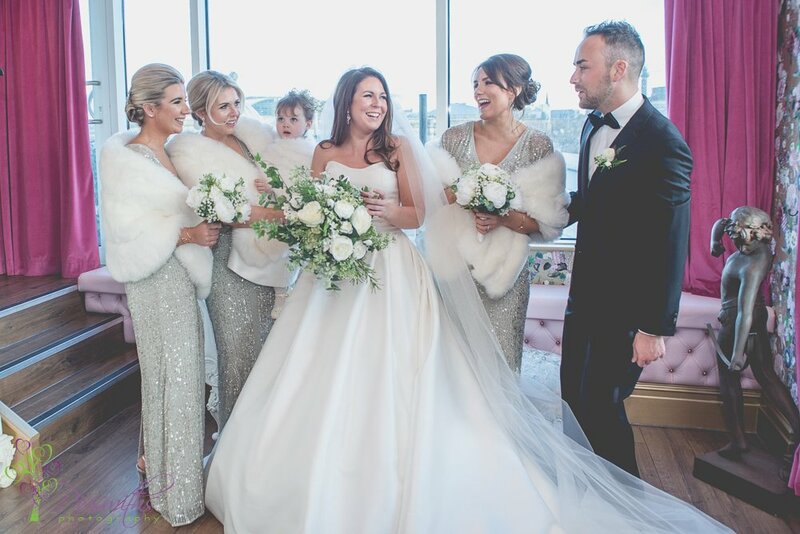 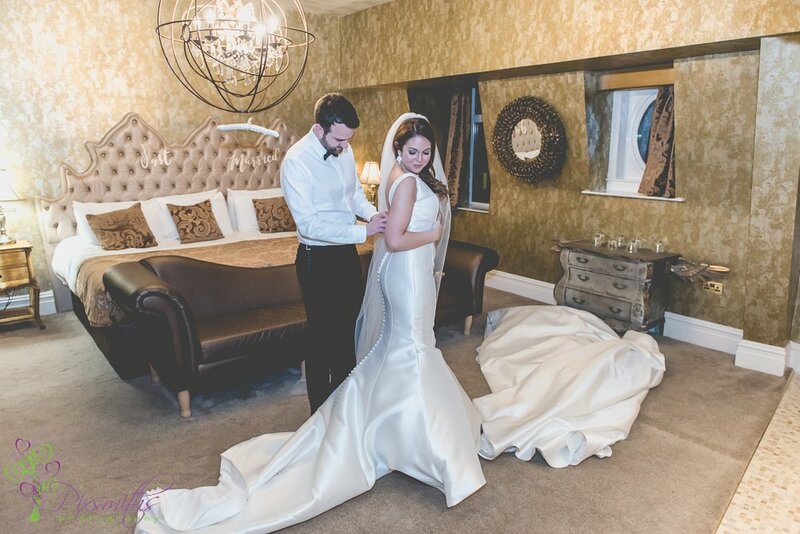 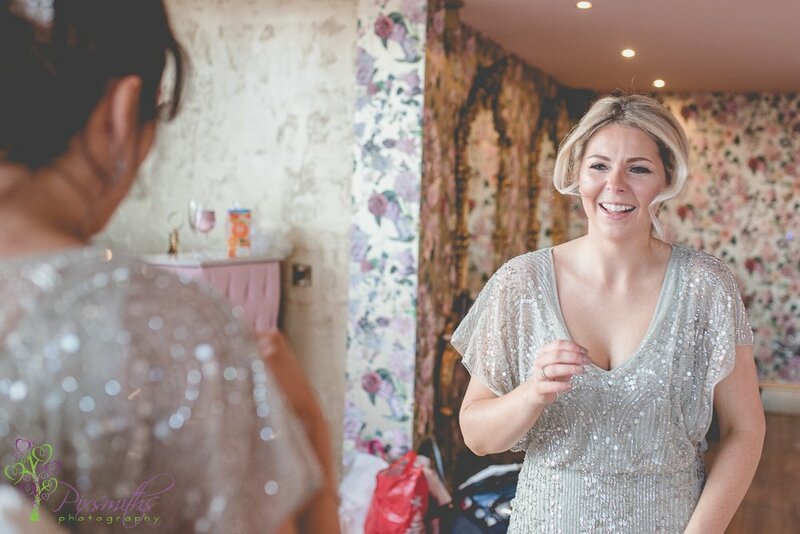 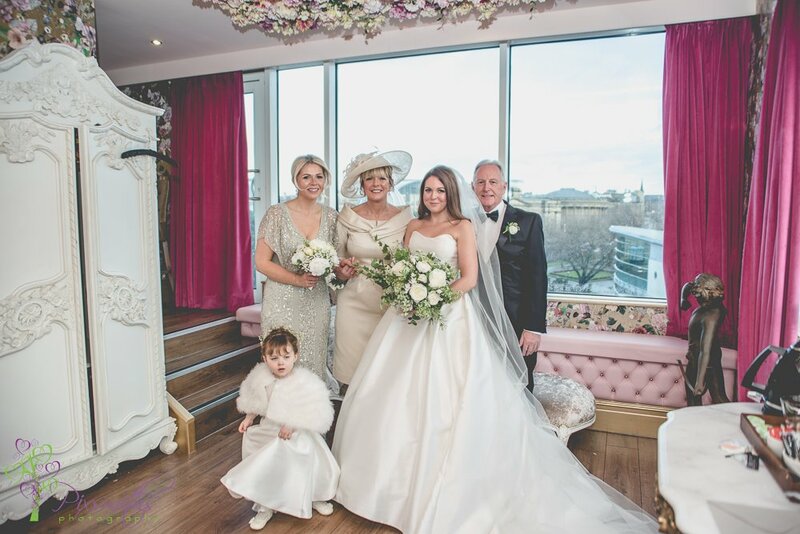 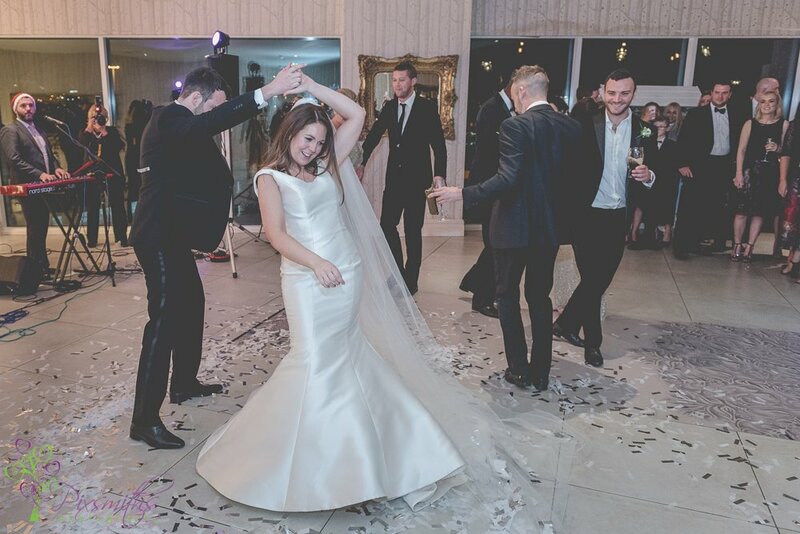 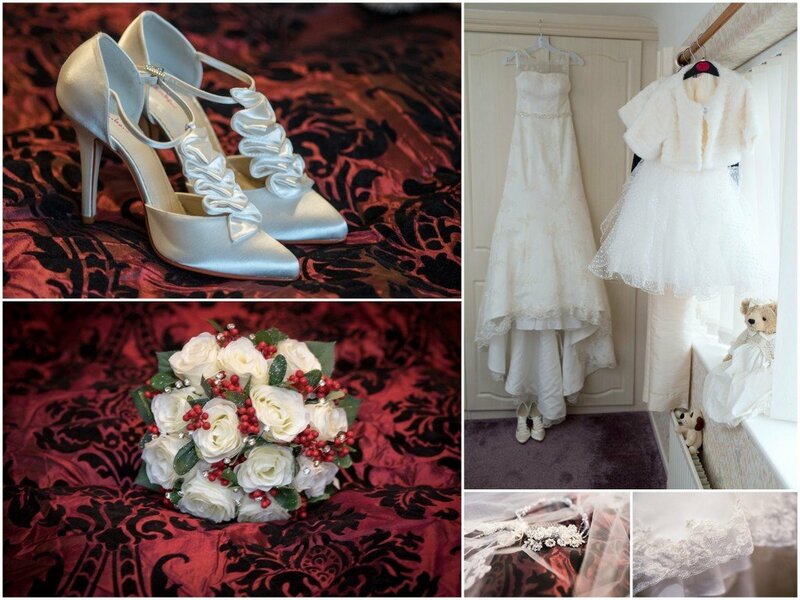 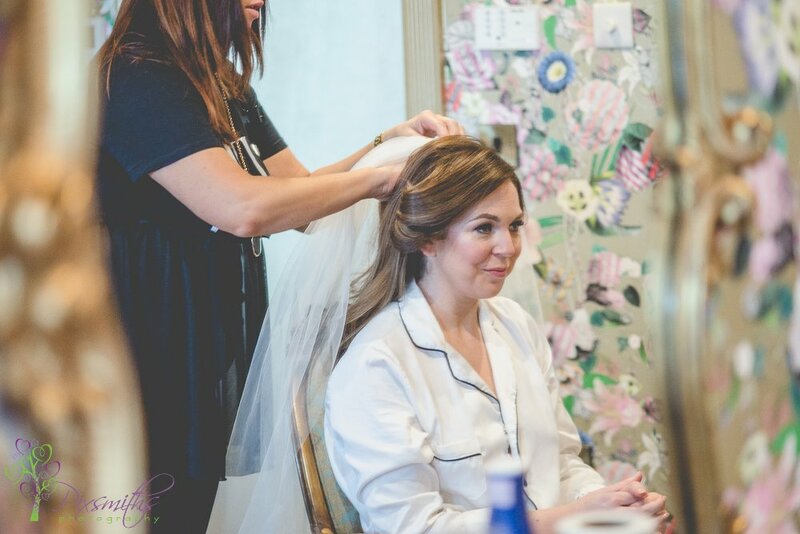 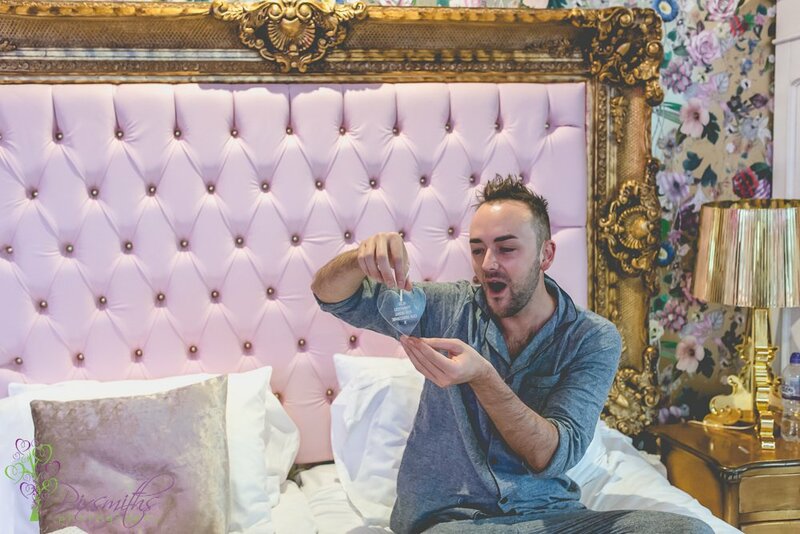 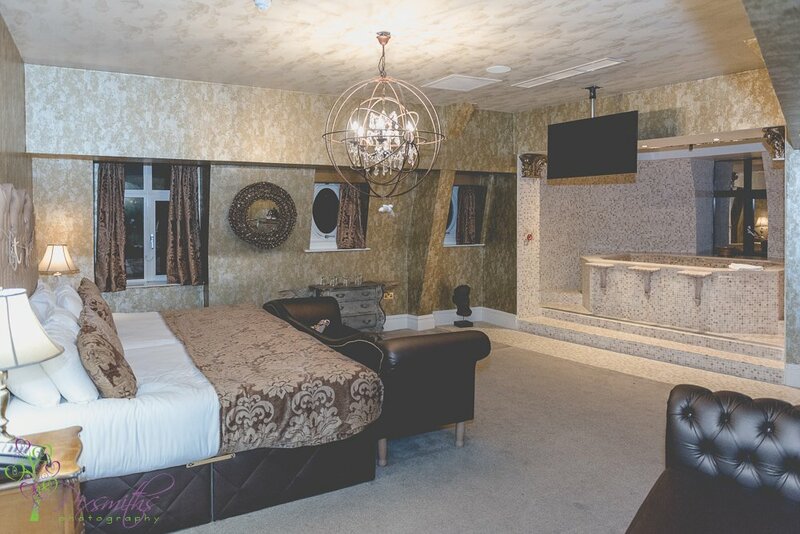 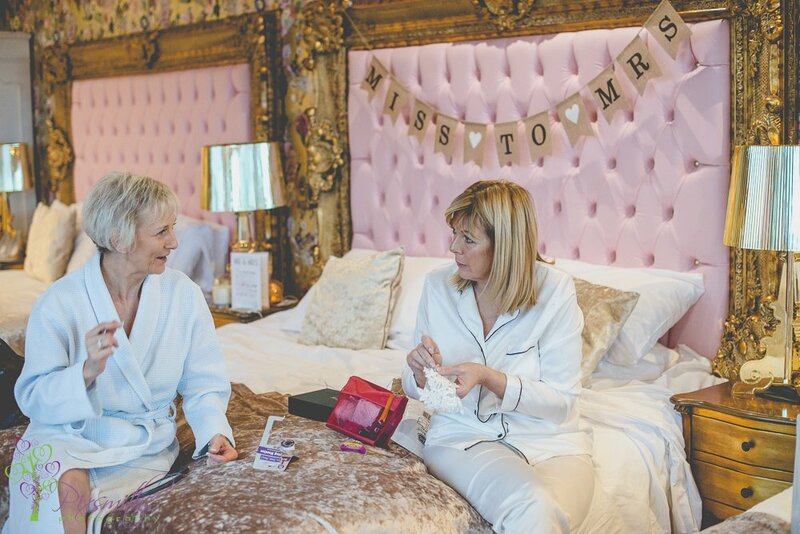 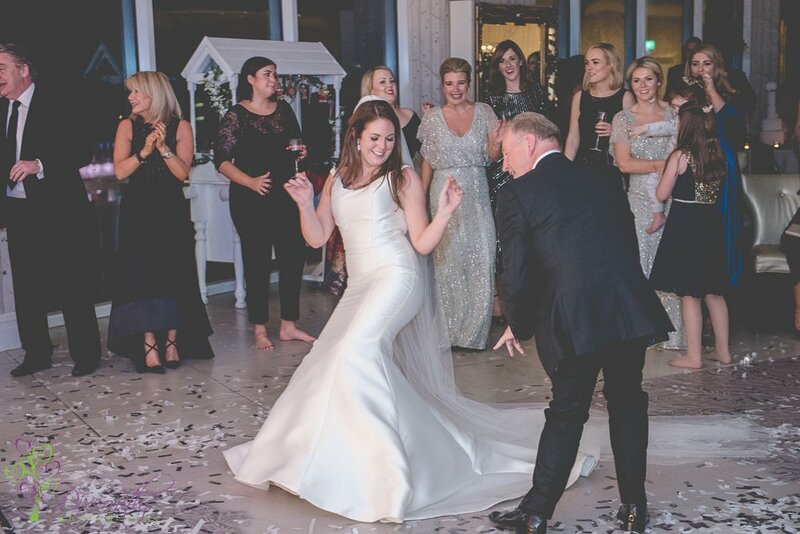 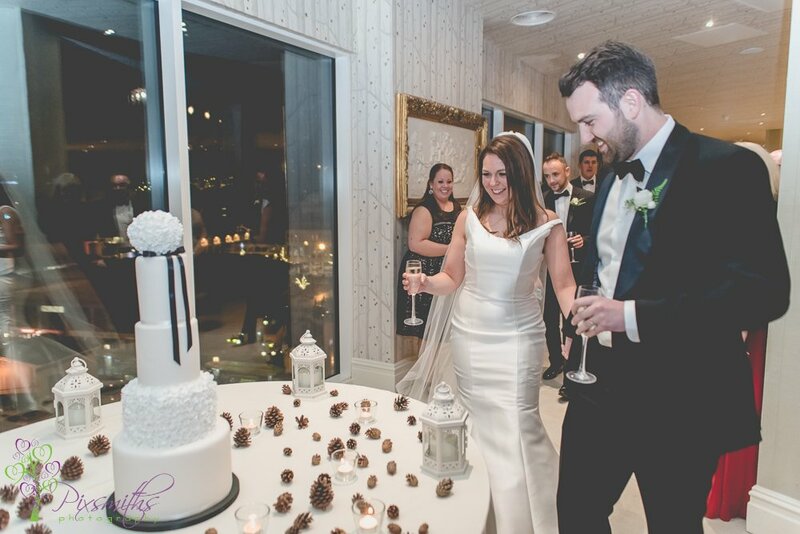 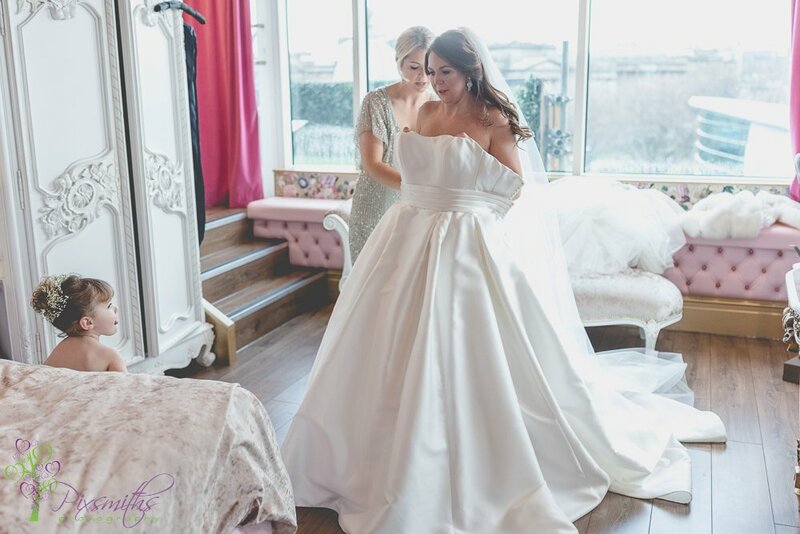 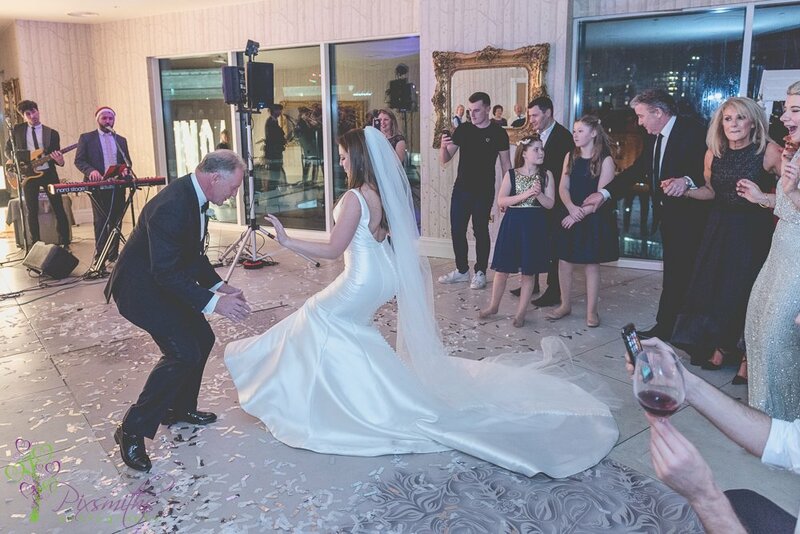 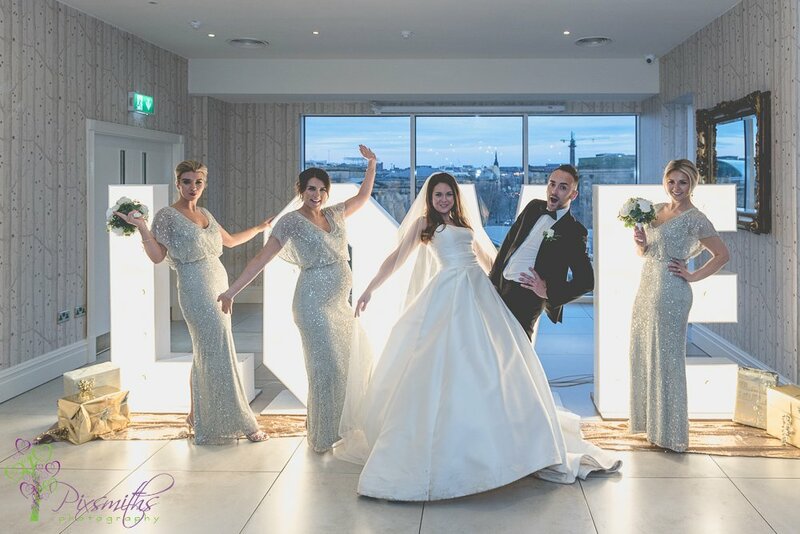 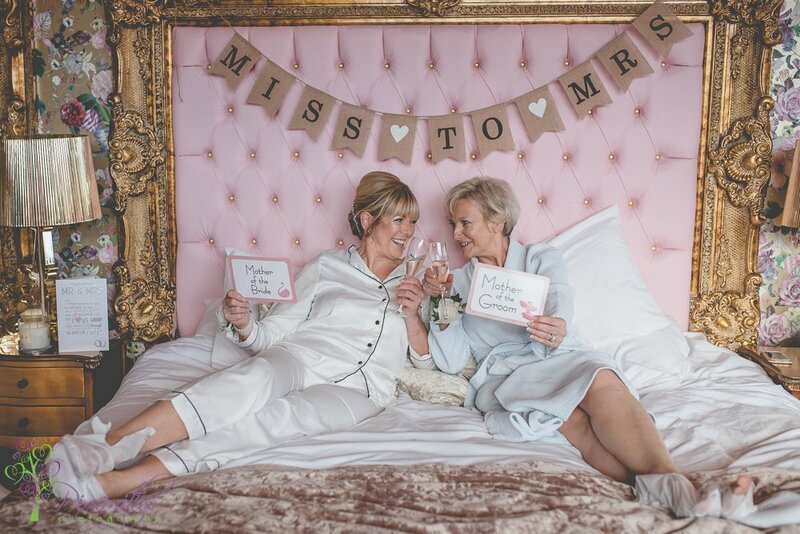 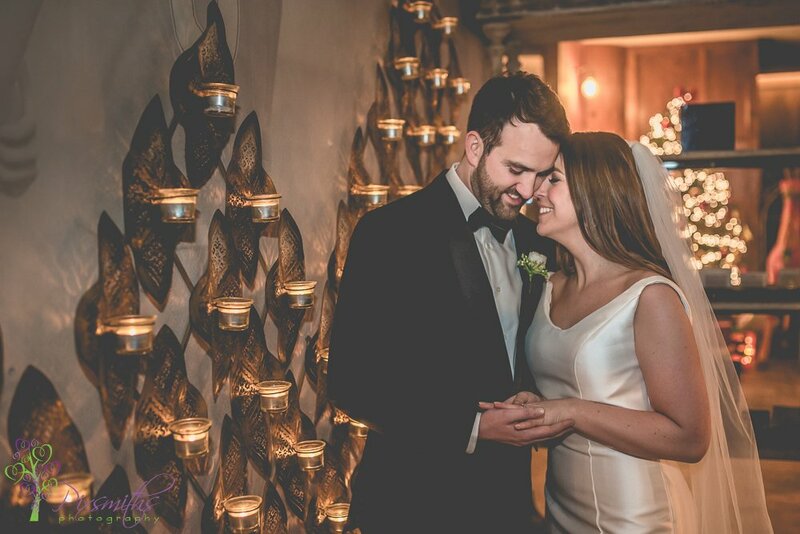 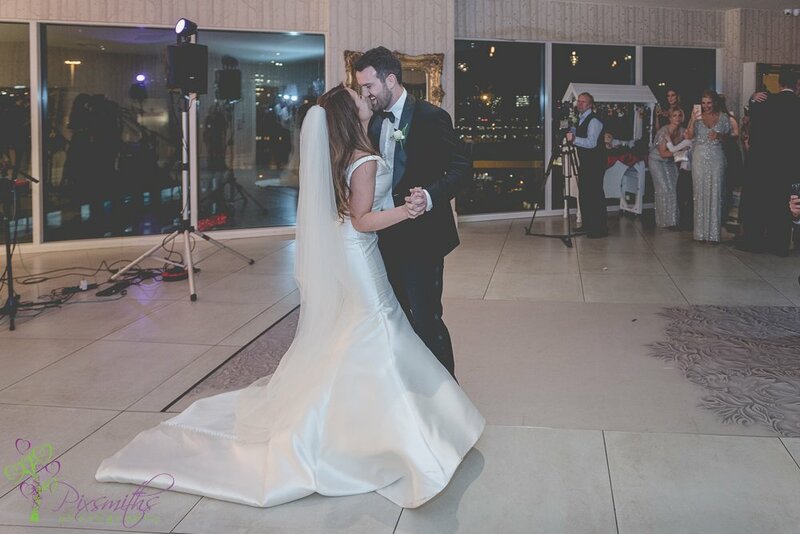 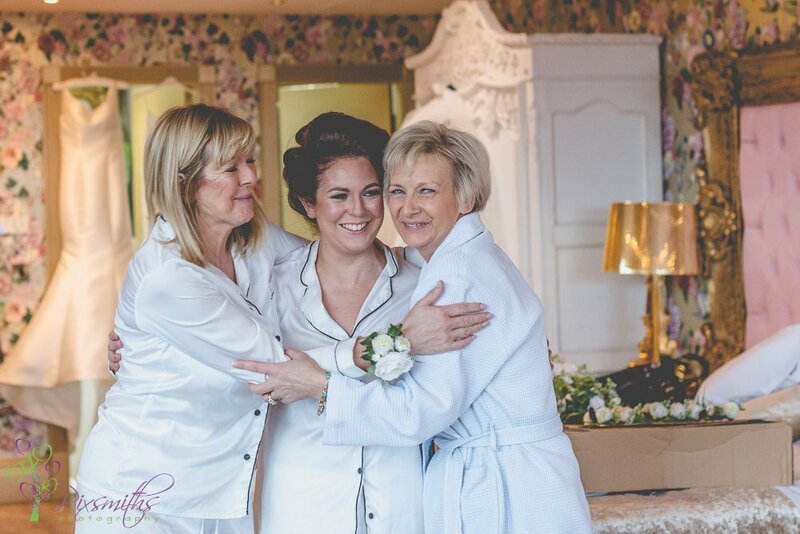 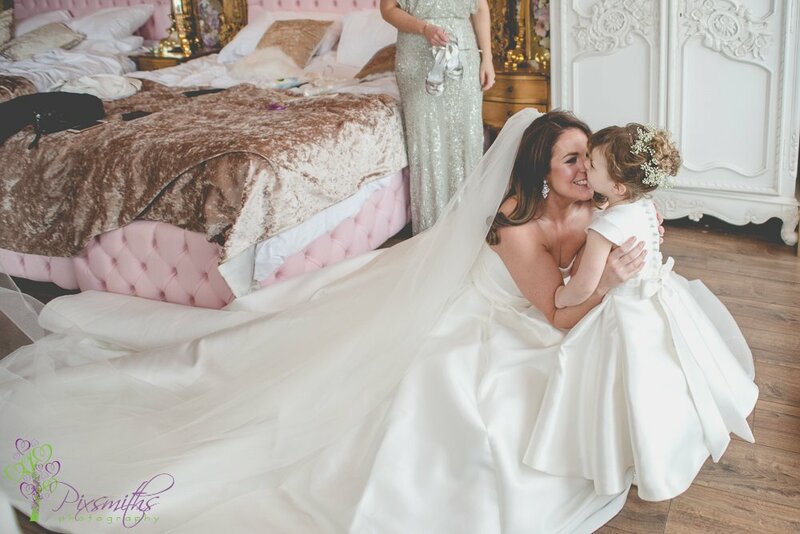 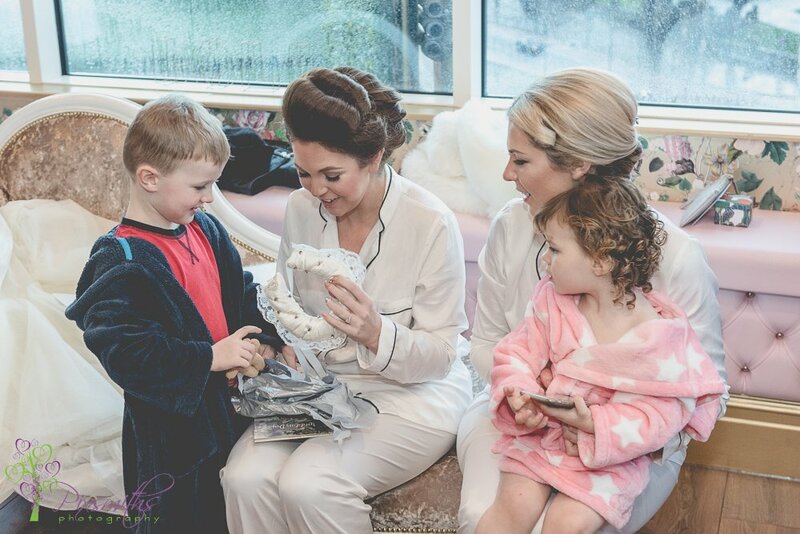 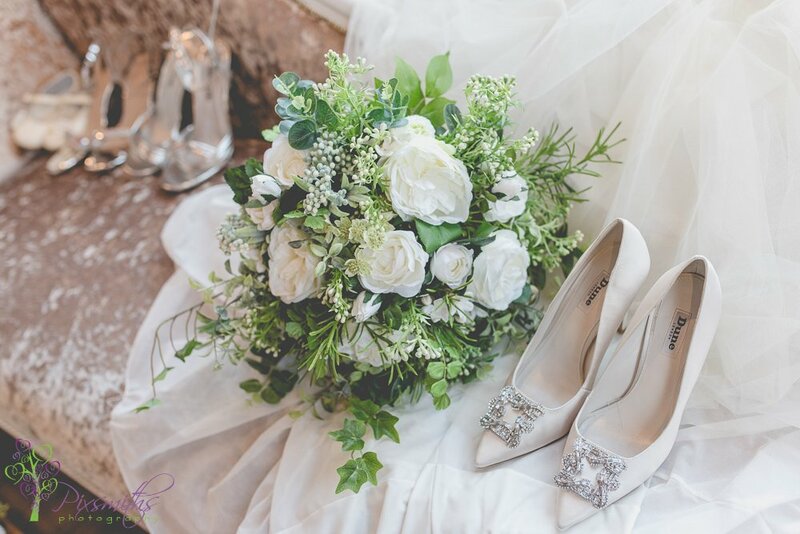 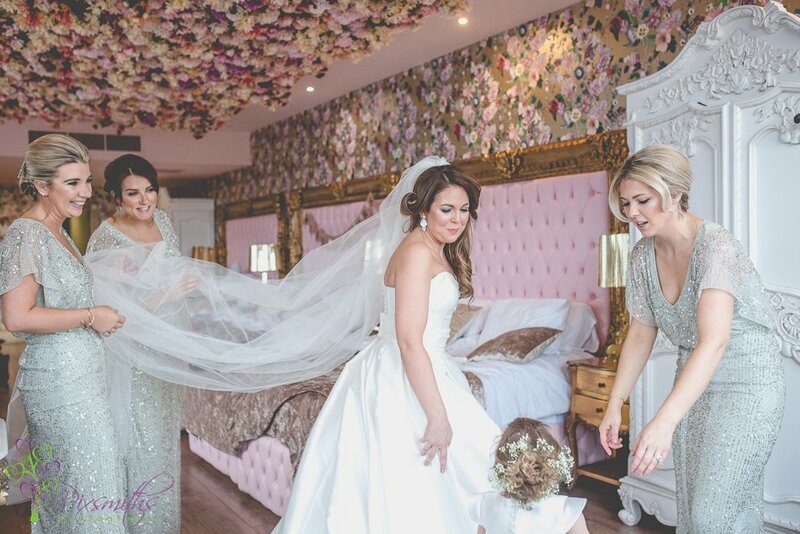 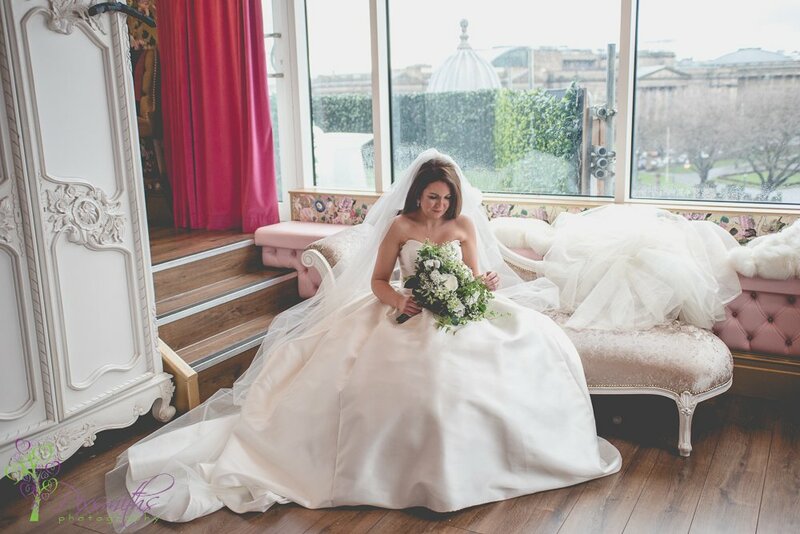 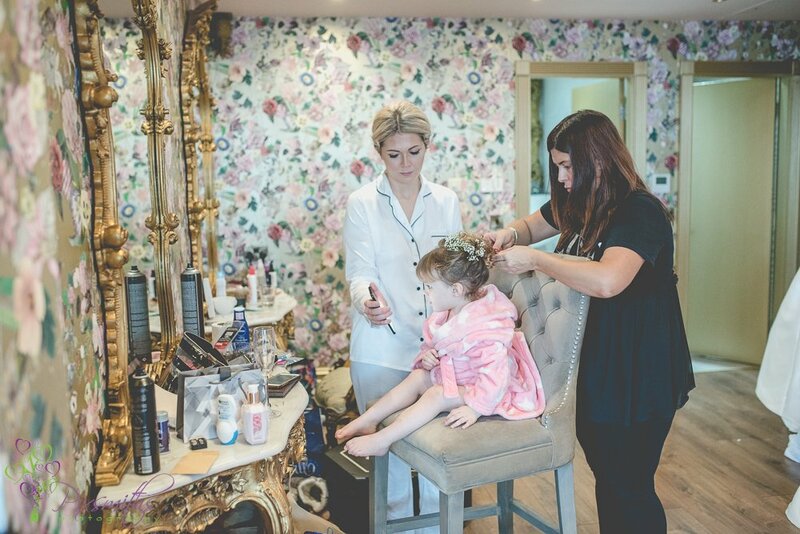 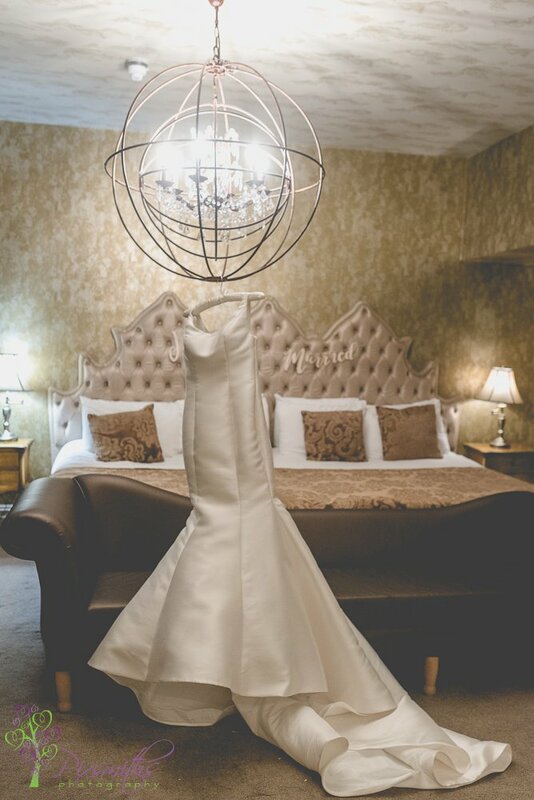 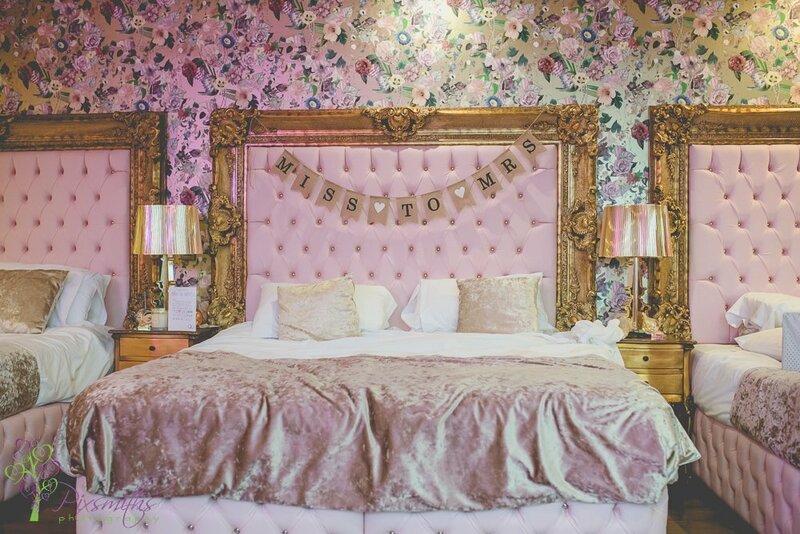 Afterwards Stephanie (who runs the bridal boutique The Wirral Wedding House) surprised Laurence with a change of dress – we were primed about this and was requested to get some shots in their bridal suite – Wow what a room that is, and the marble bathtub – immense! 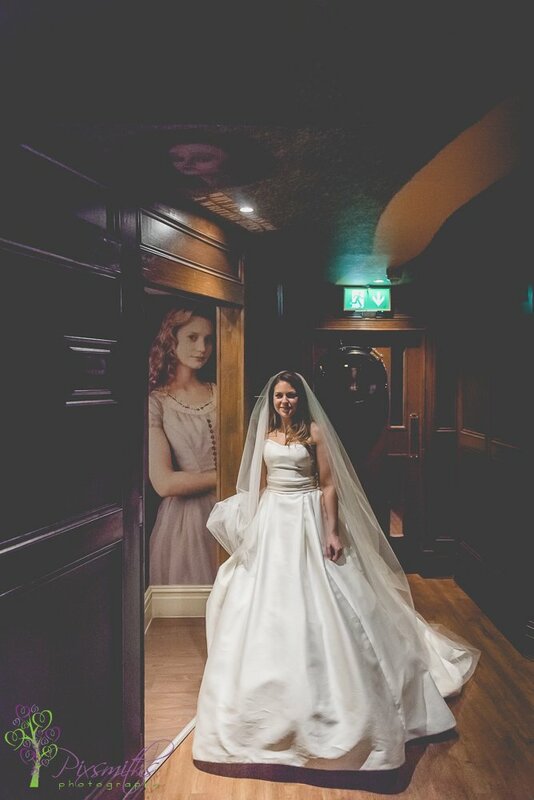 The floor the suite is on has an Alice in Wonderland theme, so make for some great images there before we headed out for a few night portraits. 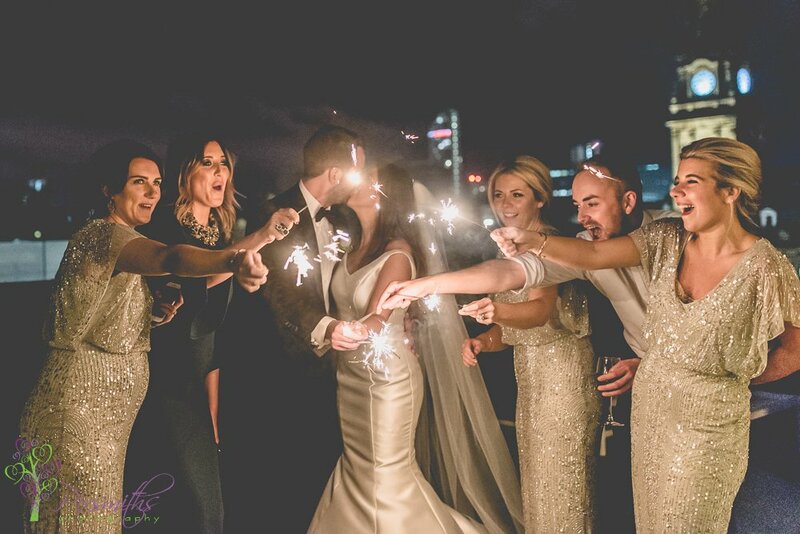 A great party ensued with the lively band and we had fun with sparklers too. 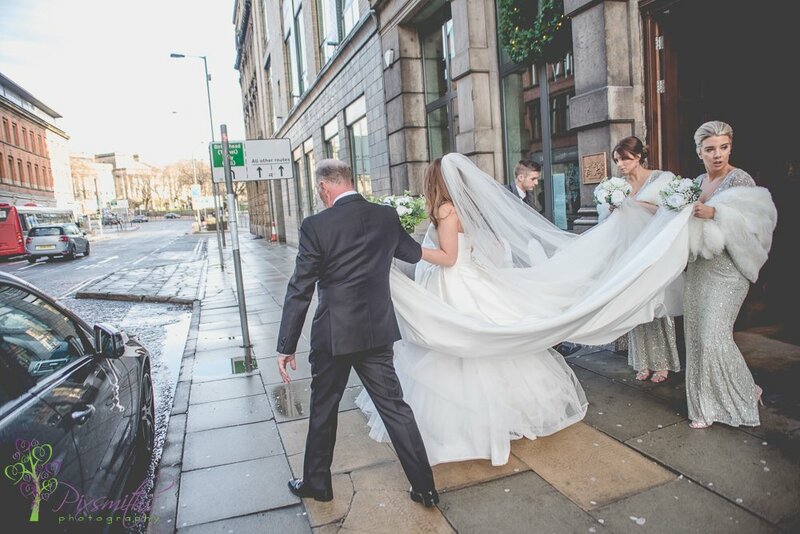 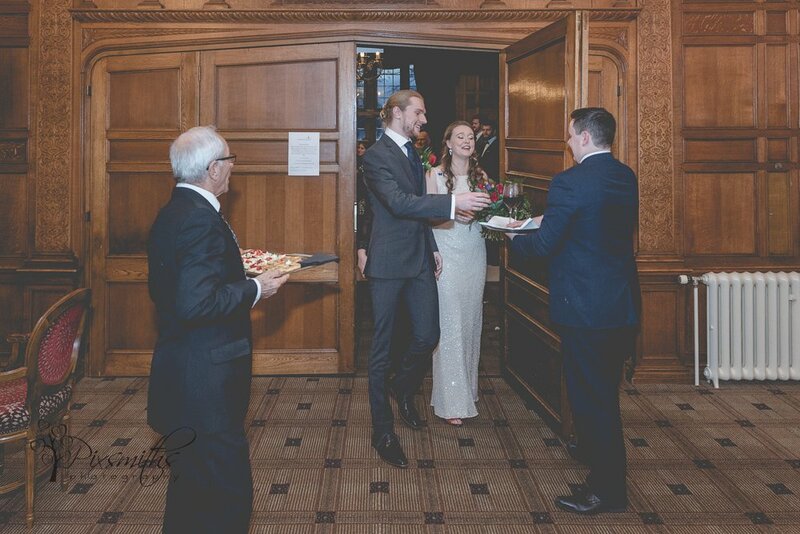 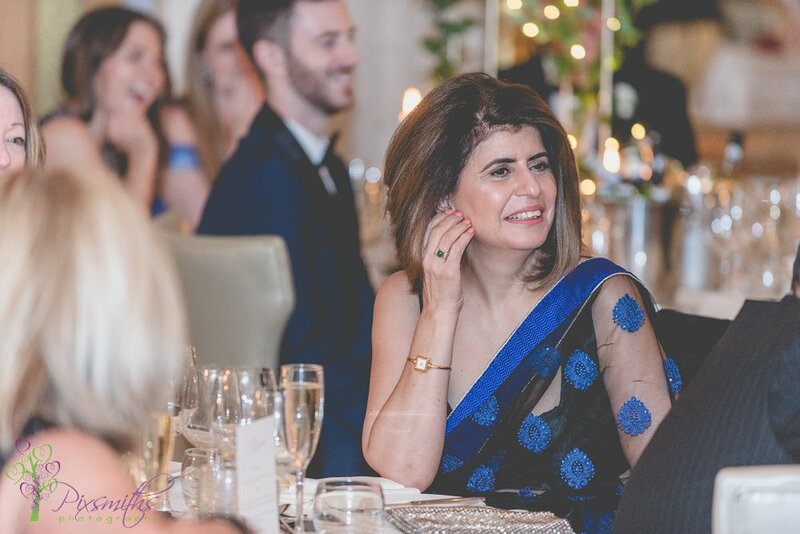 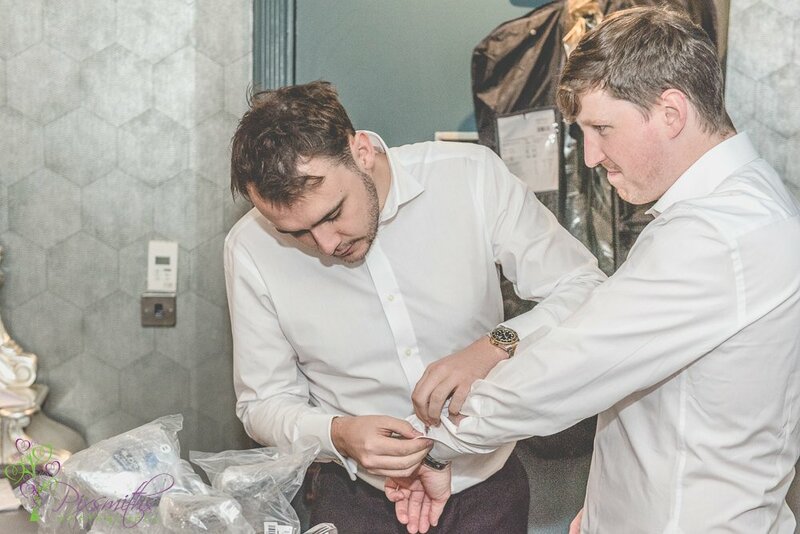 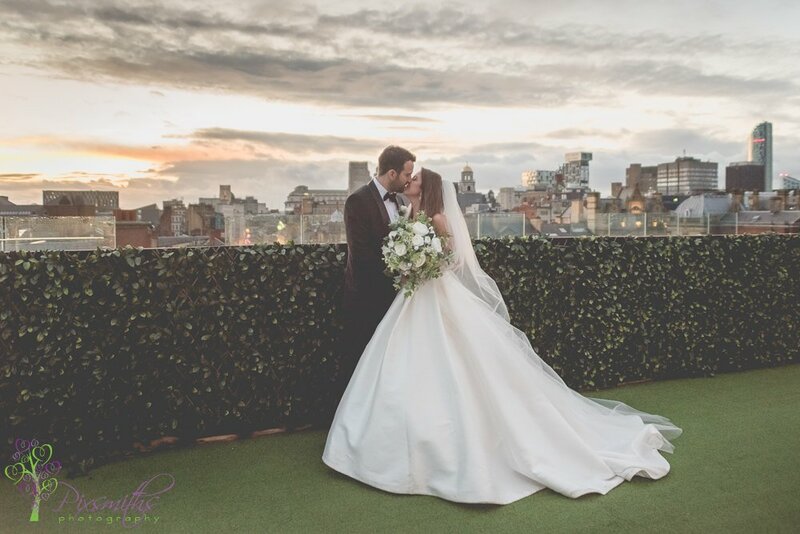 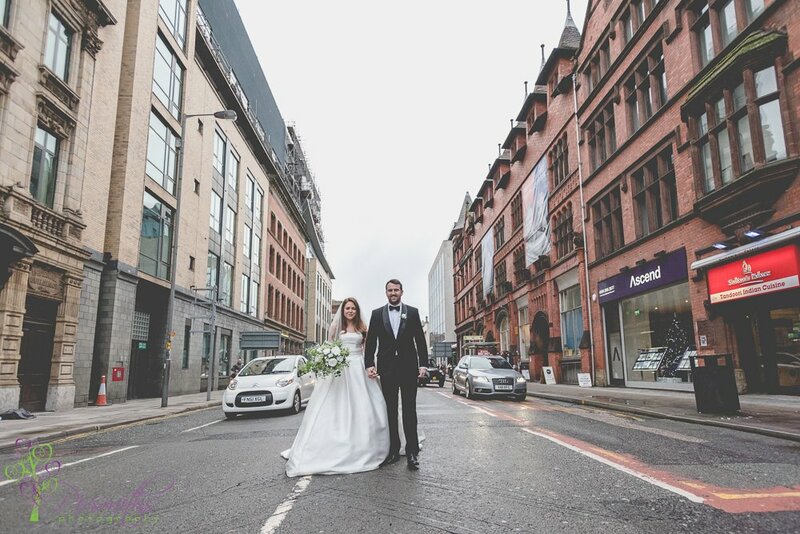 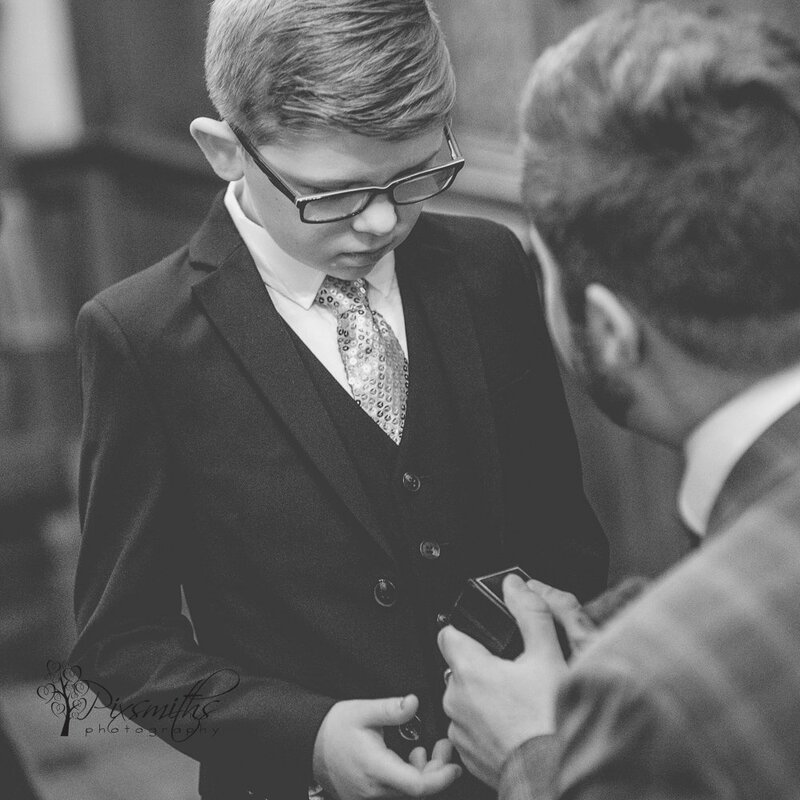 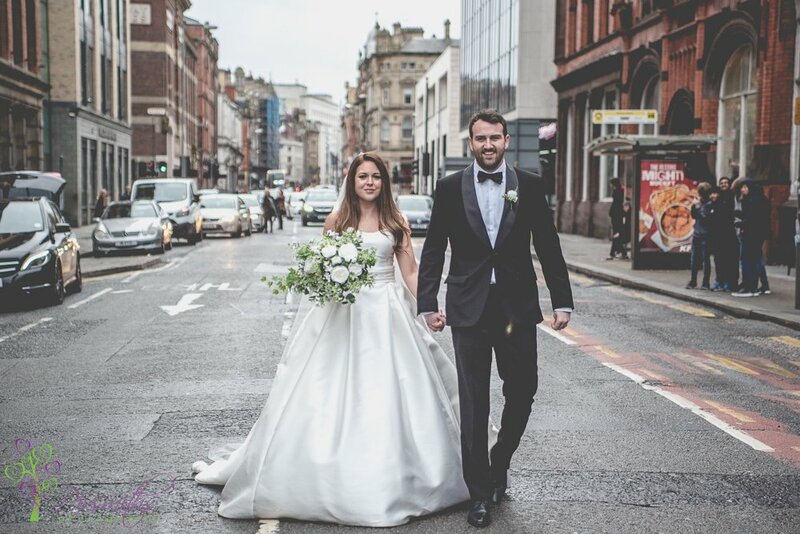 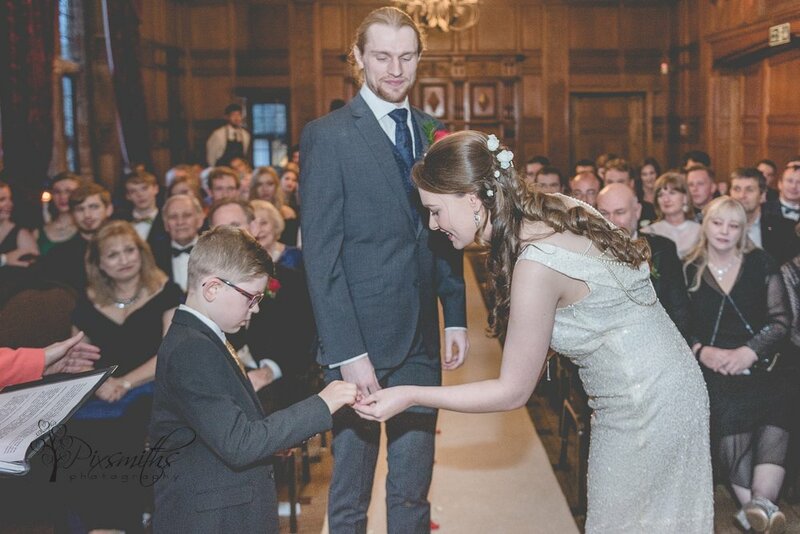 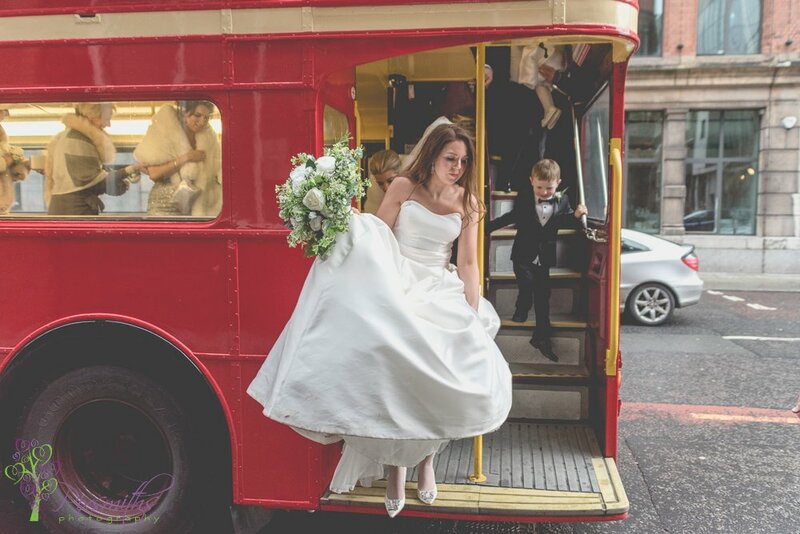 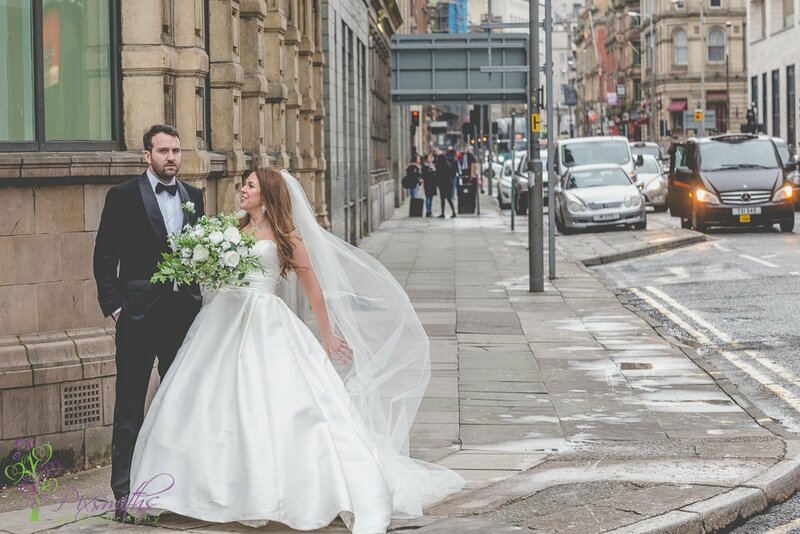 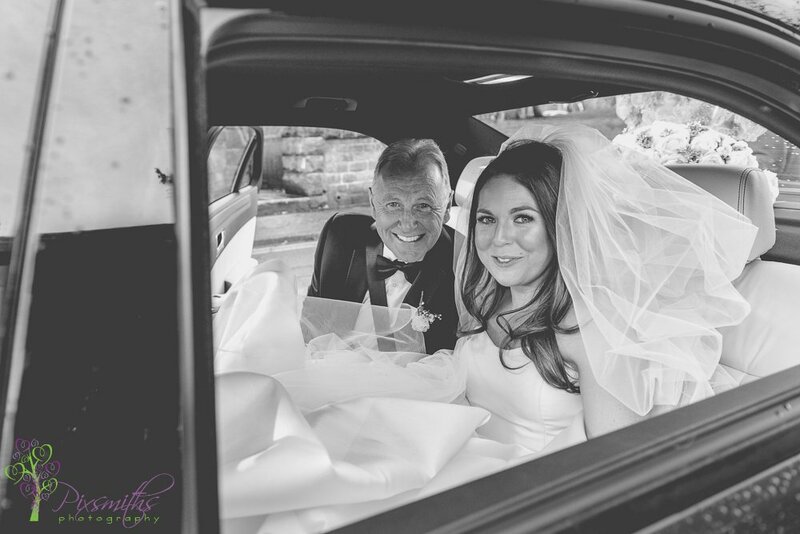 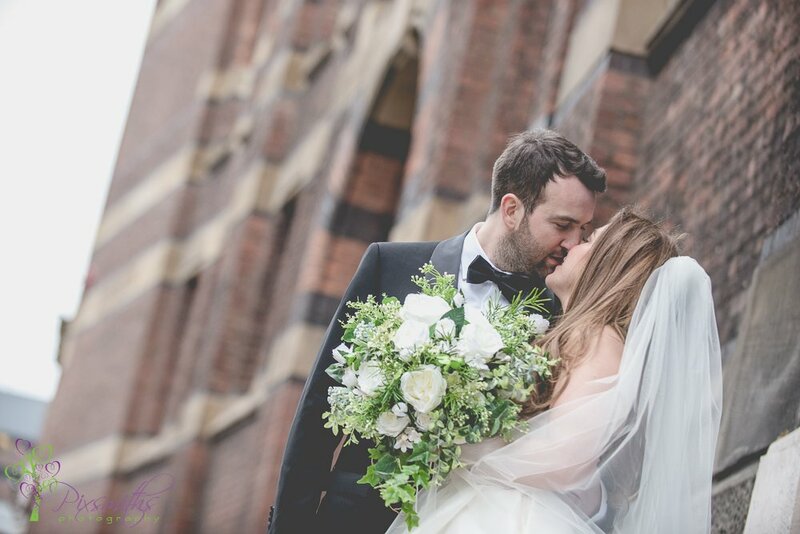 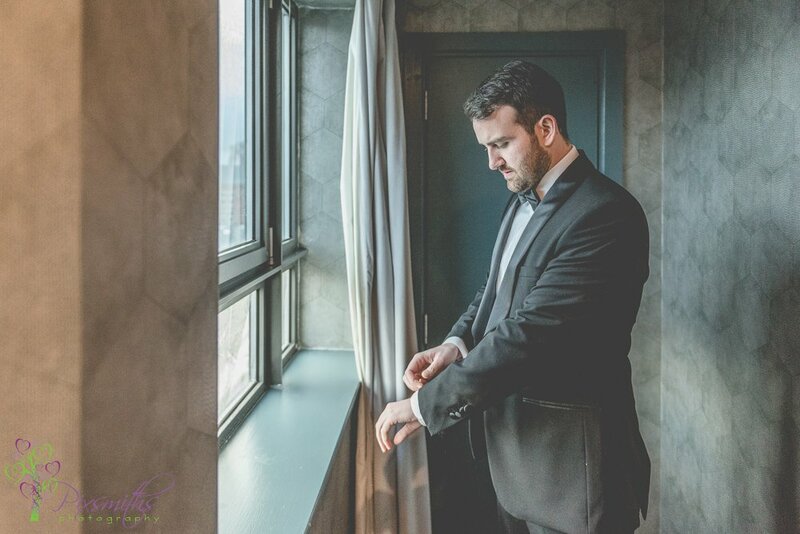 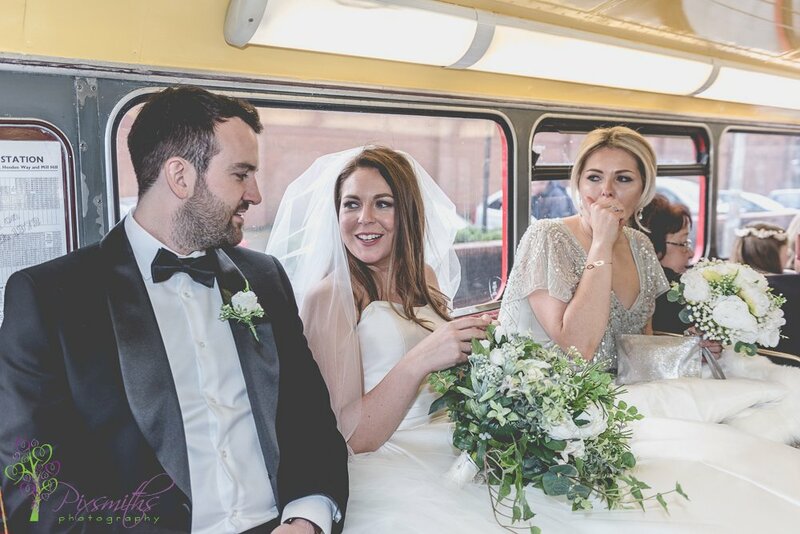 Thank you again Stephanie and Laurence for the privilege of capturing your amazing day at your church and The Shankly Hotel.It was wonderful to spend time with your friends and lovely families. 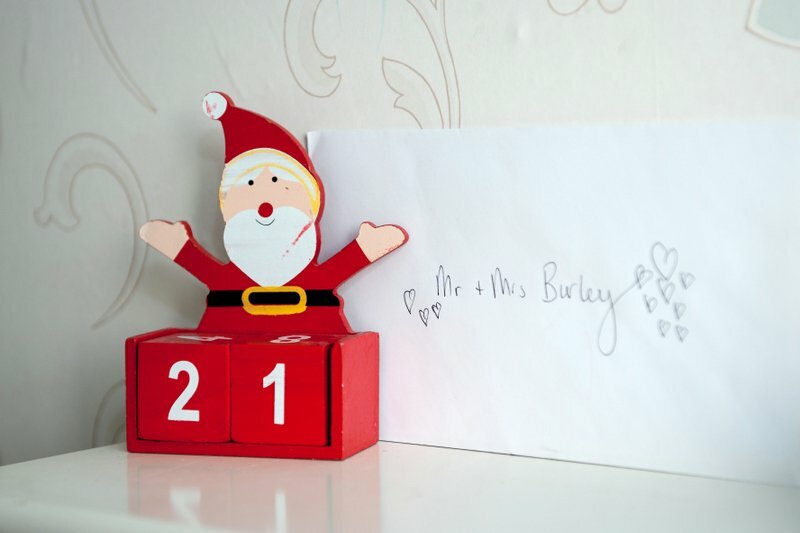 Wishing you all the happiness, health and love in years to come. 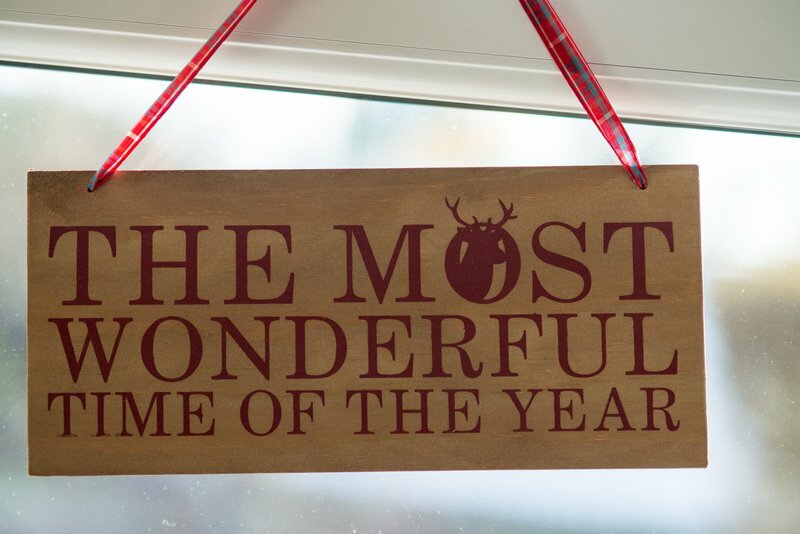 Enjoy your highlights! 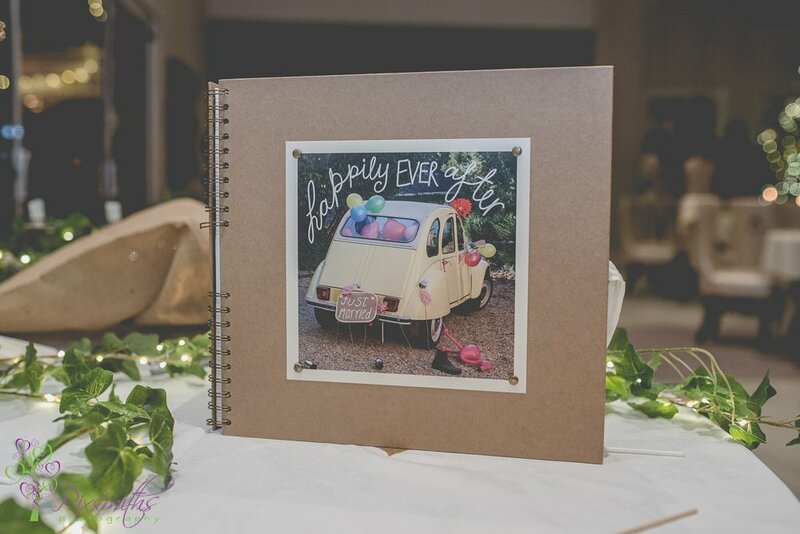 …there are so many…goodness knows how you will chose for your album! 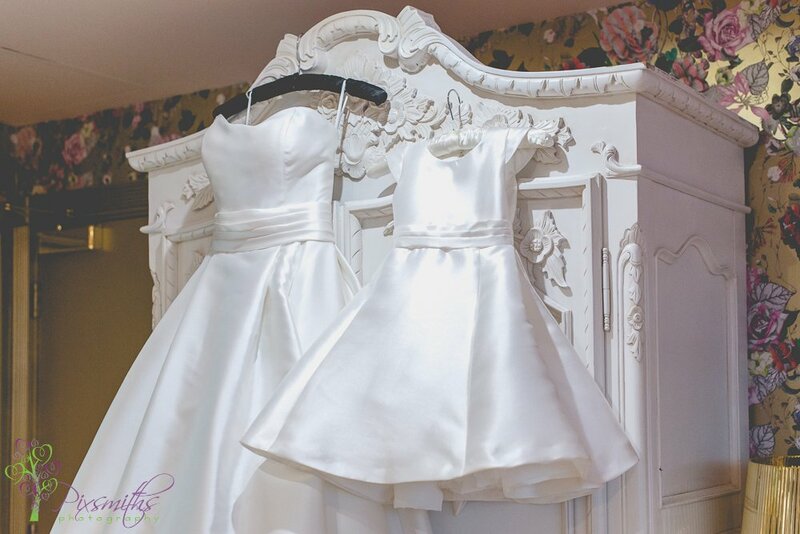 How cute is the little flower girls dress matching Stephanie’s dress! 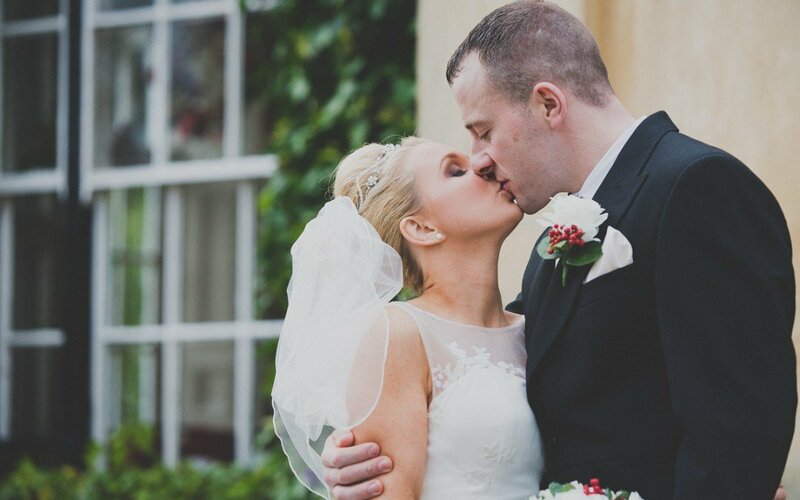 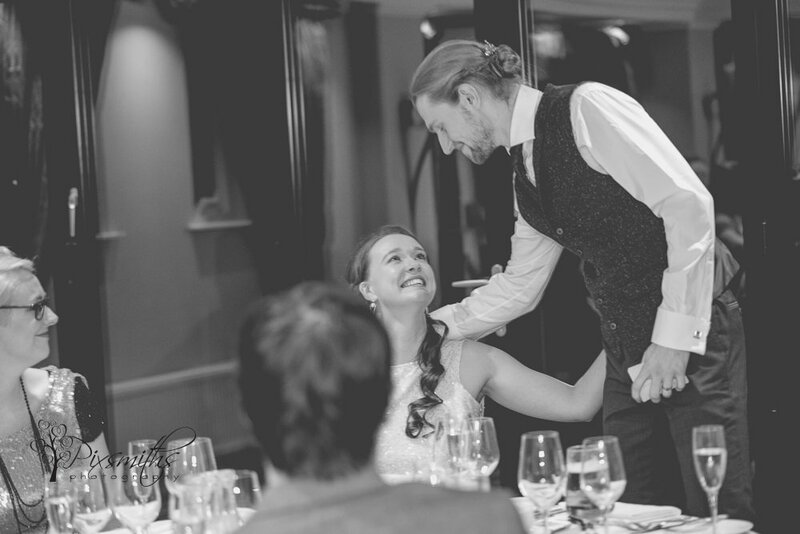 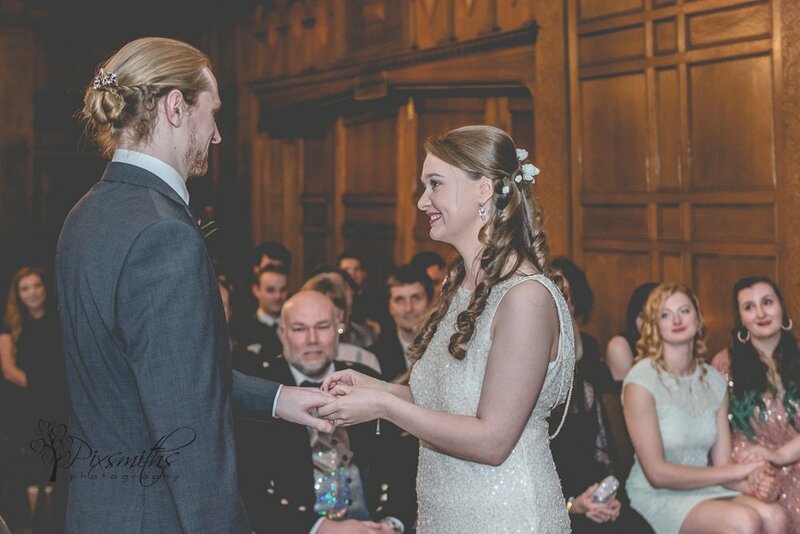 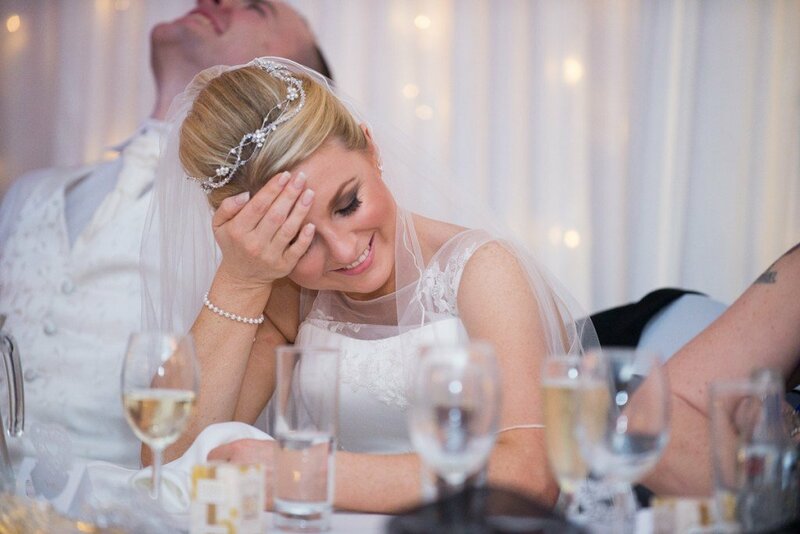 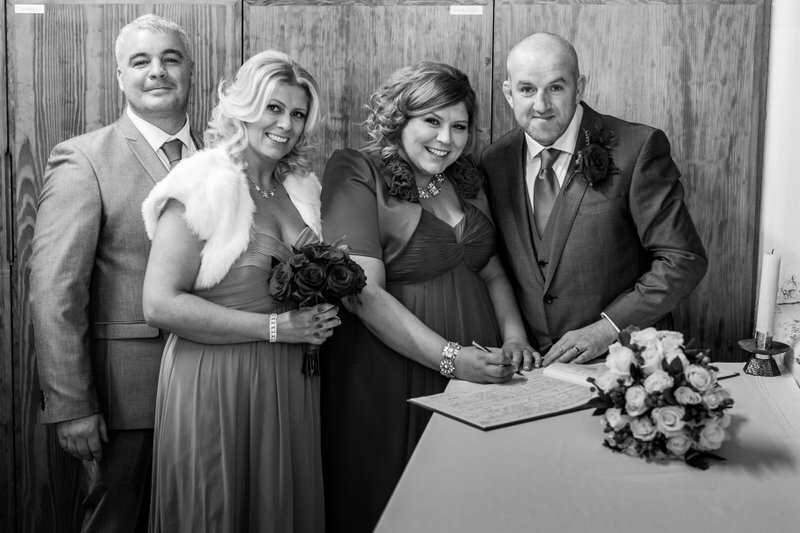 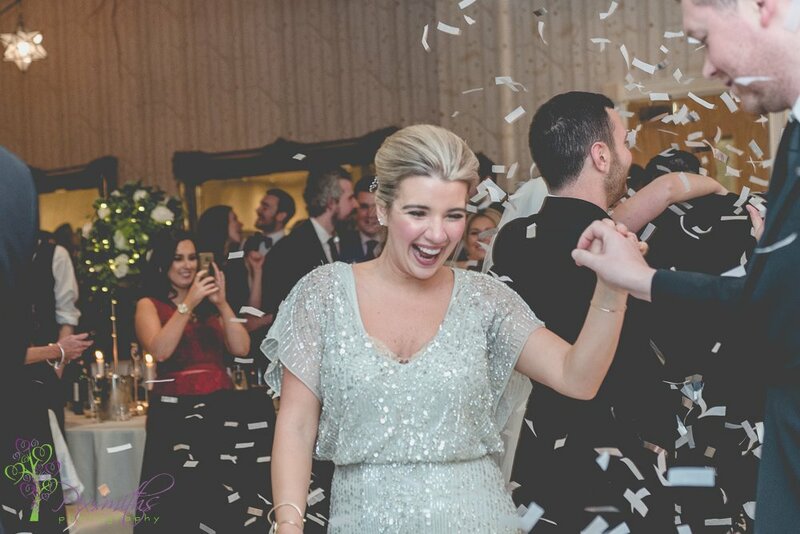 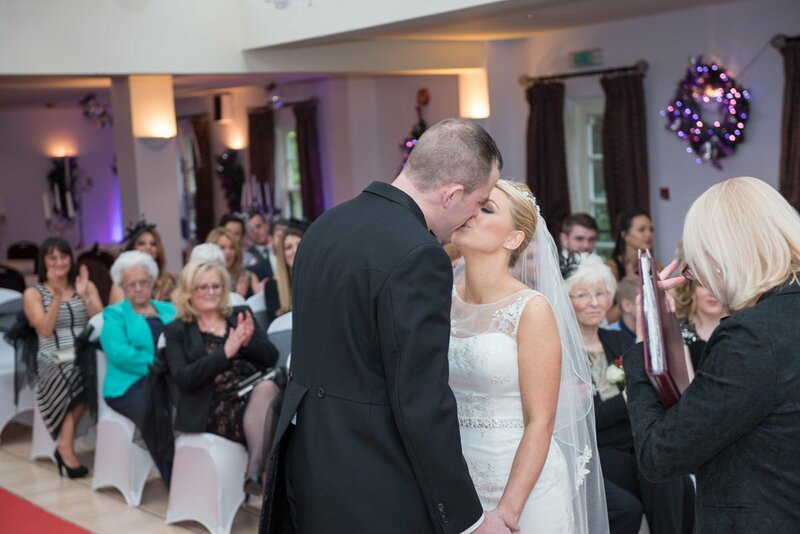 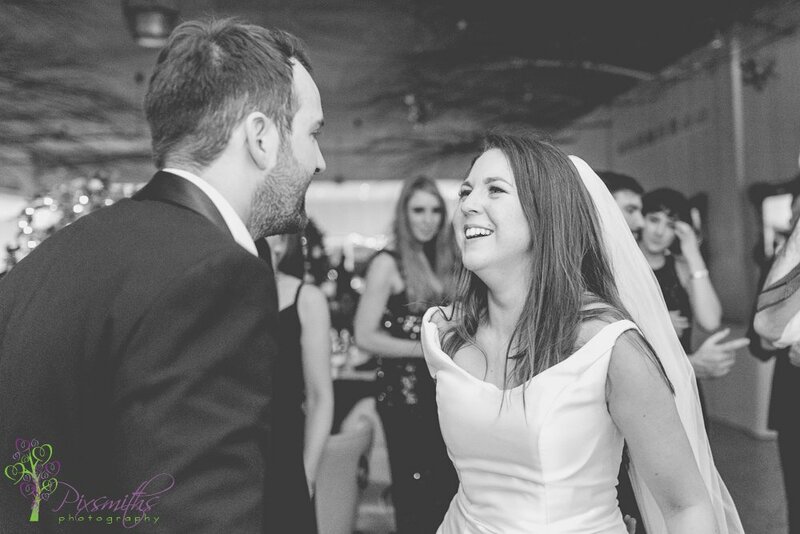 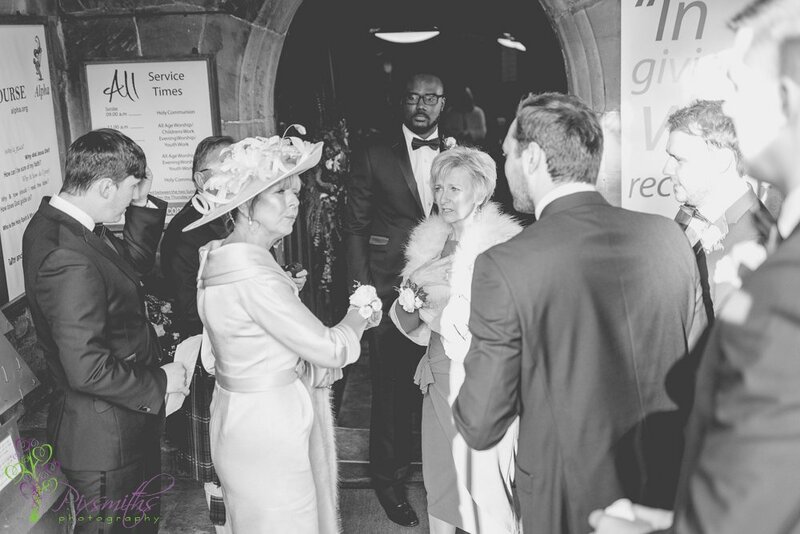 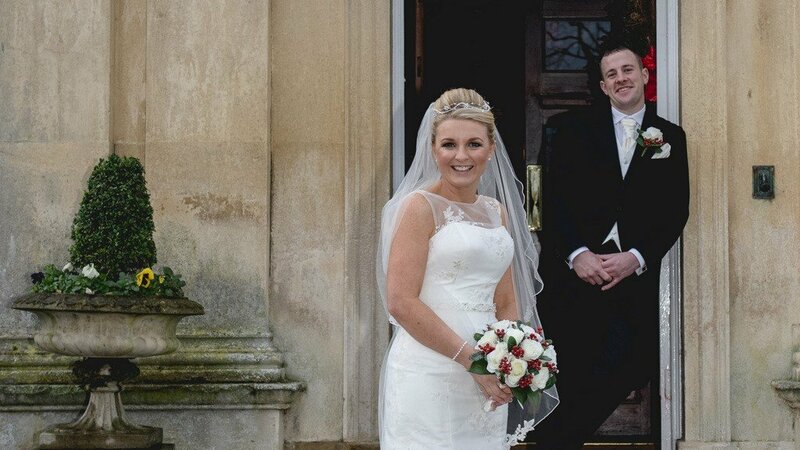 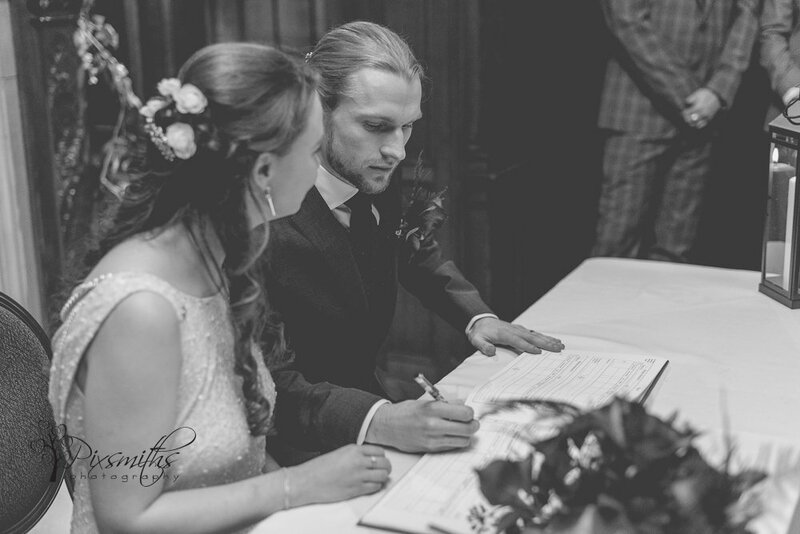 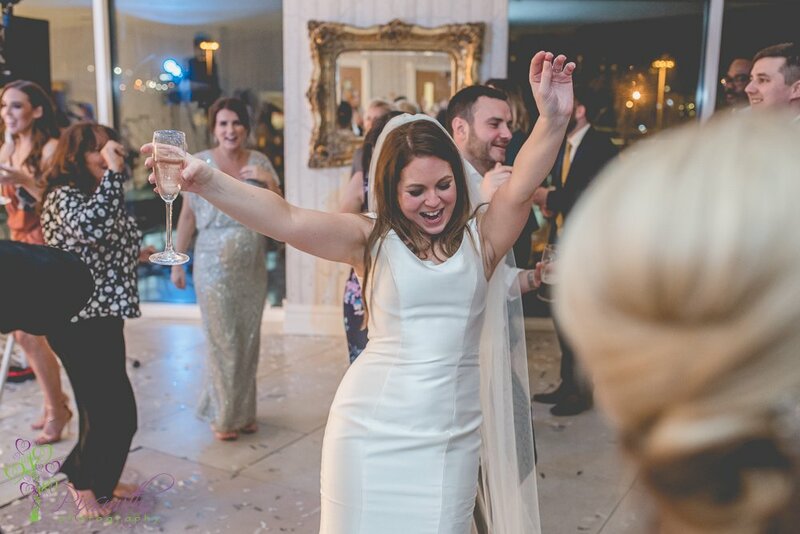 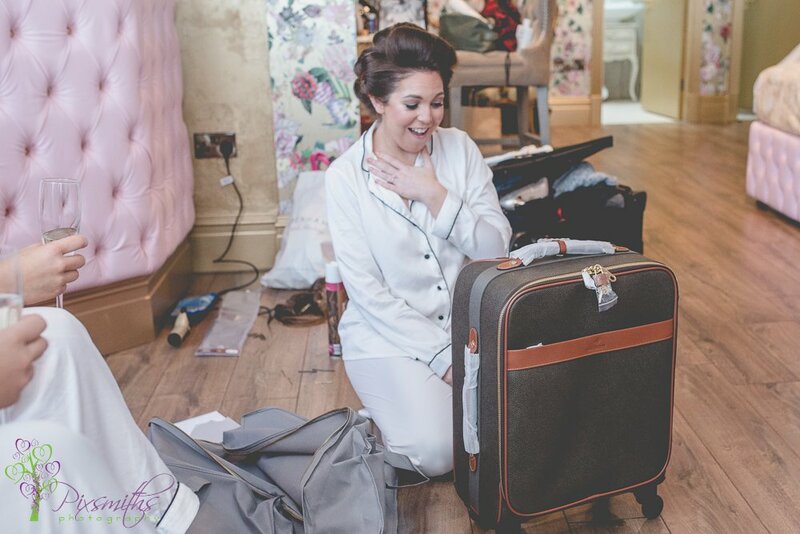 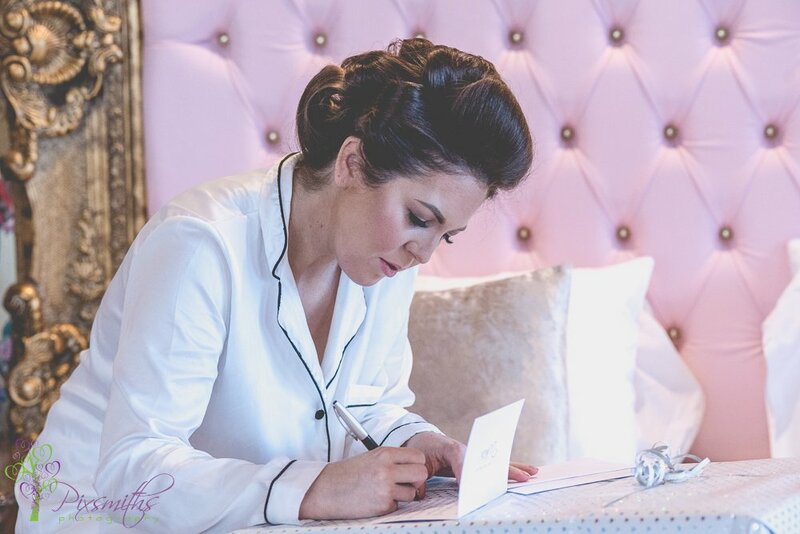 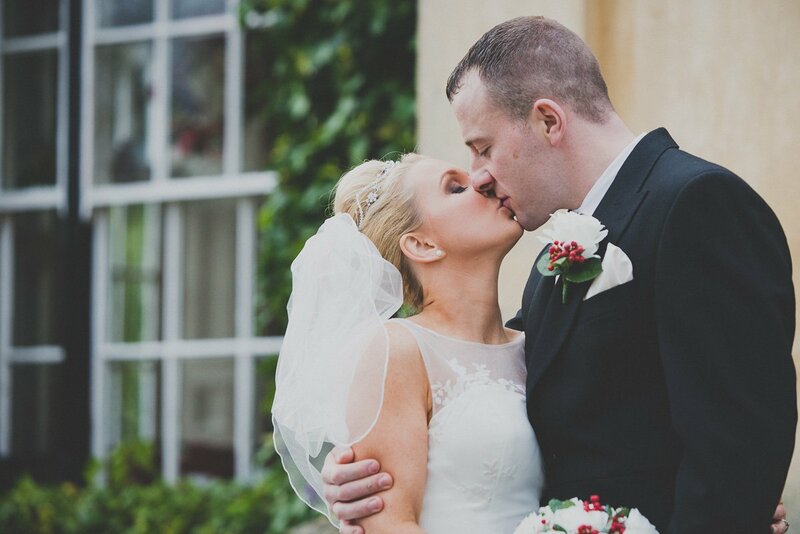 Being a wedding supplier herself Stephanie knew all the best suppliers to help her day run smoothly! 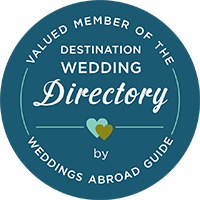 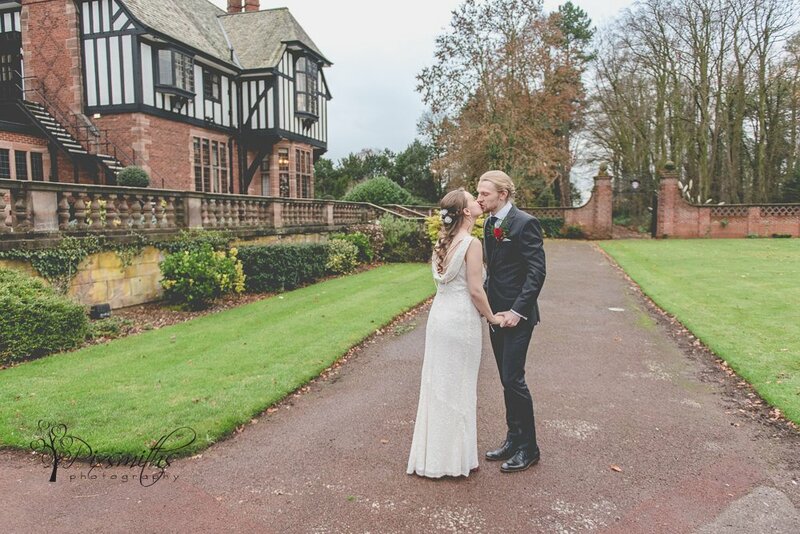 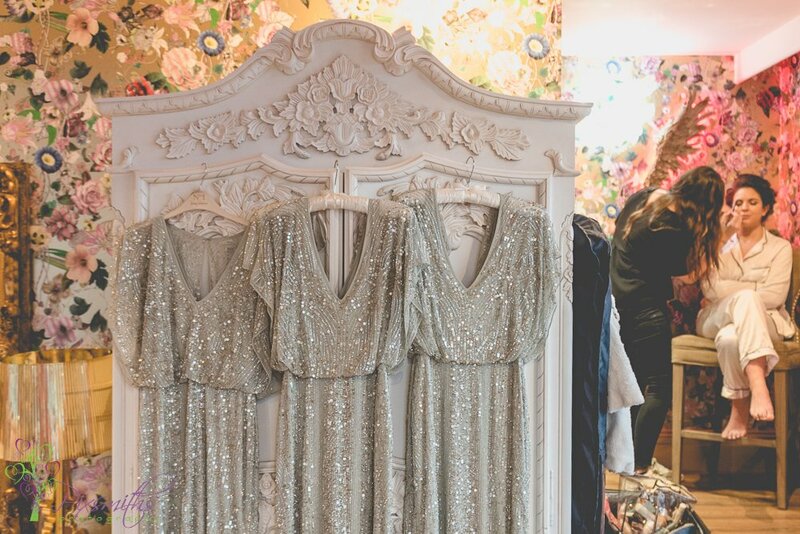 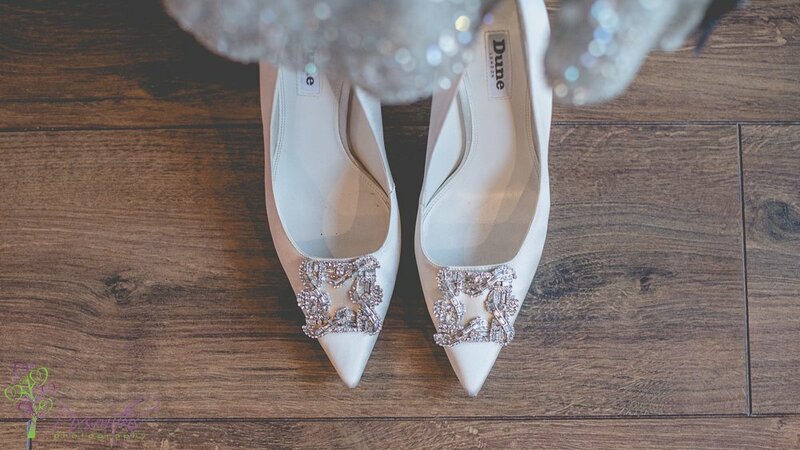 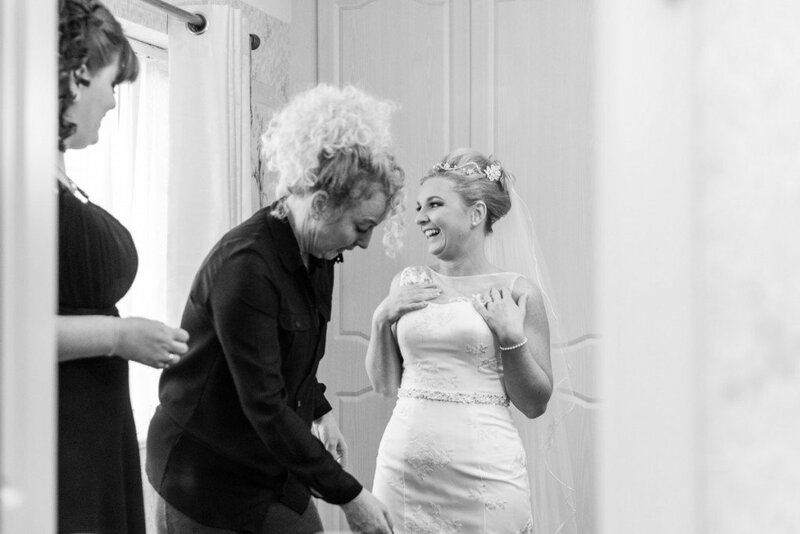 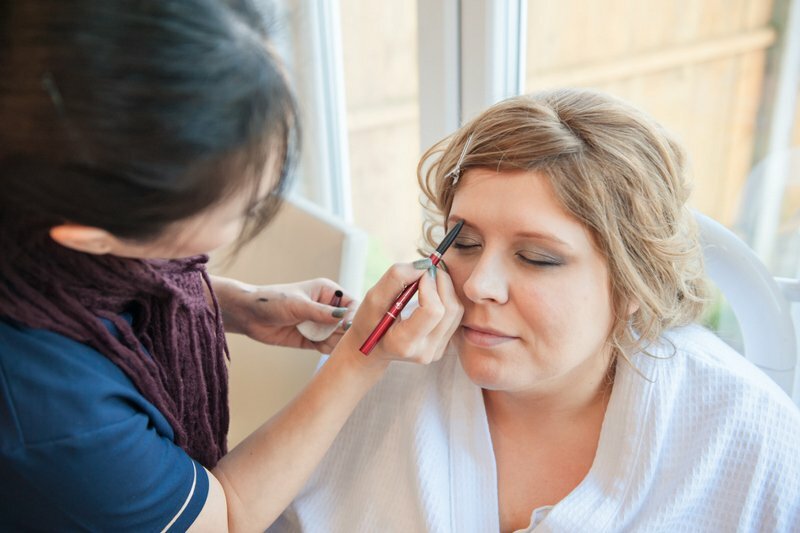 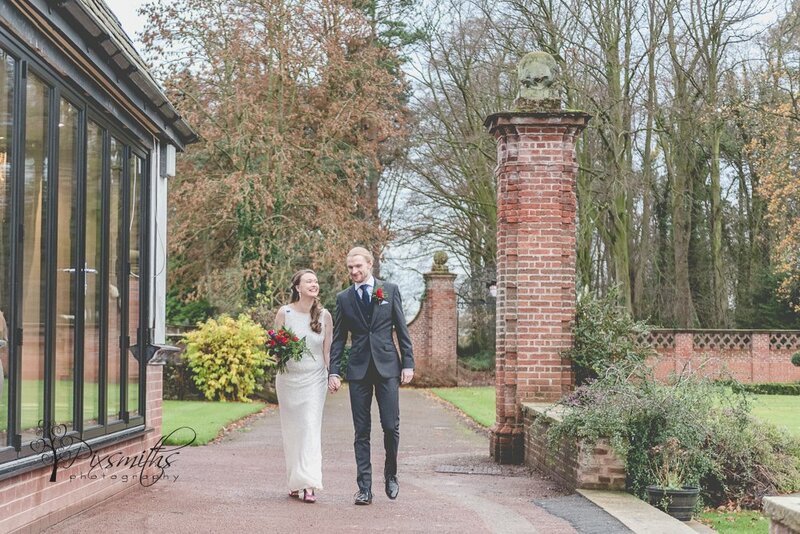 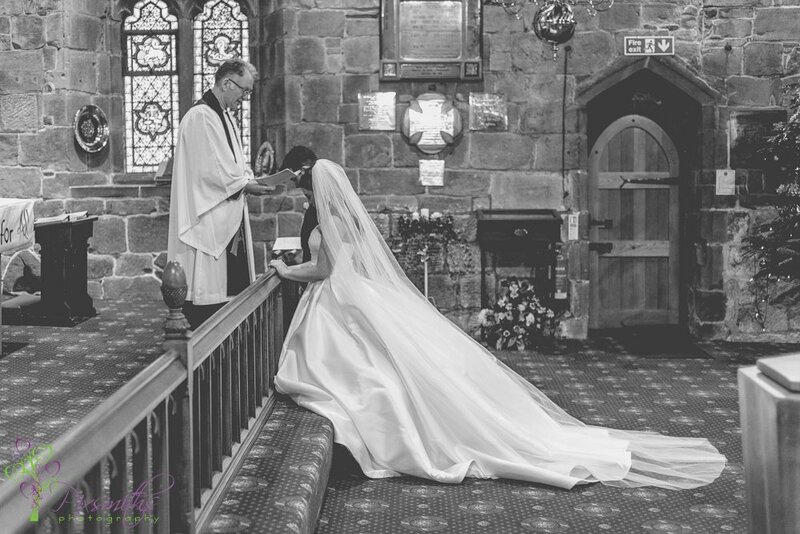 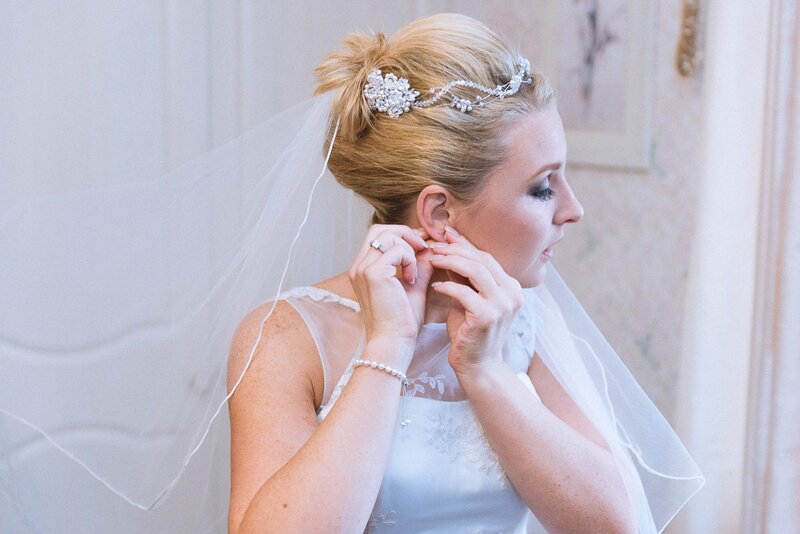 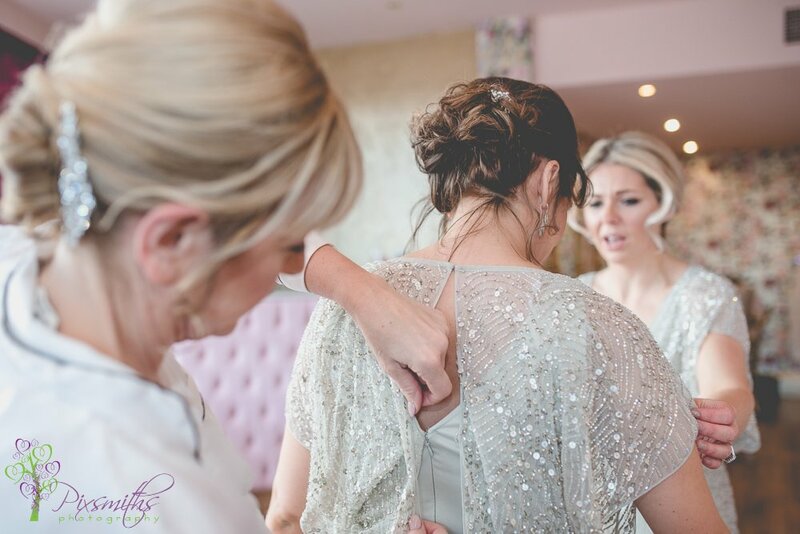 Bridal Dresses: Wirral Wedding House – of course! 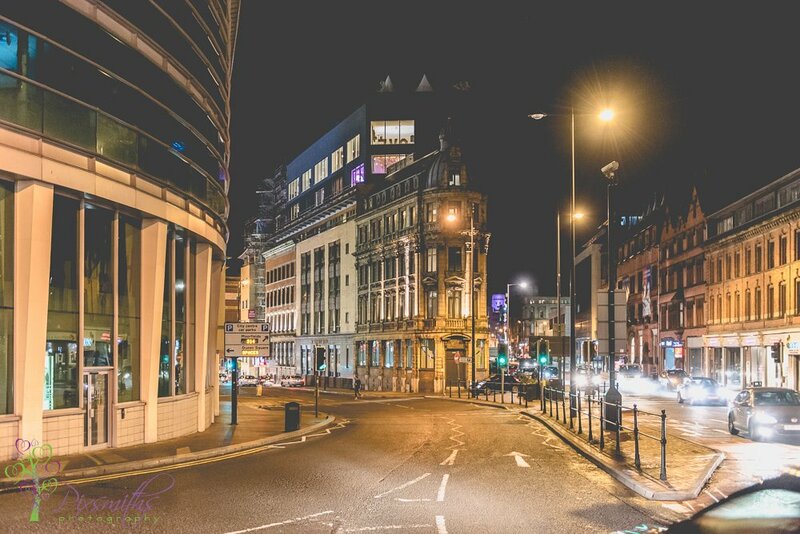 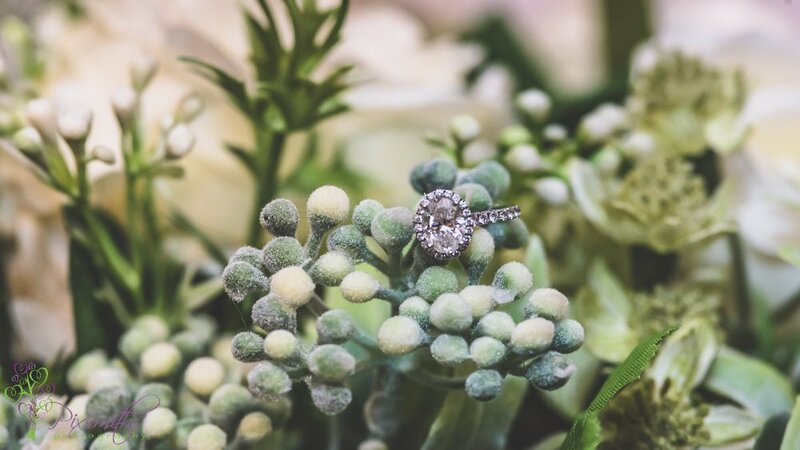 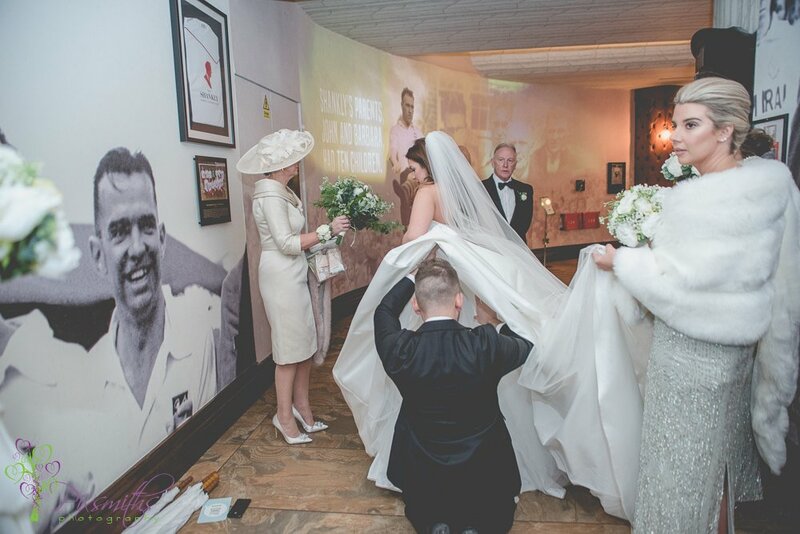 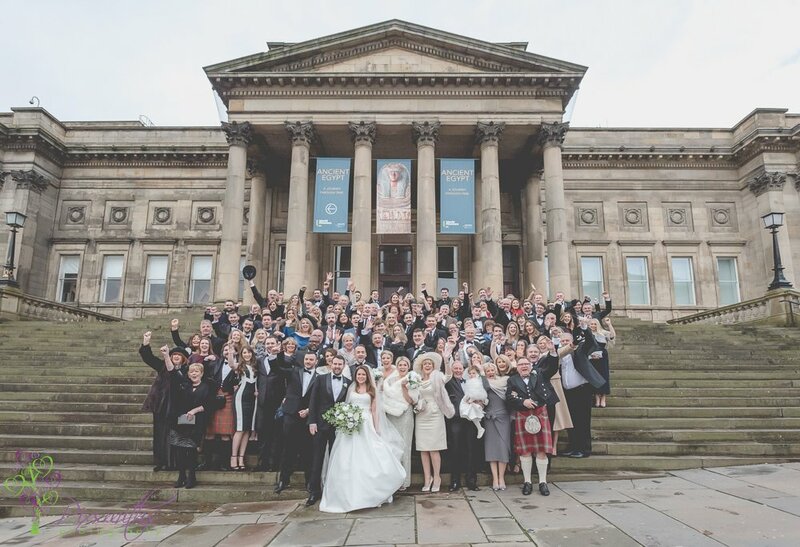 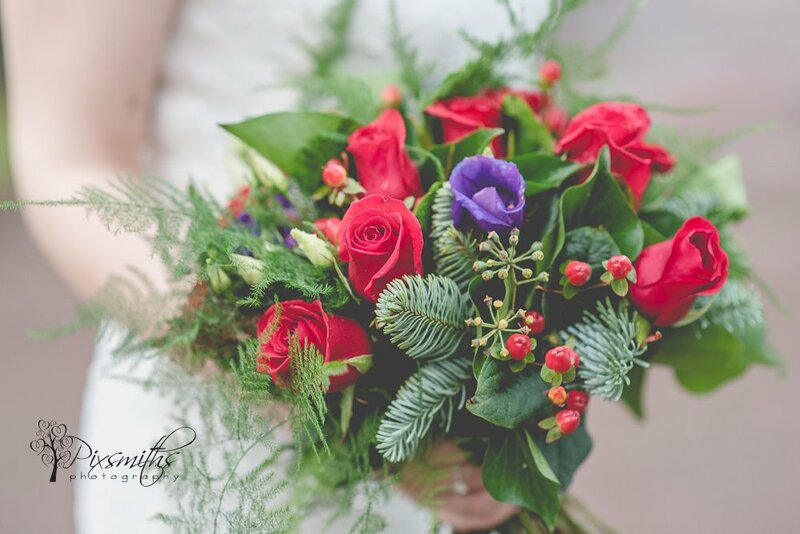 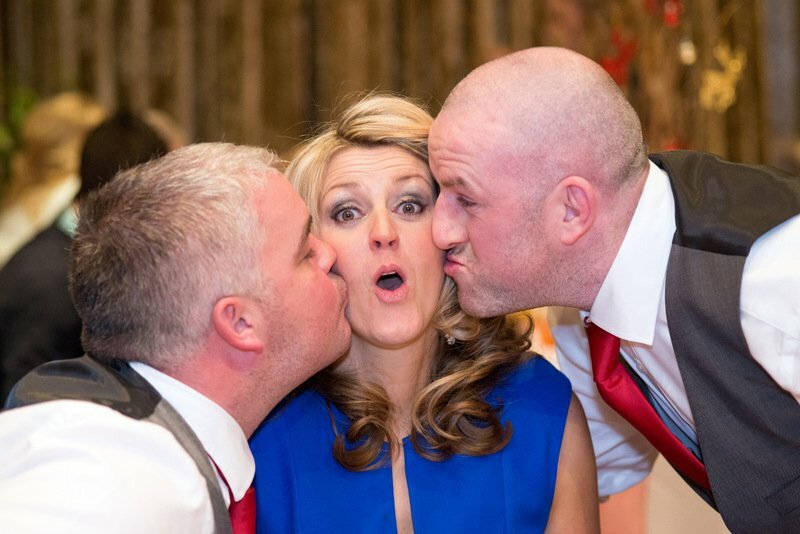 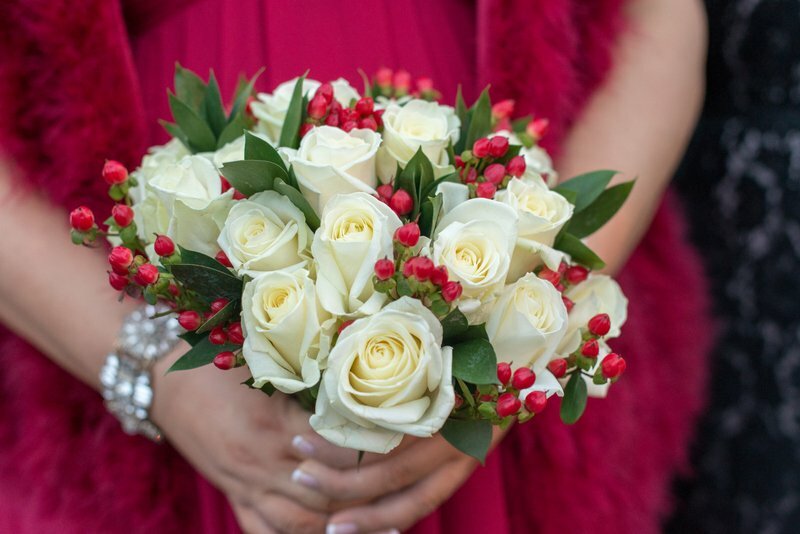 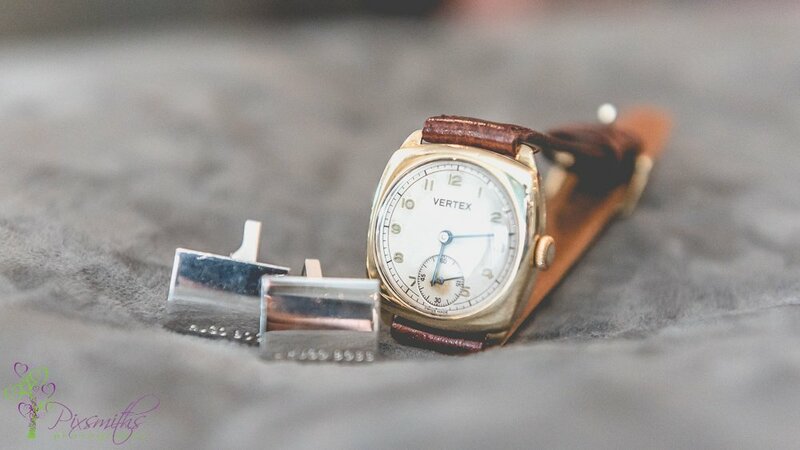 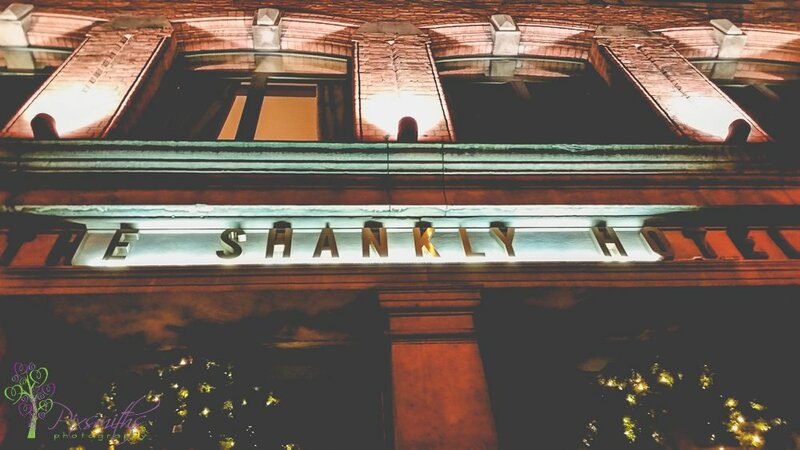 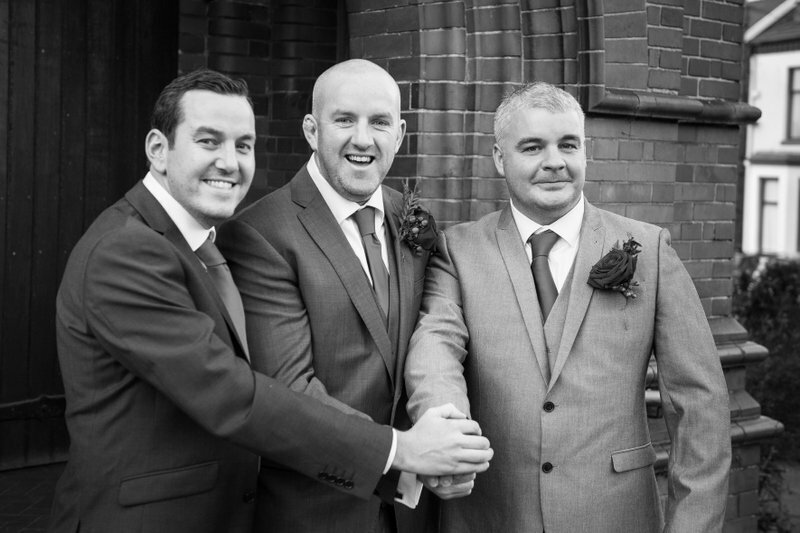 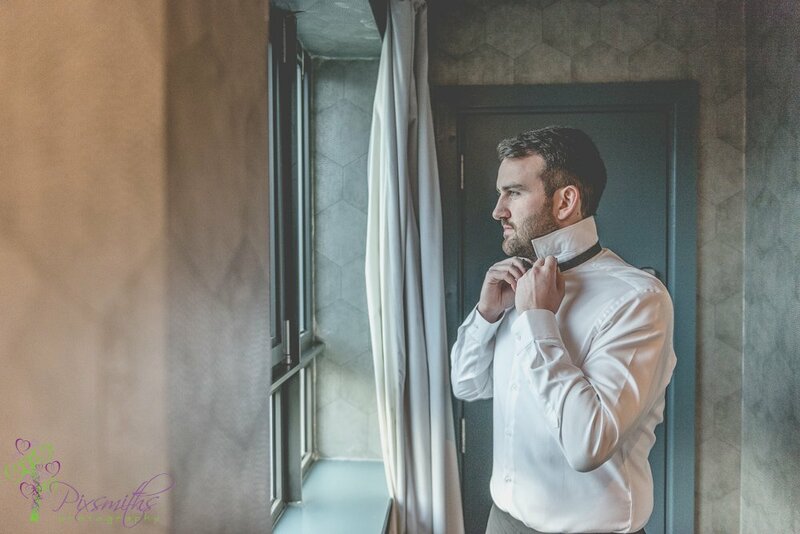 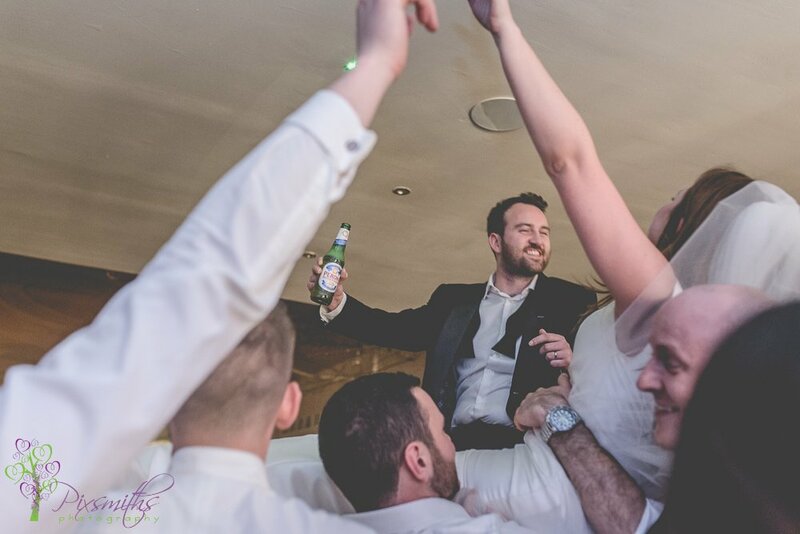 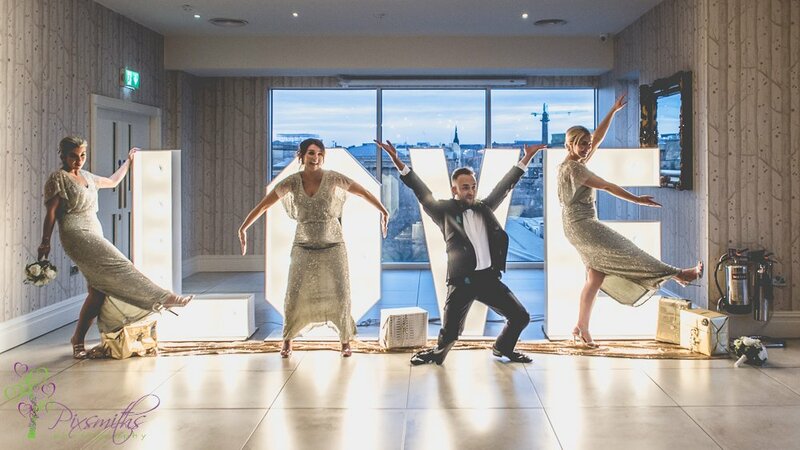 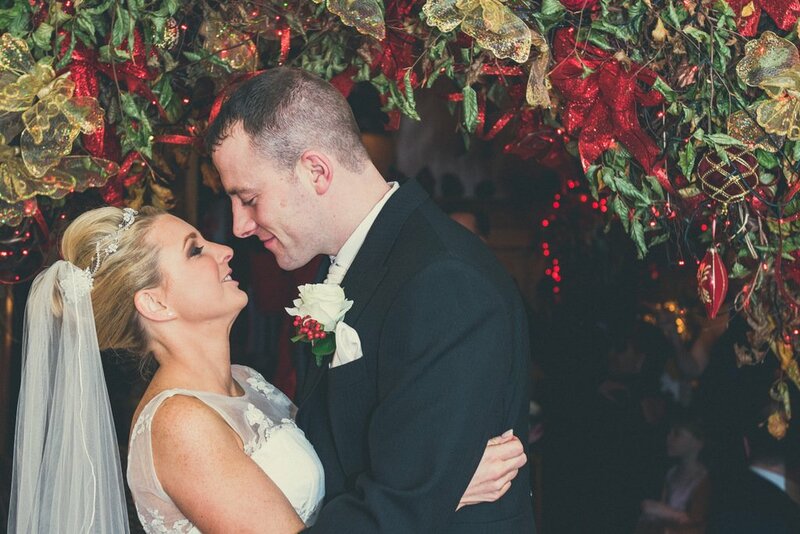 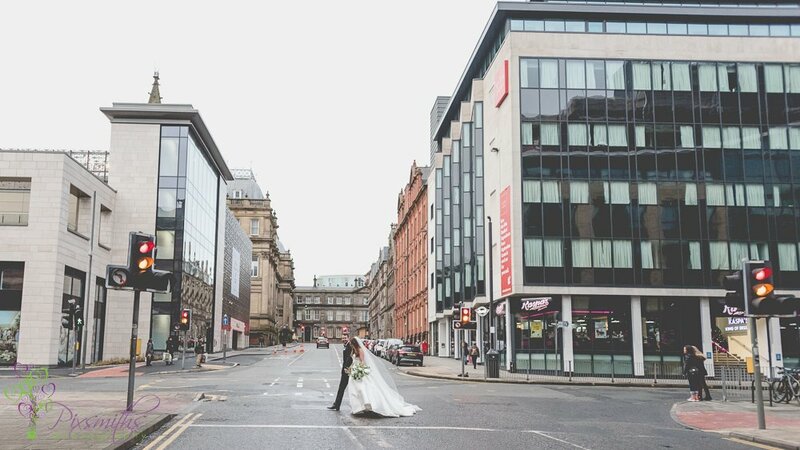 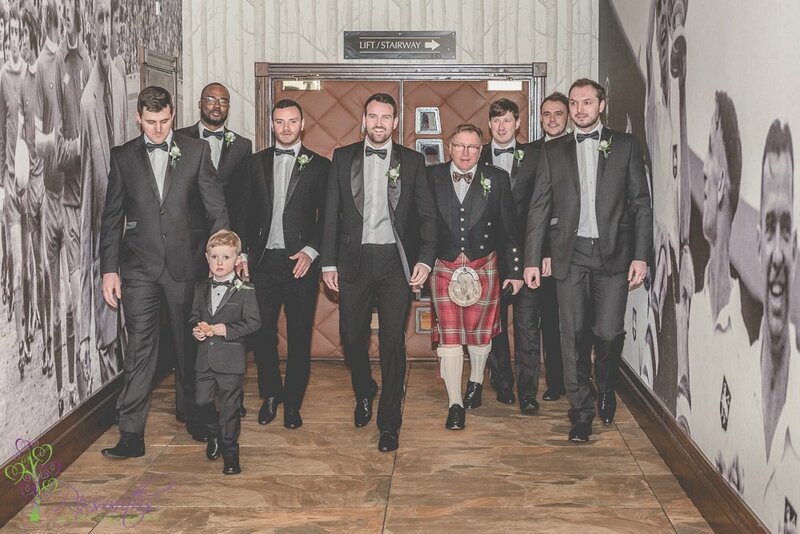 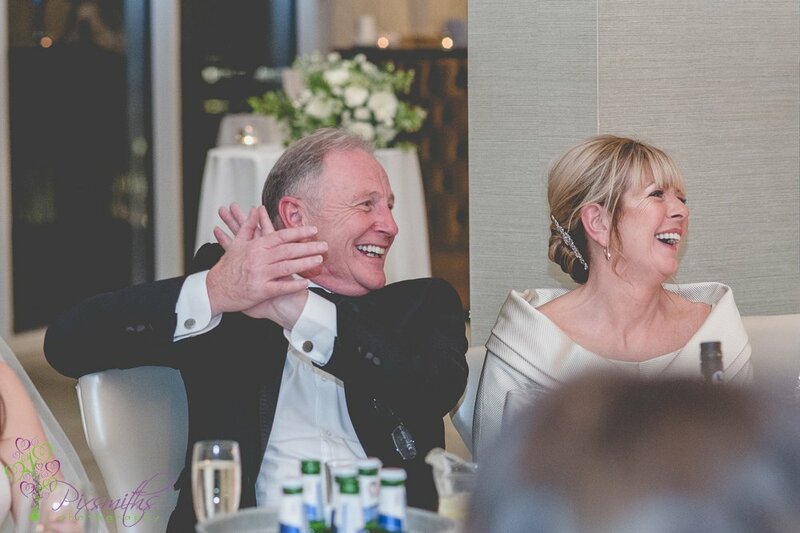 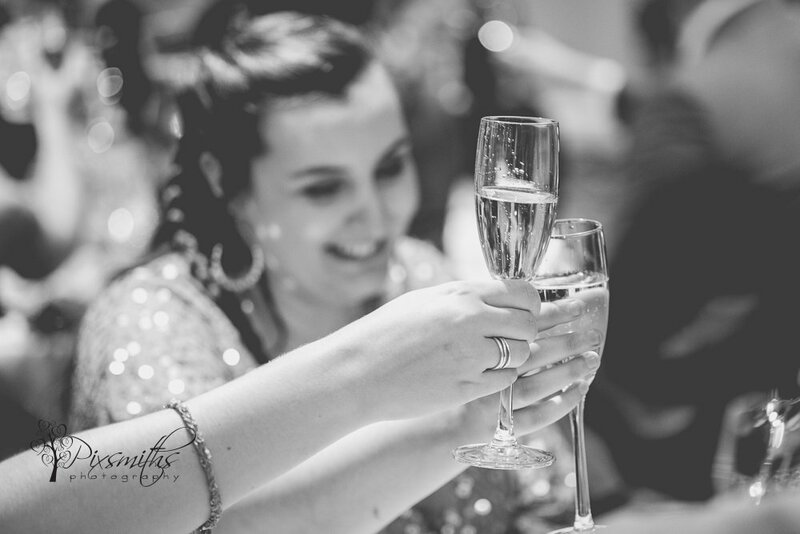 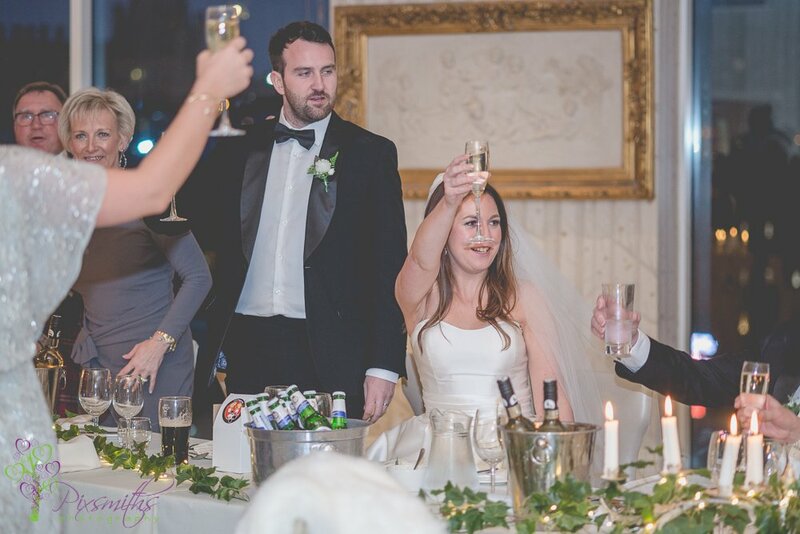 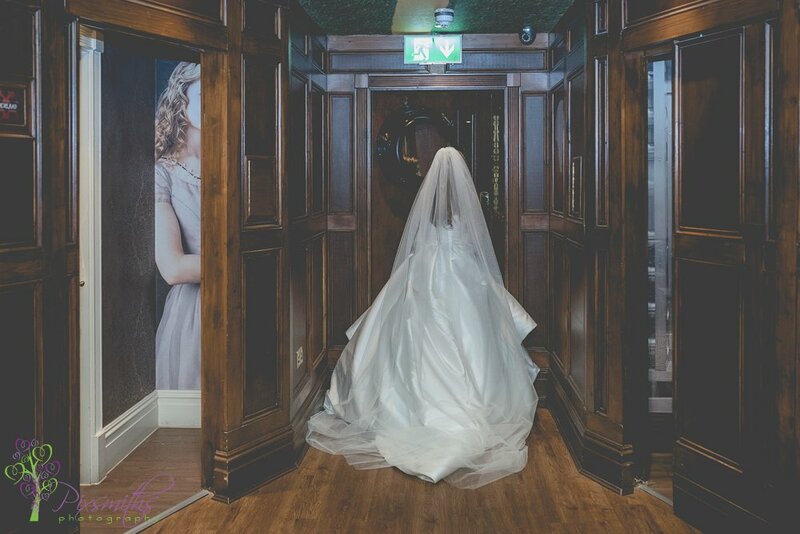 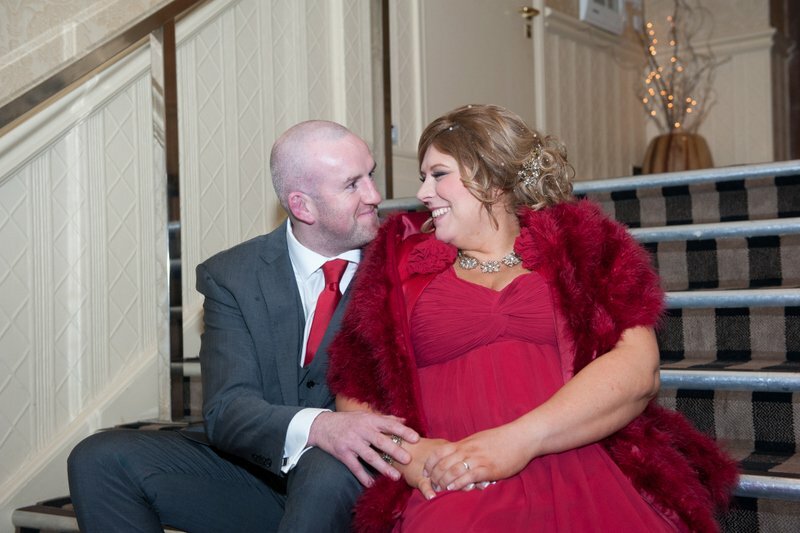 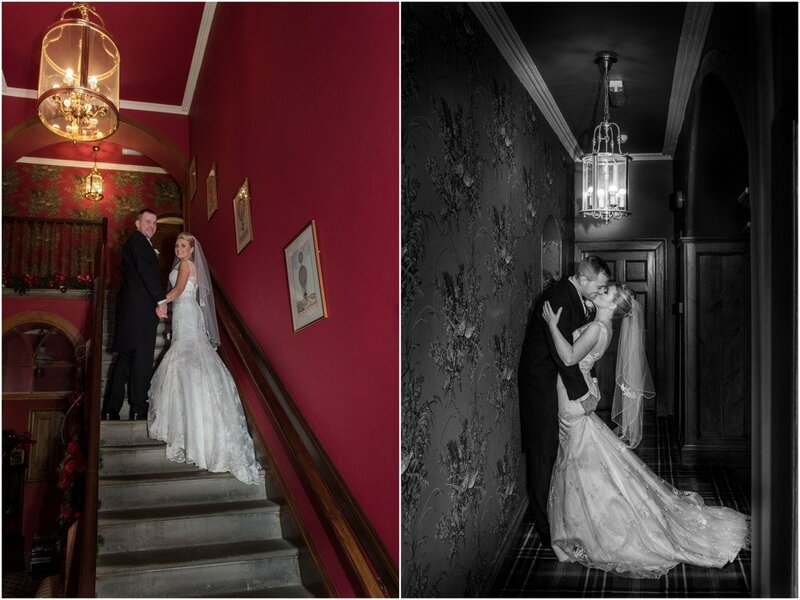 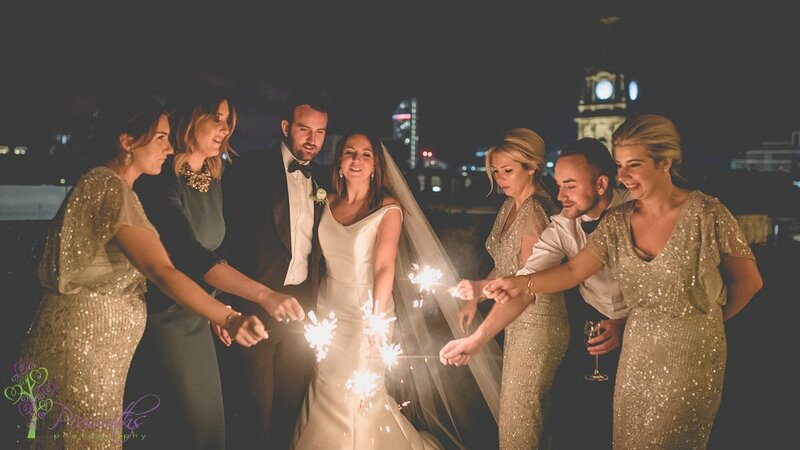 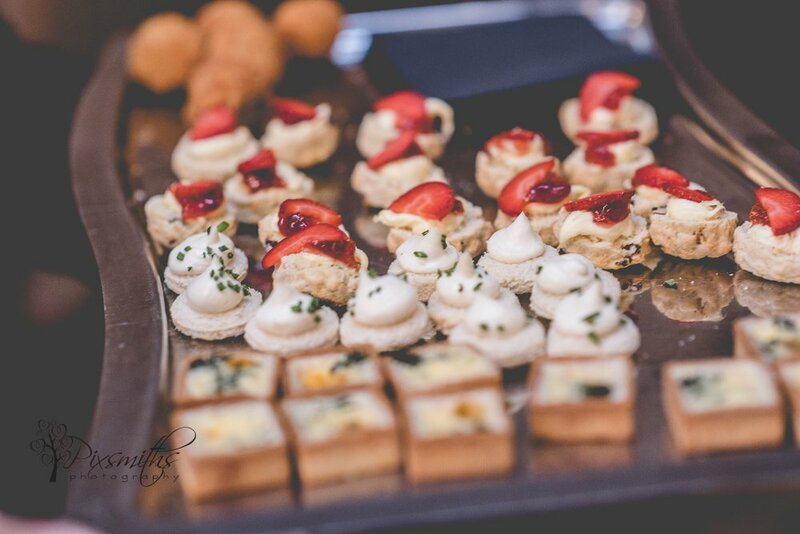 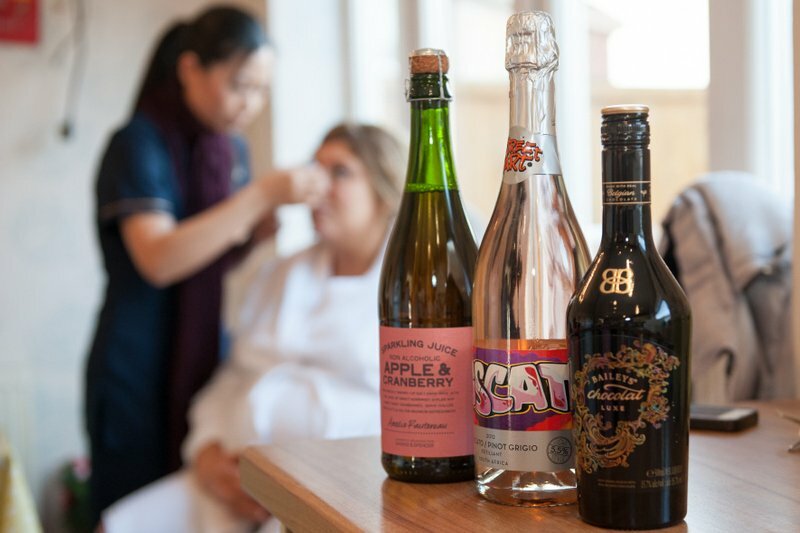 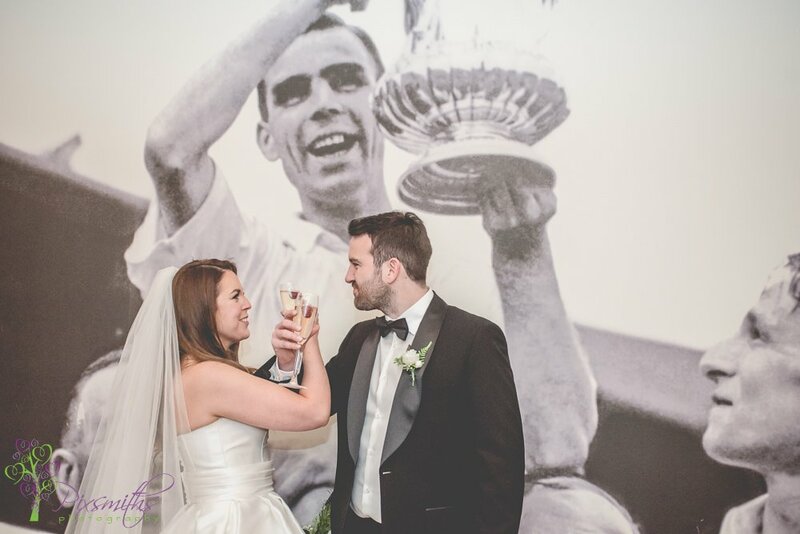 If you love these images and are planning a Shankly Hotel wedding we’d love to hear from you. 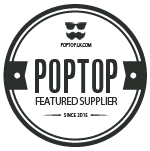 Simply fill in our contact form and we will be in touch as soon as possible. 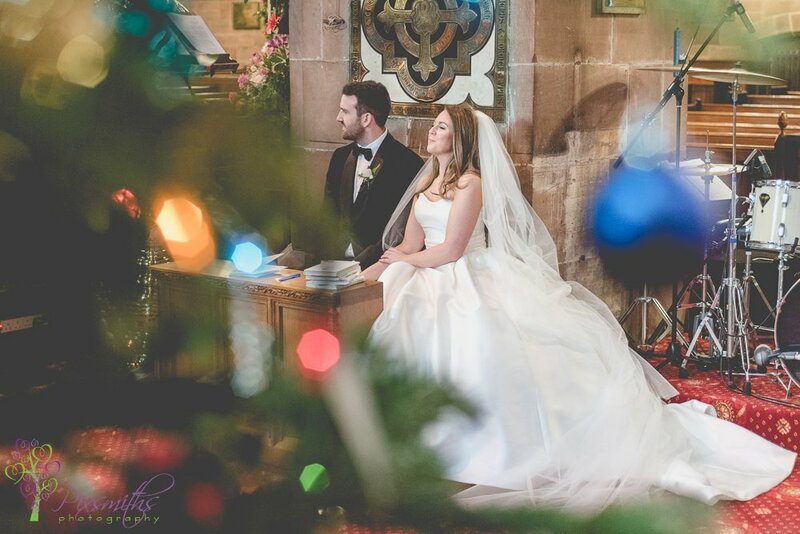 Our last wedding of 2015, and what a way to end a fantastic year with a Christmas wedding for Leanne and Scott, not quite the last day of the year but almost! 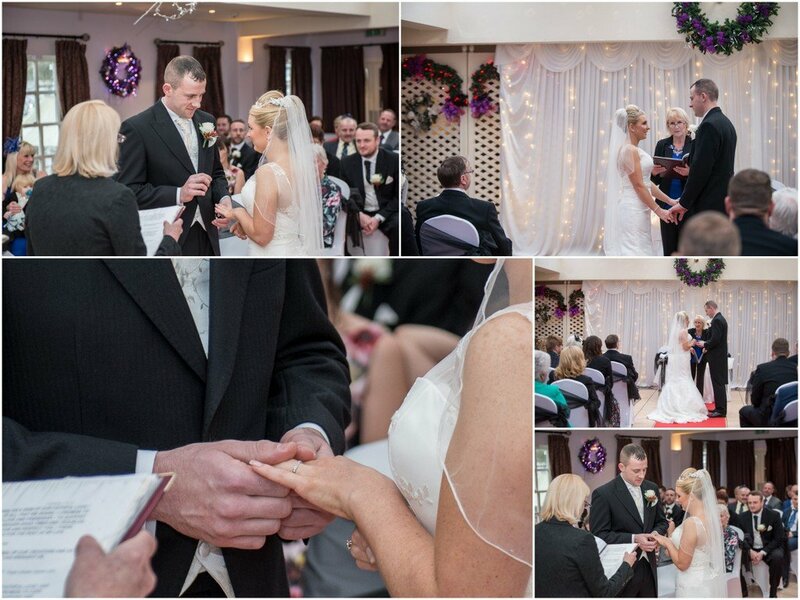 Scott and Leanne we had a fabulous day with you and overjoyed you had such a memorable day that we were privileged to capture for your memories. 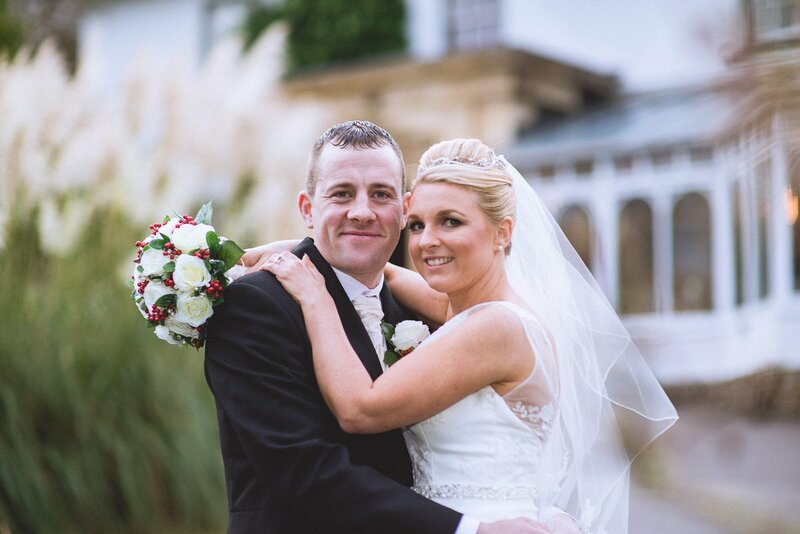 Leanne and Scott childhood sweethearts, the only ones for each other, how special and romantic is that! 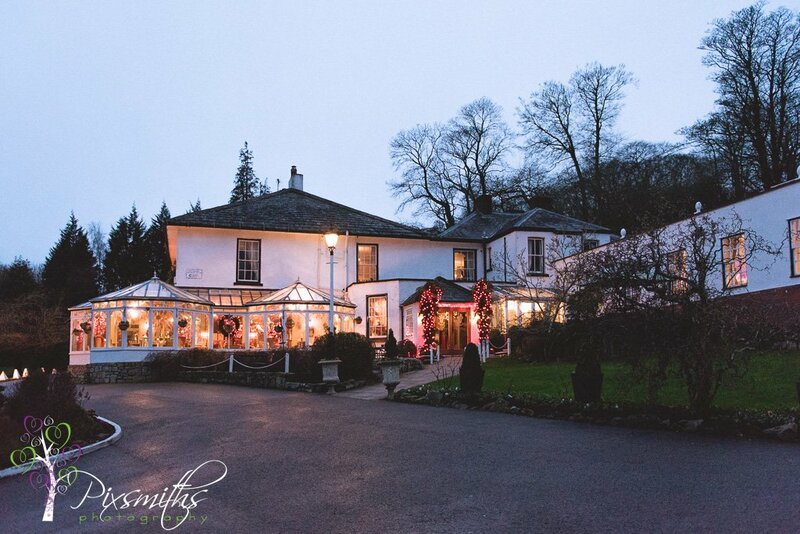 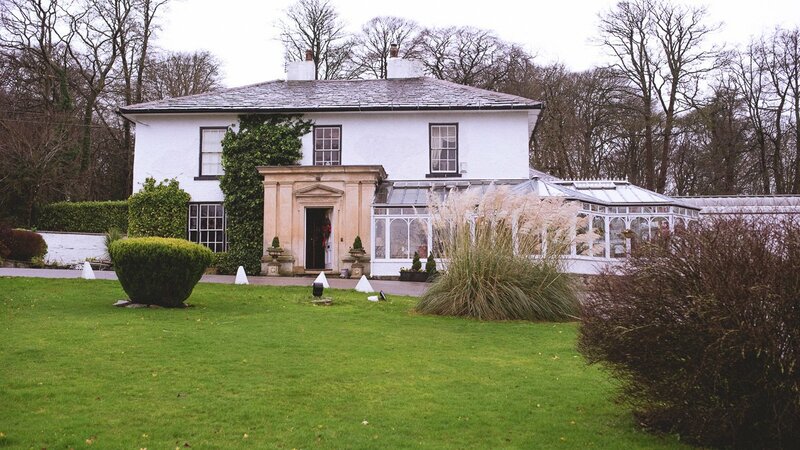 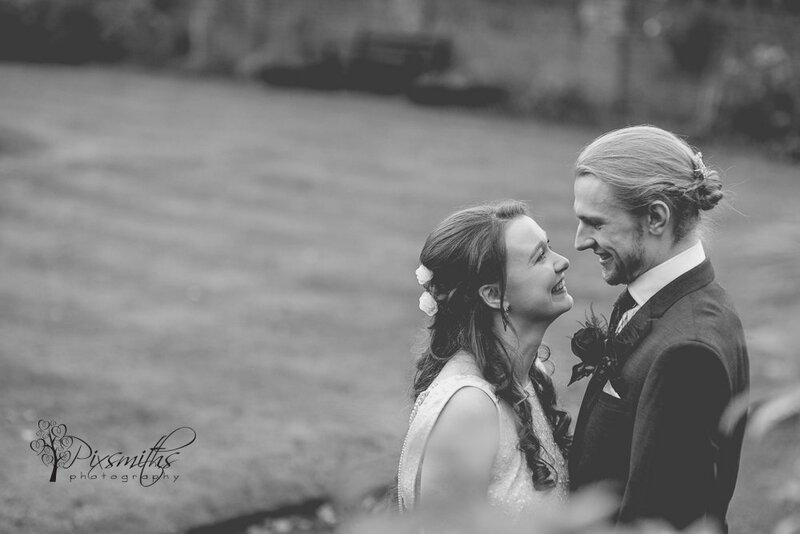 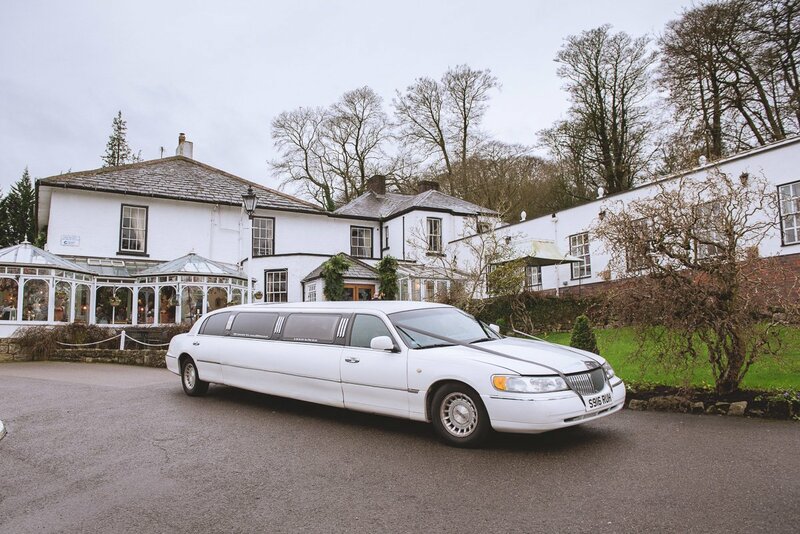 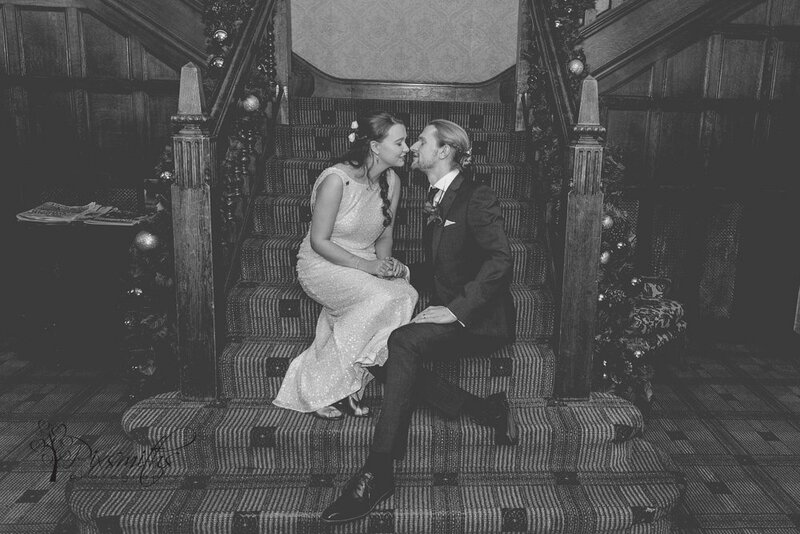 Been together 10 years and now an elegant black and white festive wedding for them at the beautiful Plas Hafod country House hotel sealed a perfect day. 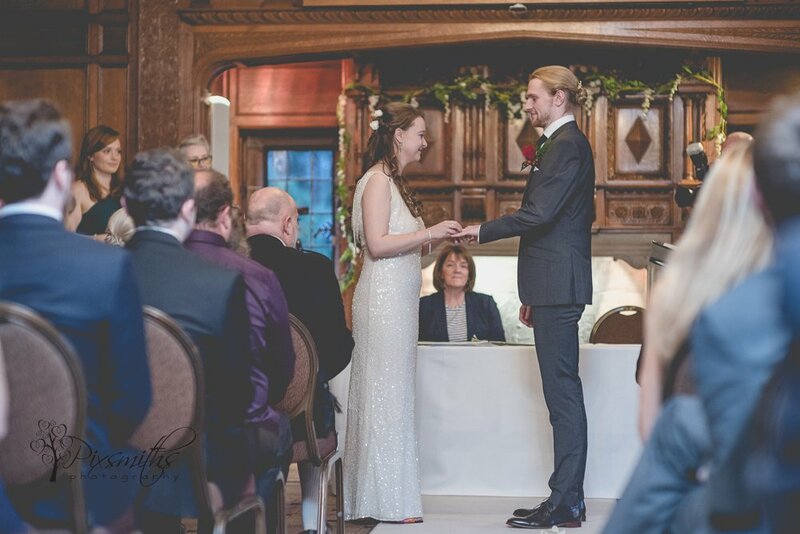 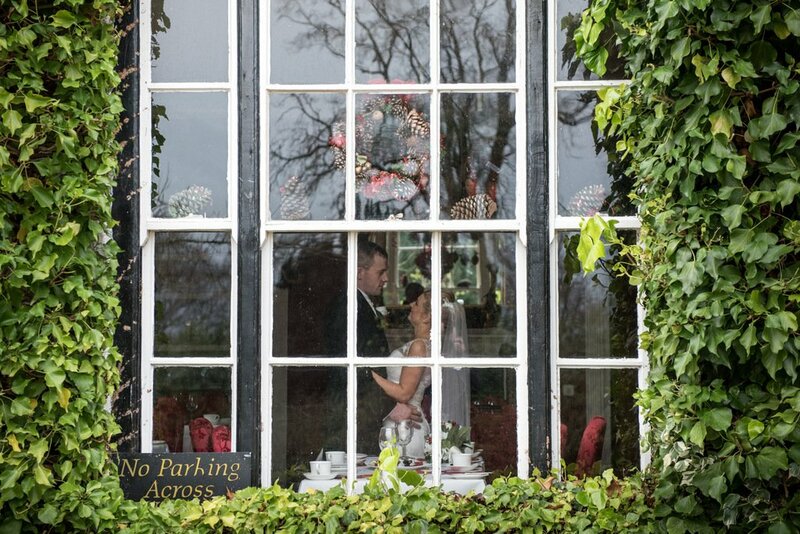 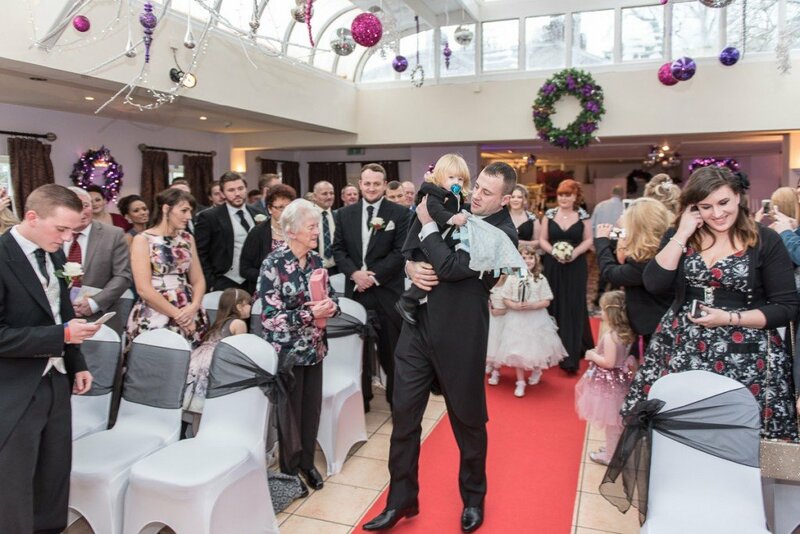 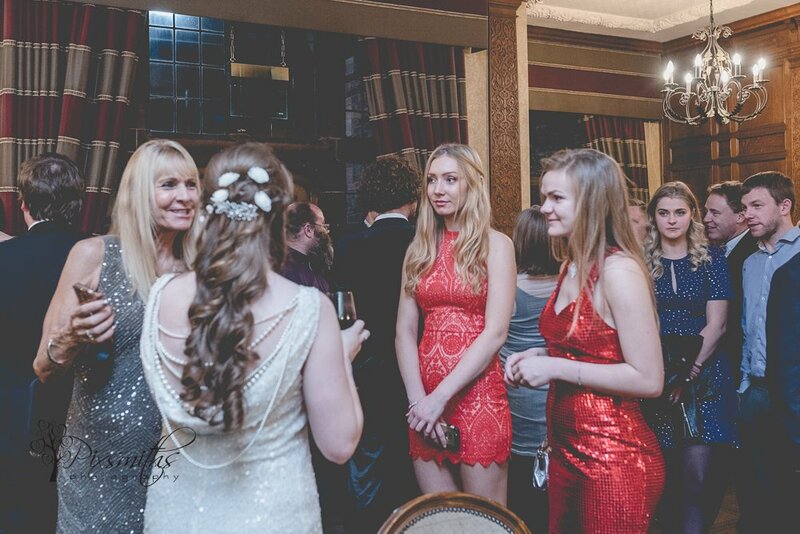 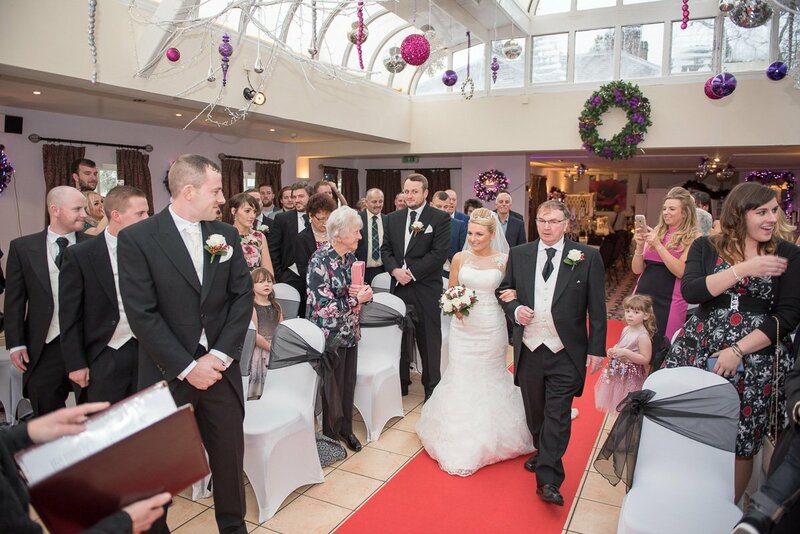 Plas Hafod is a perfect winter wedding venue with it light airy conservatory room to make the most of winter light and also has ample room inside for group photos if needed. 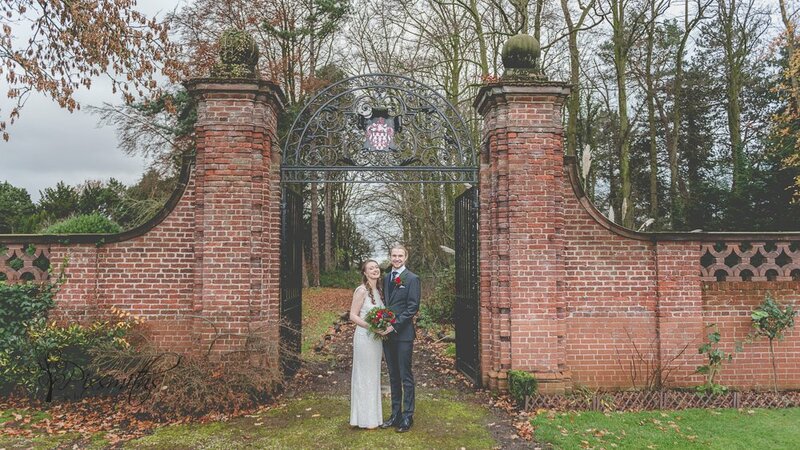 This was the day of Storm Frank supposedly but it hardly bothered us, a little rain intermittently, but a breath of air for a few group shots and portraits was most refreshing. 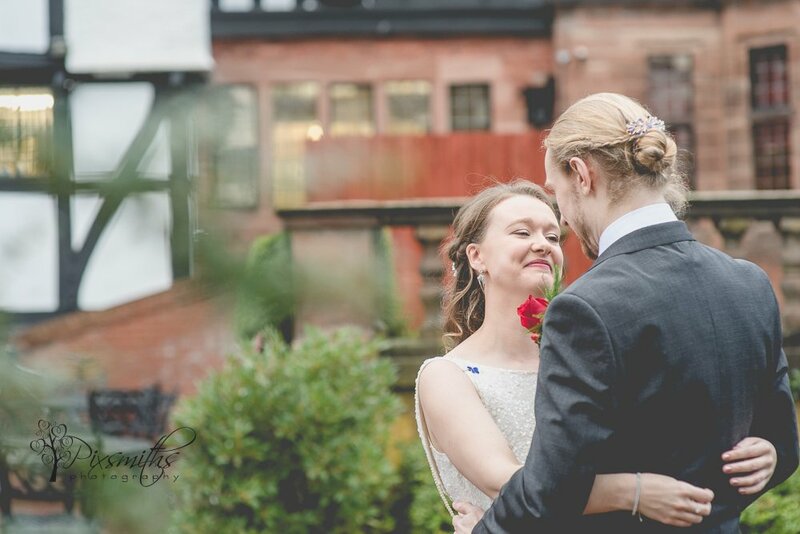 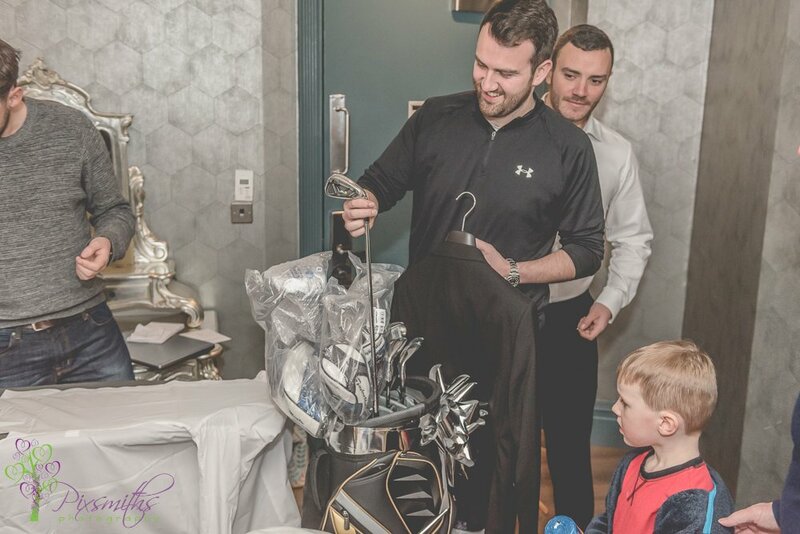 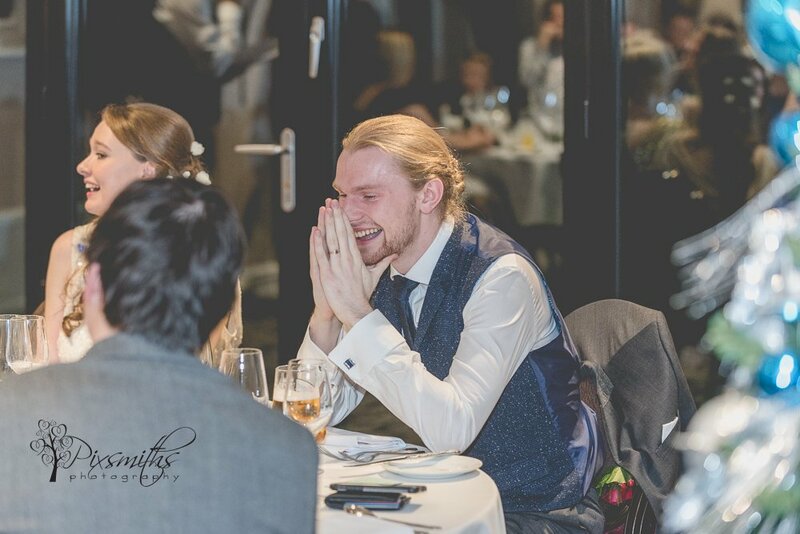 Fantastic choice guys, hope you enjoy this little blog post of your highlights and wish you much continued happiness. 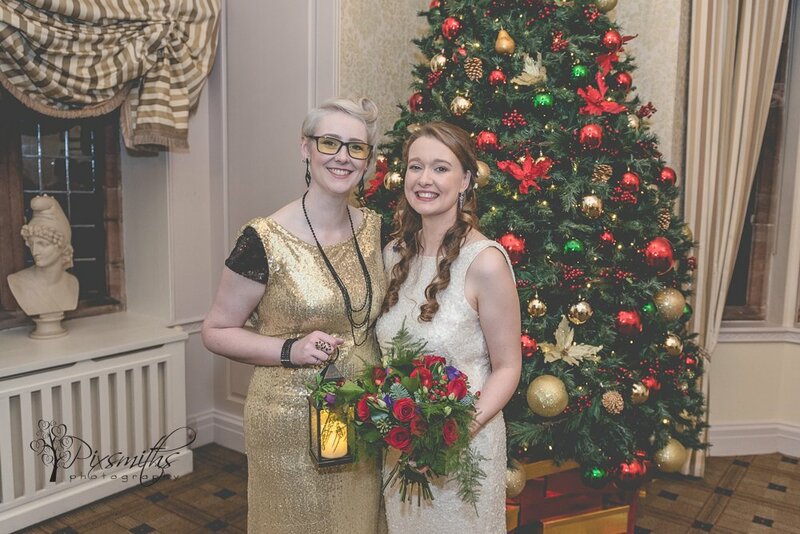 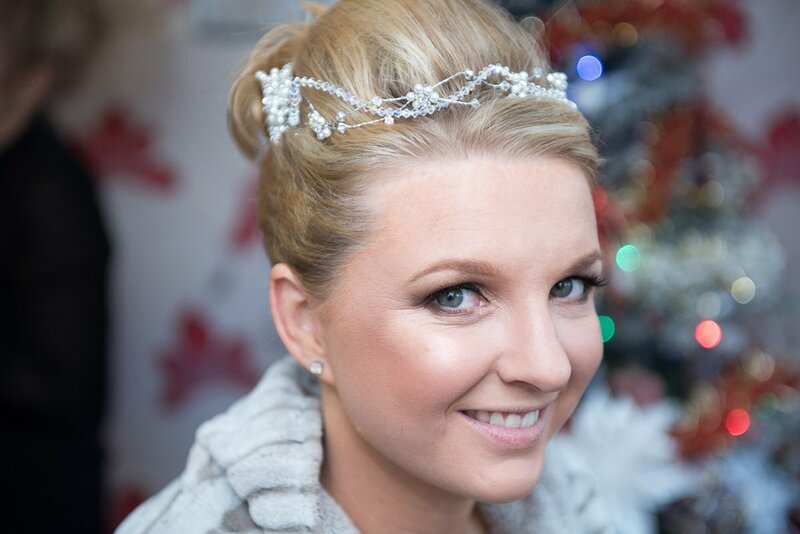 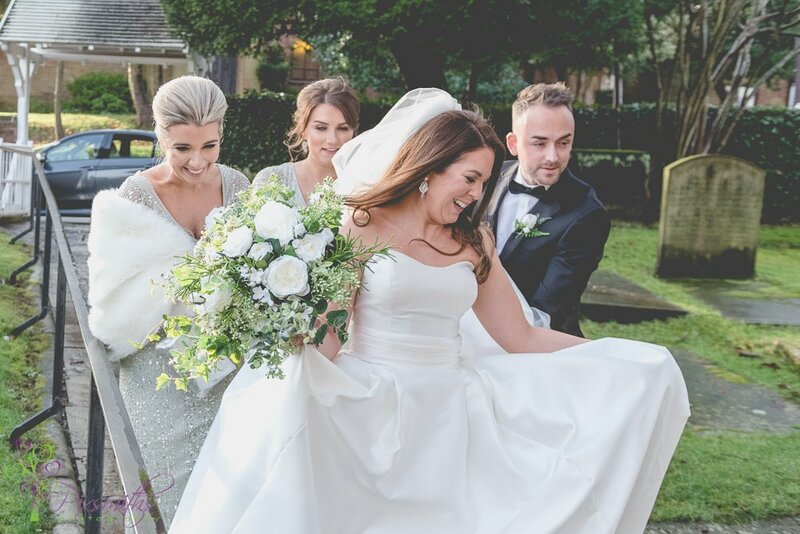 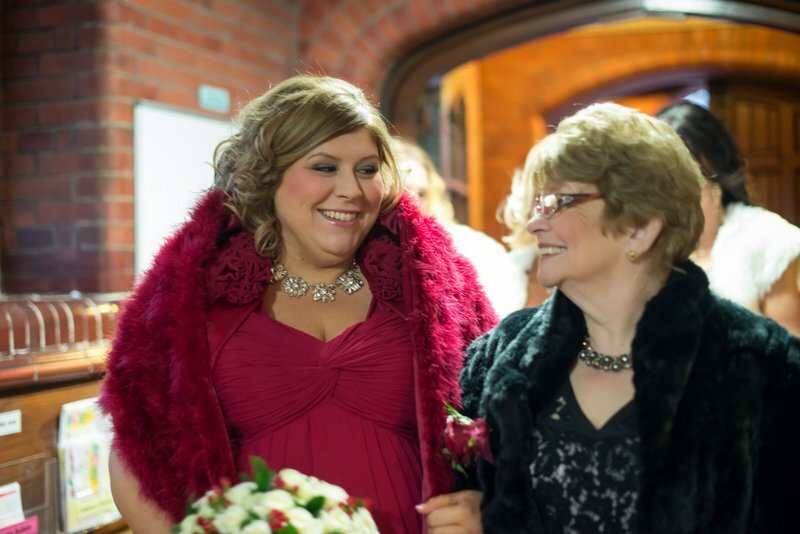 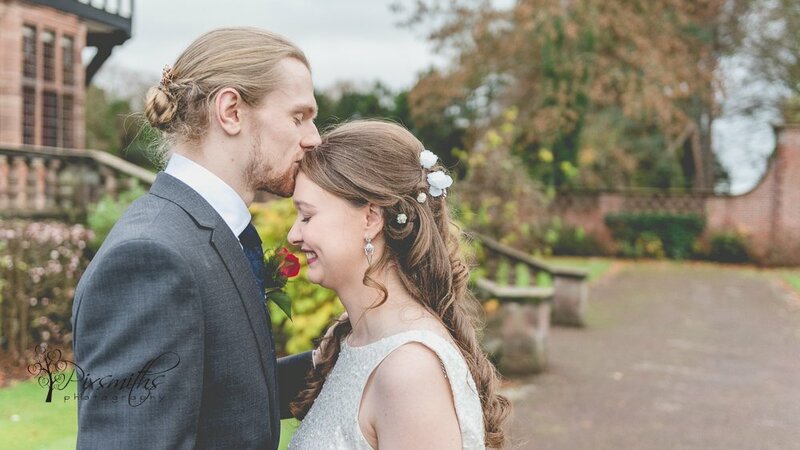 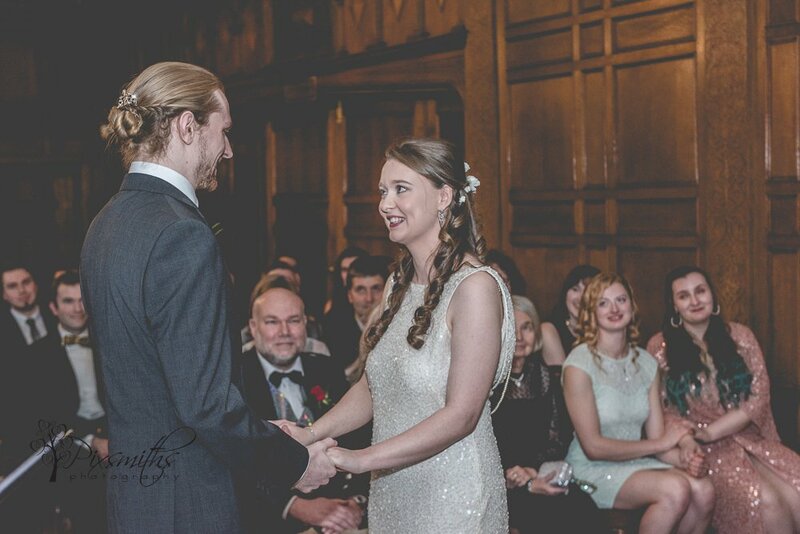 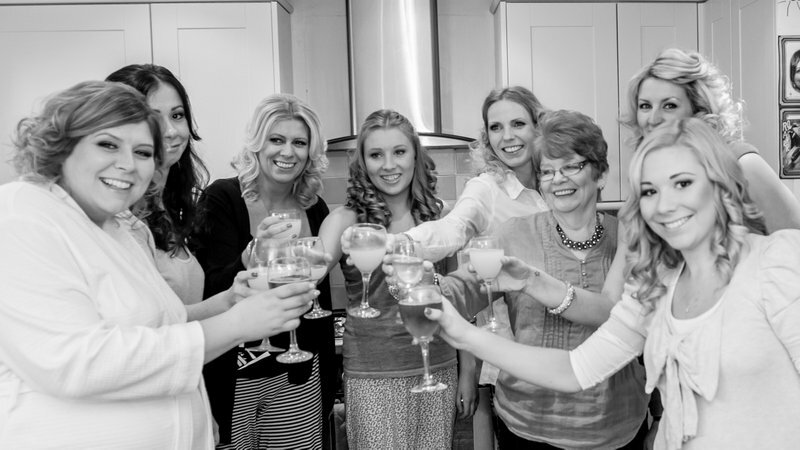 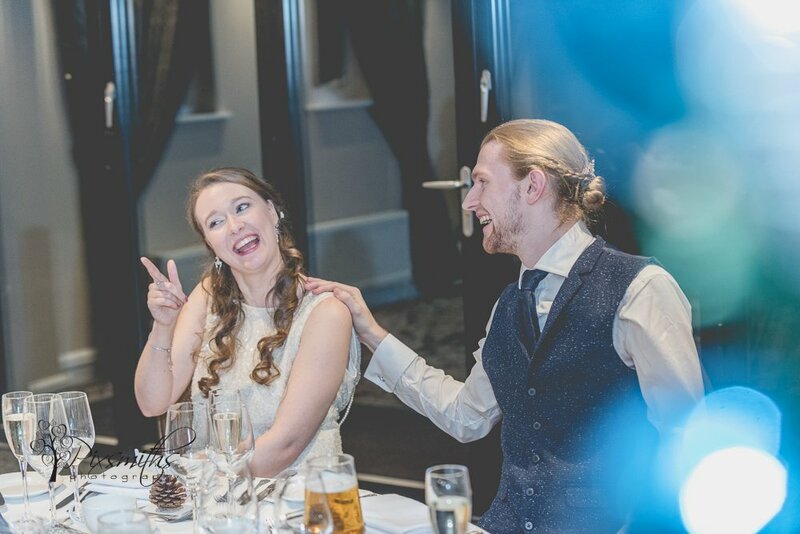 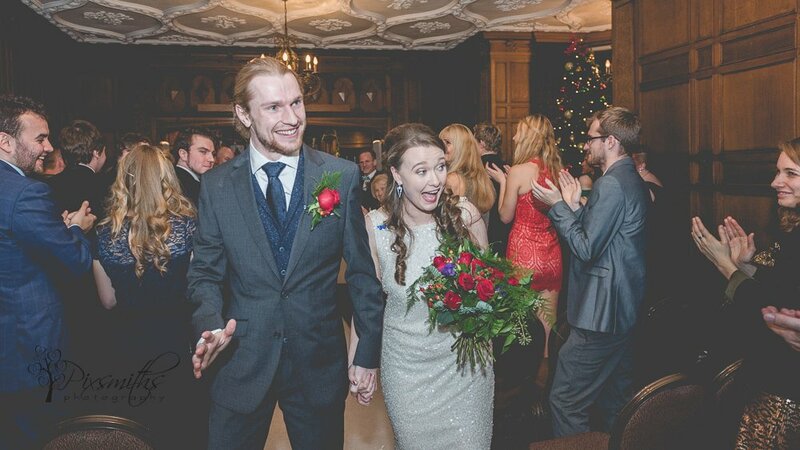 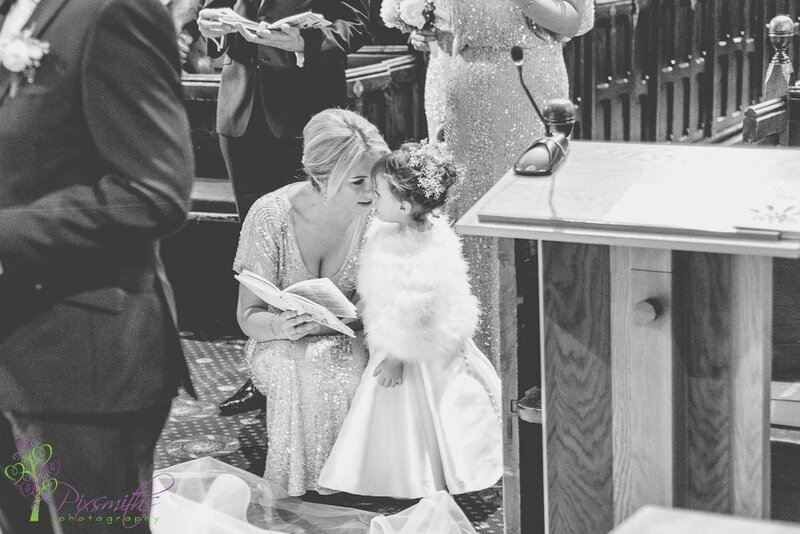 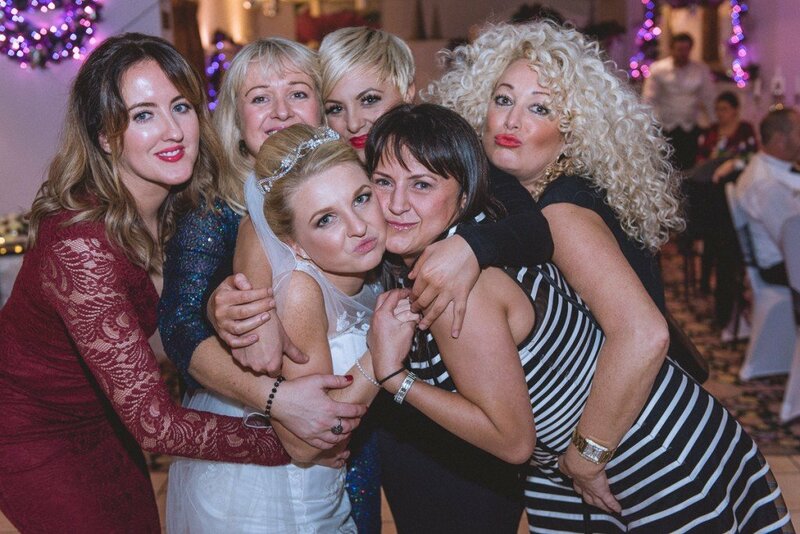 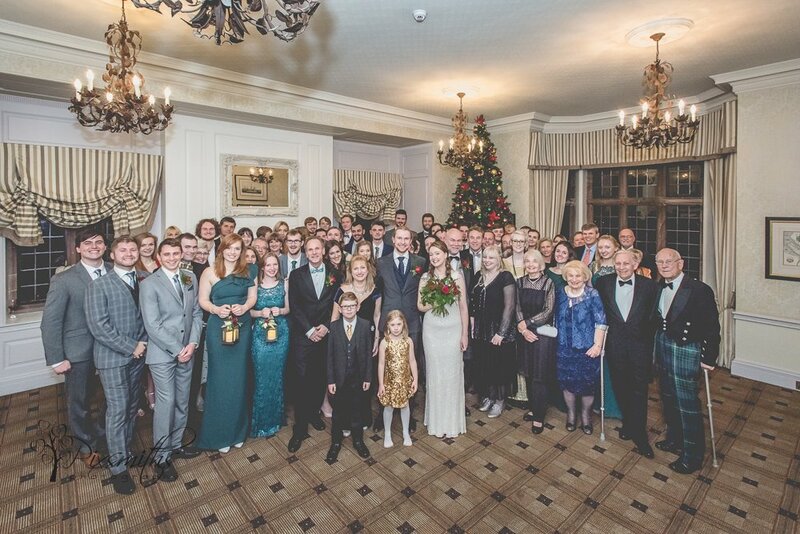 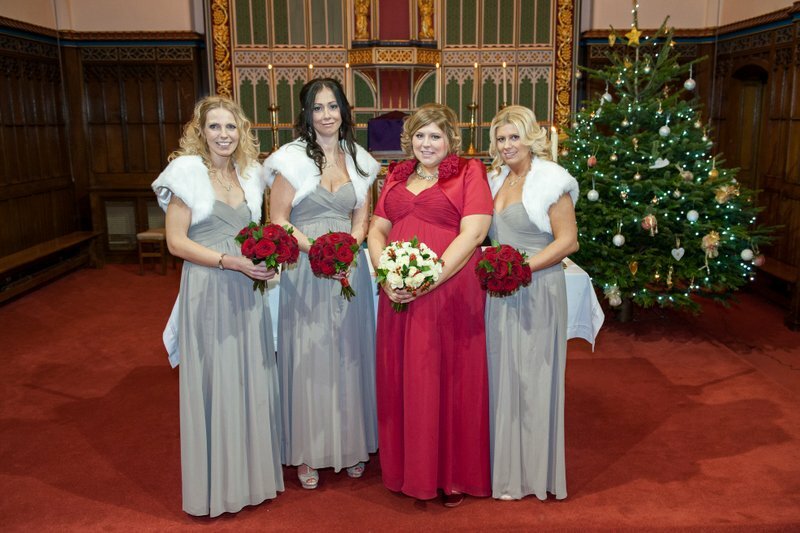 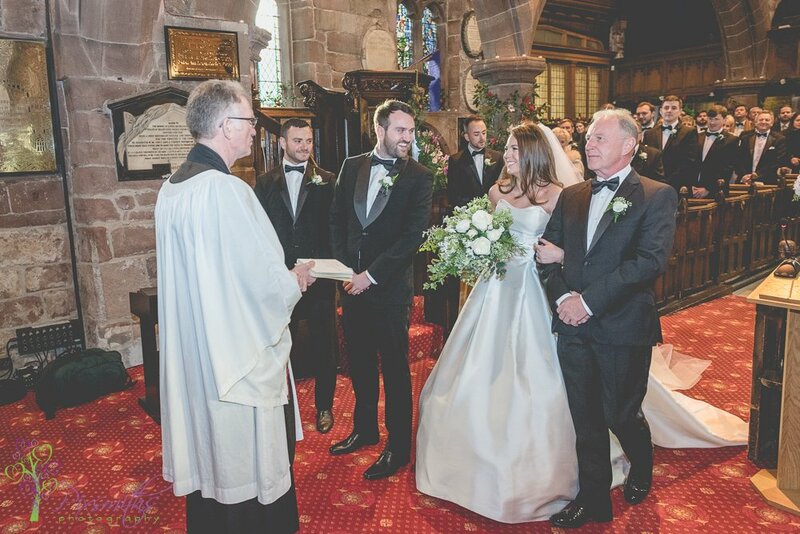 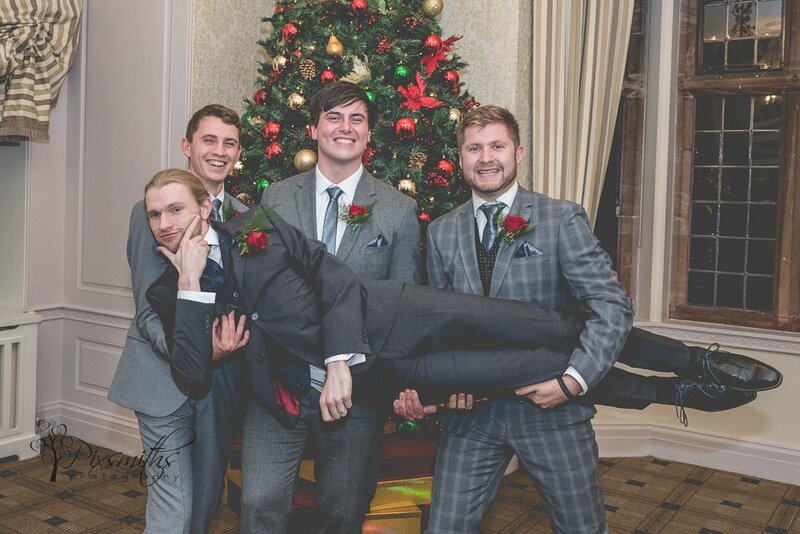 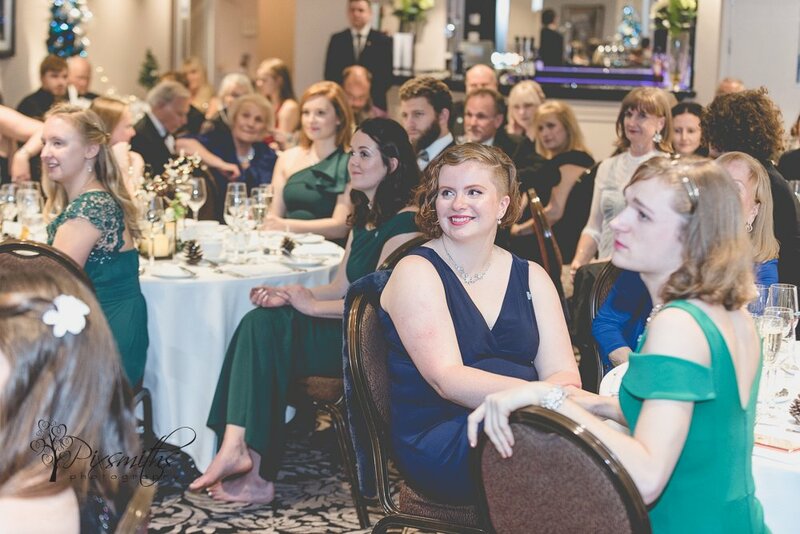 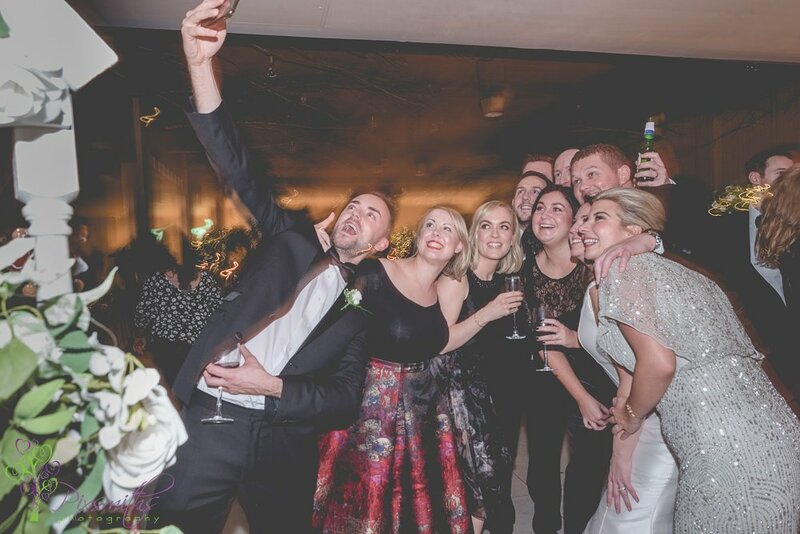 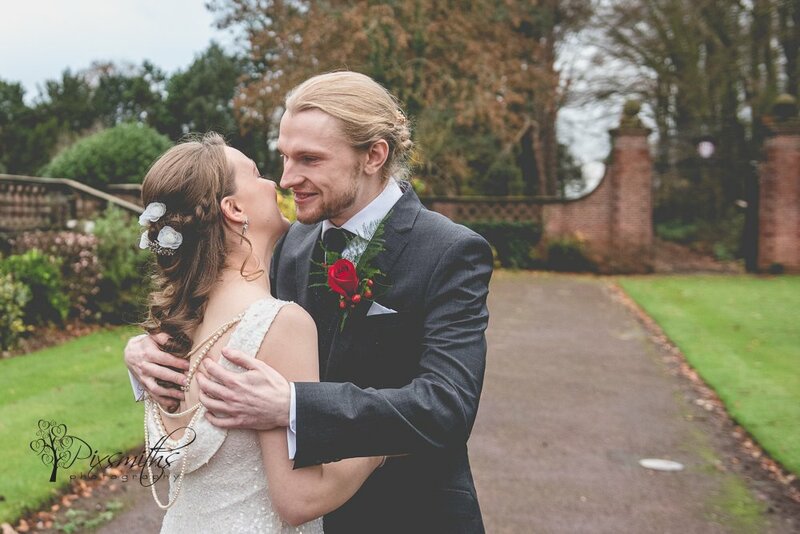 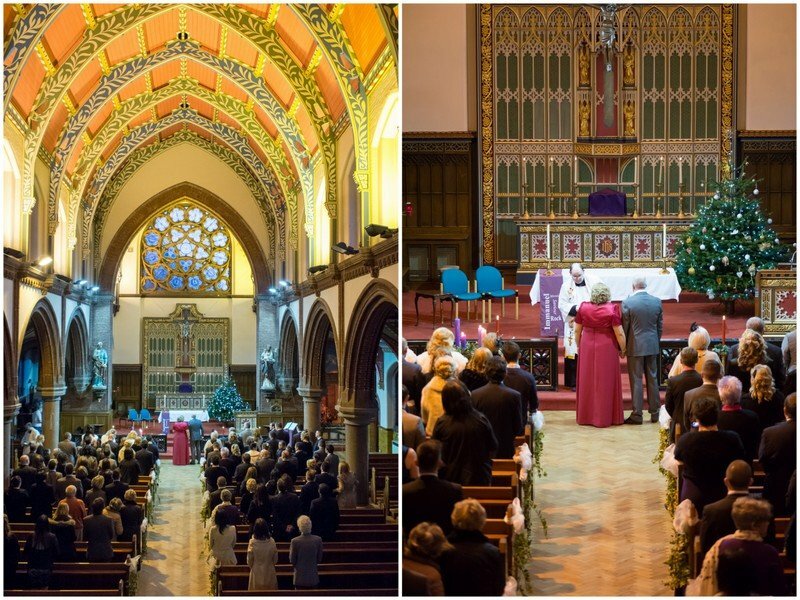 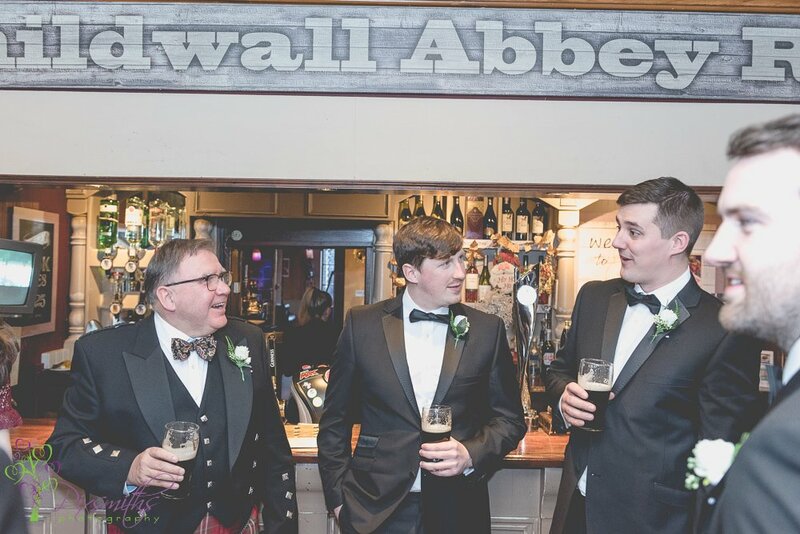 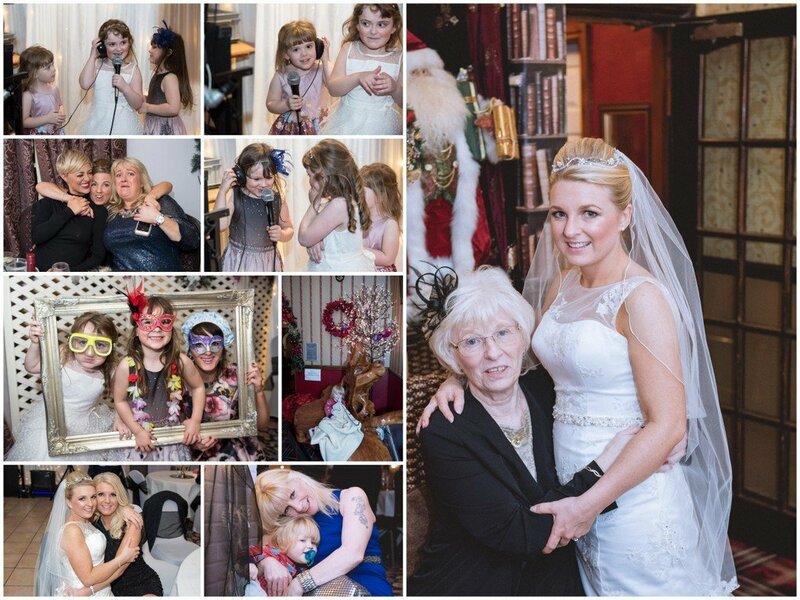 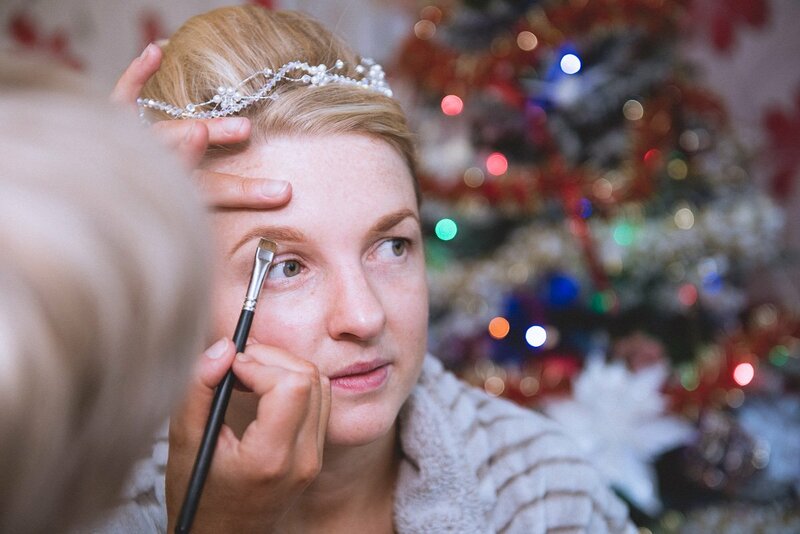 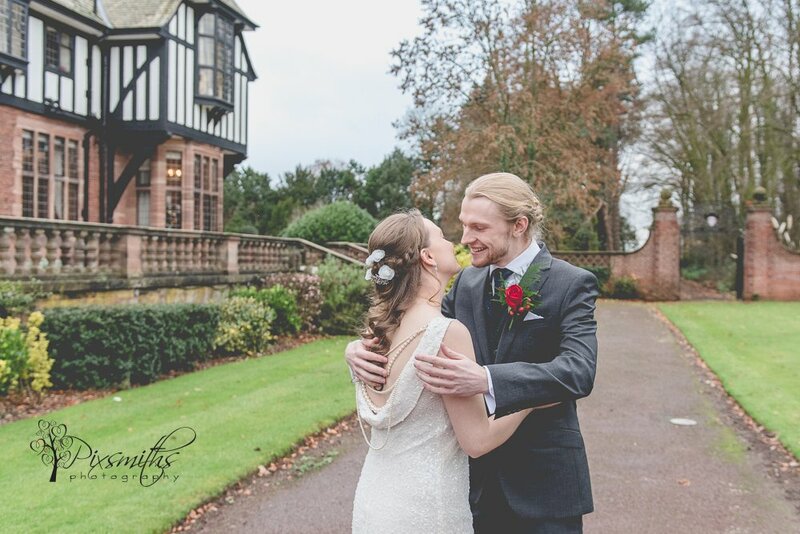 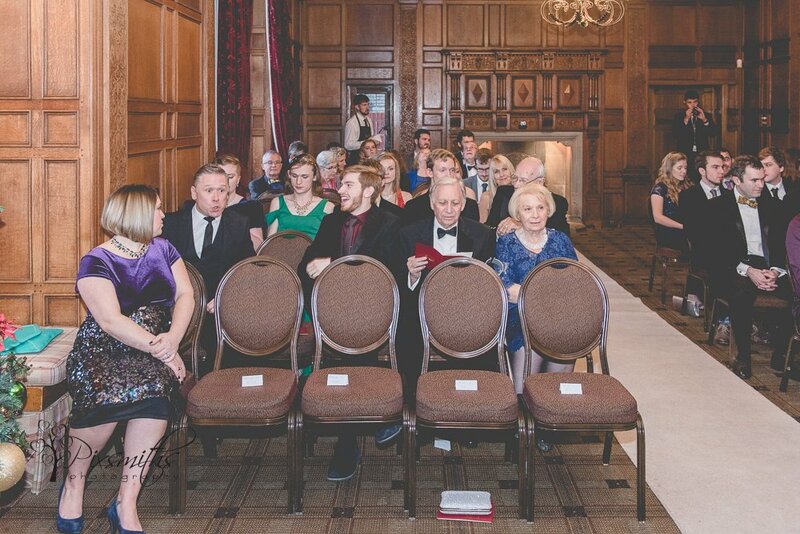 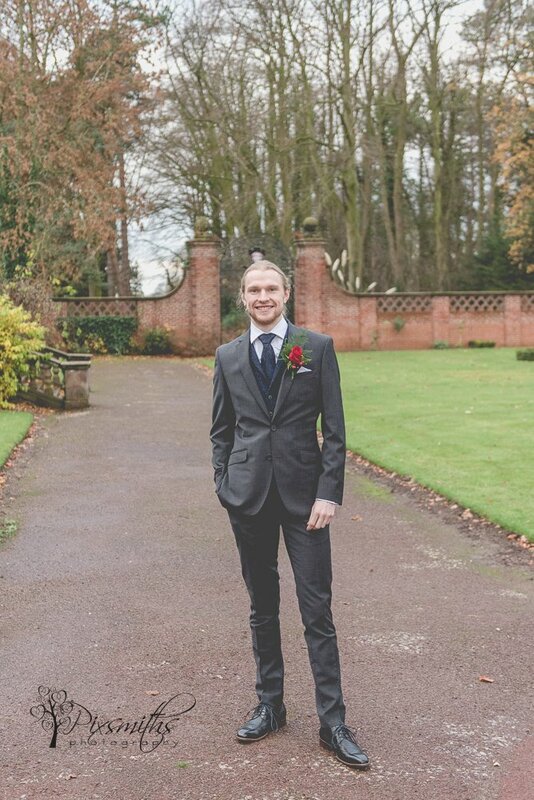 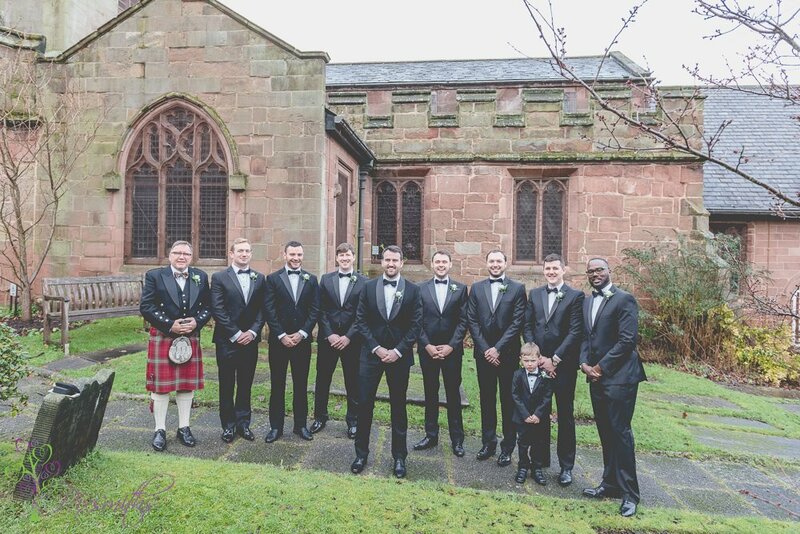 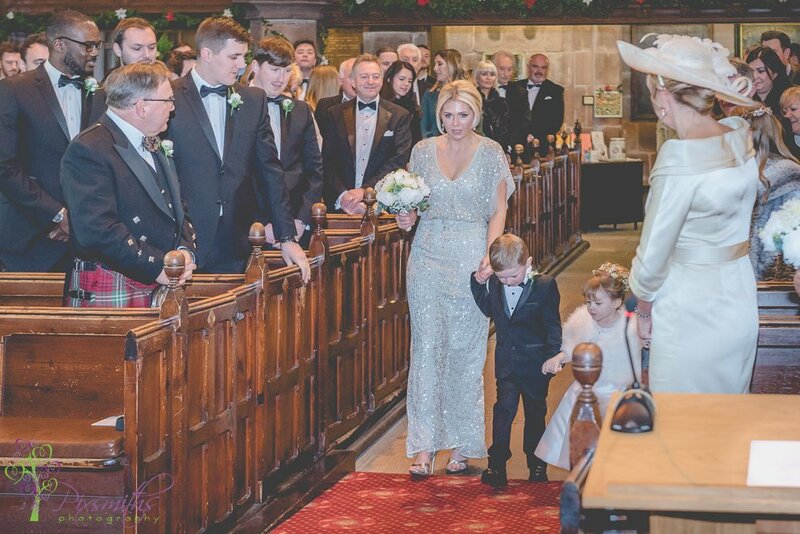 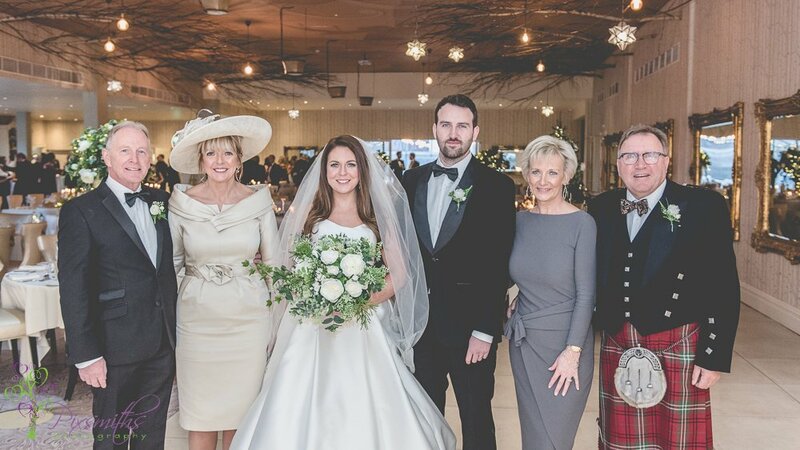 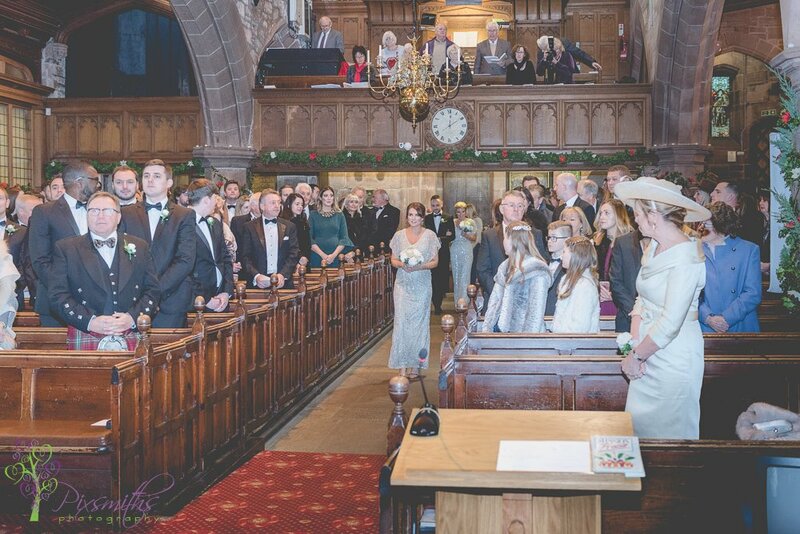 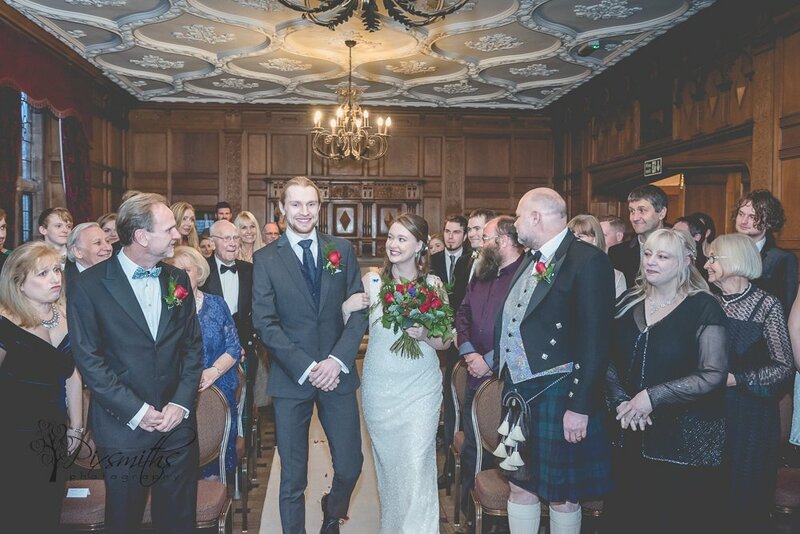 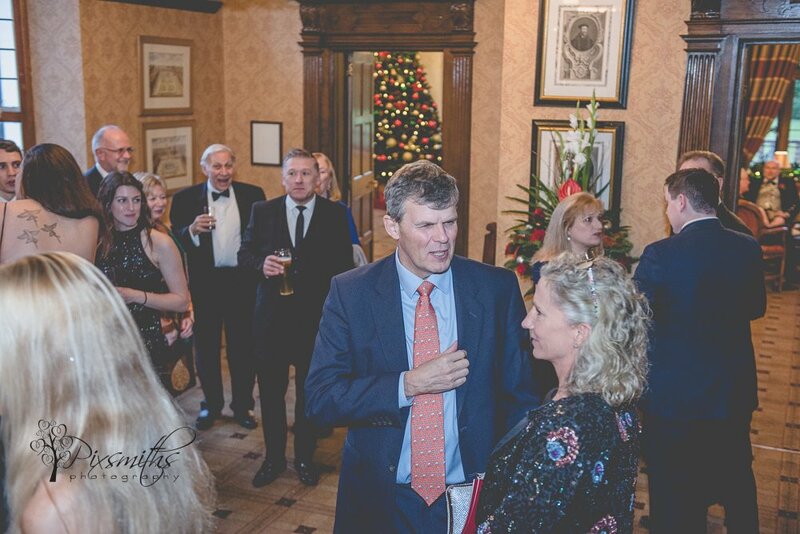 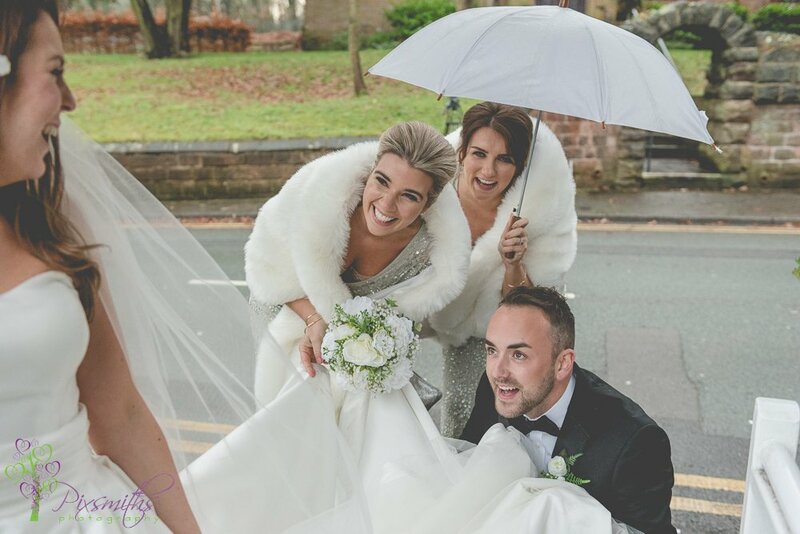 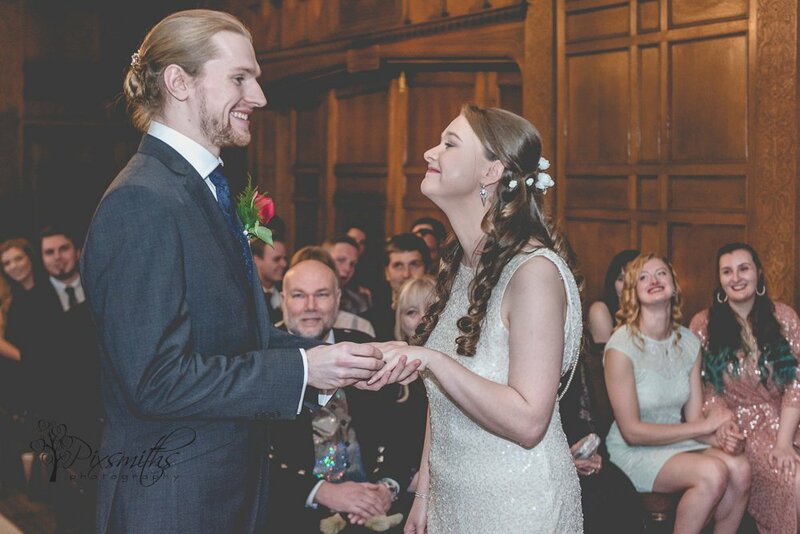 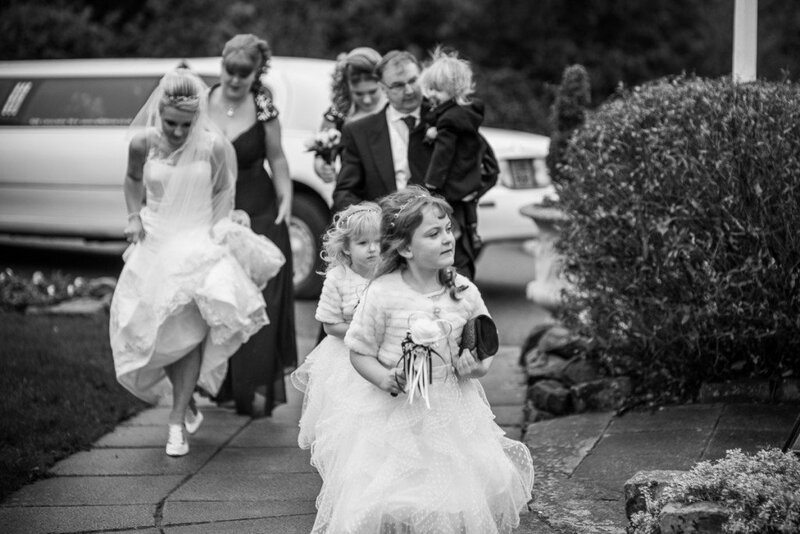 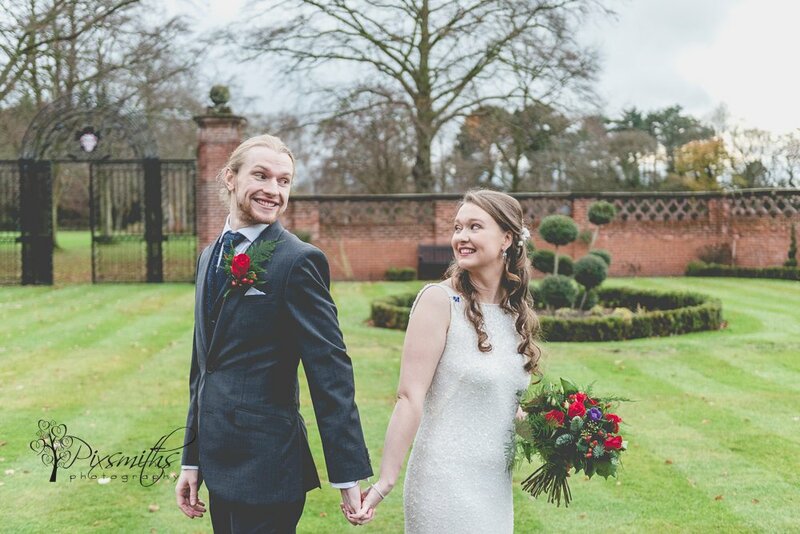 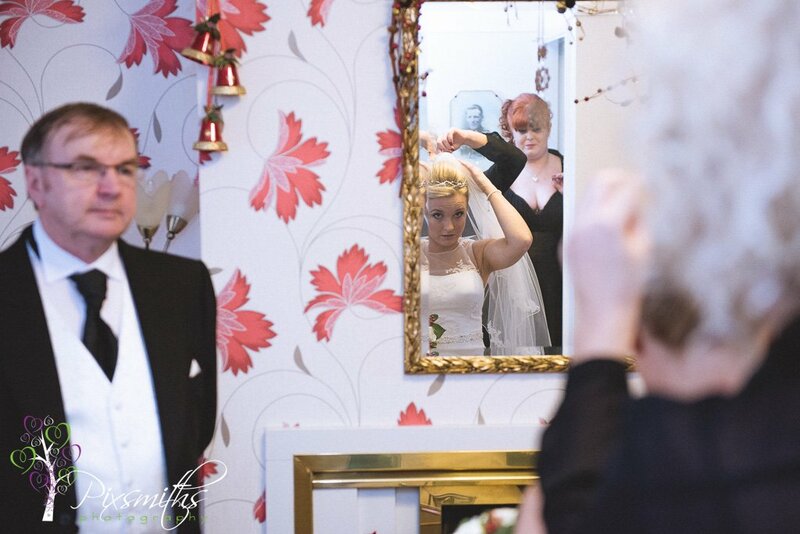 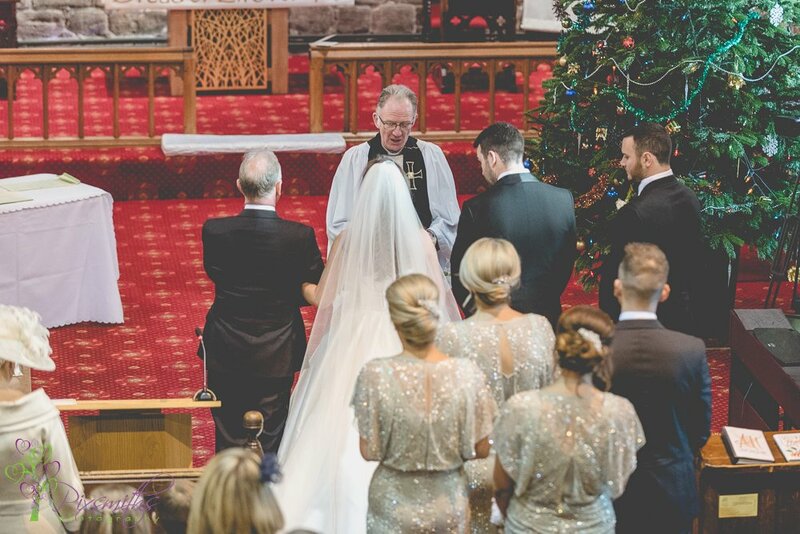 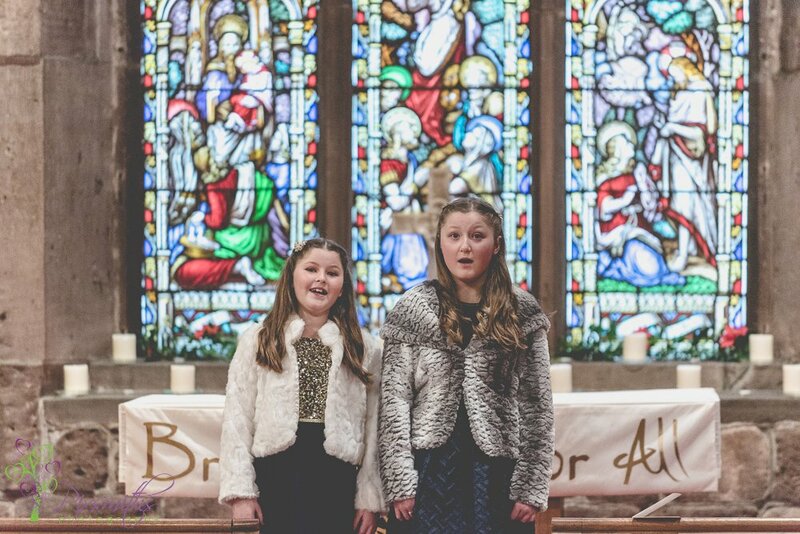 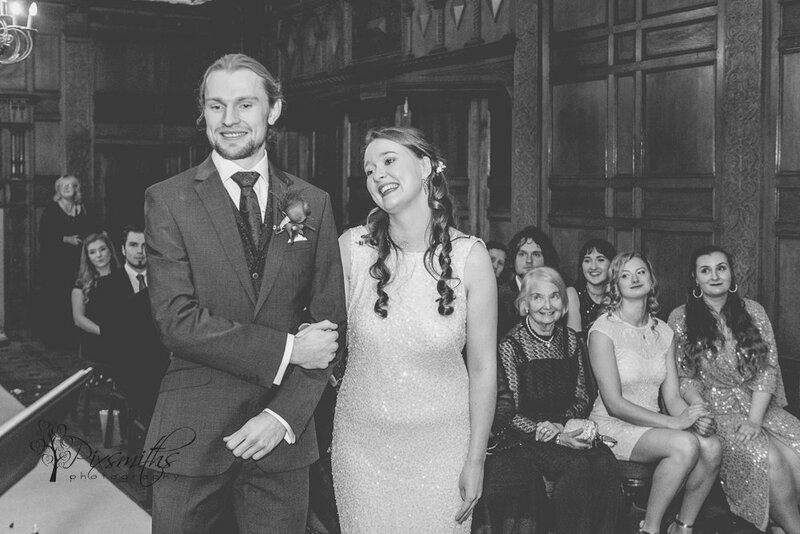 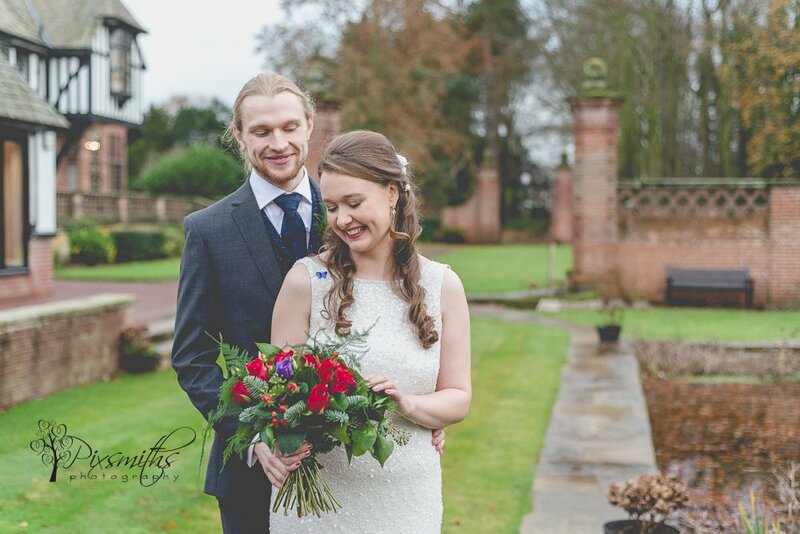 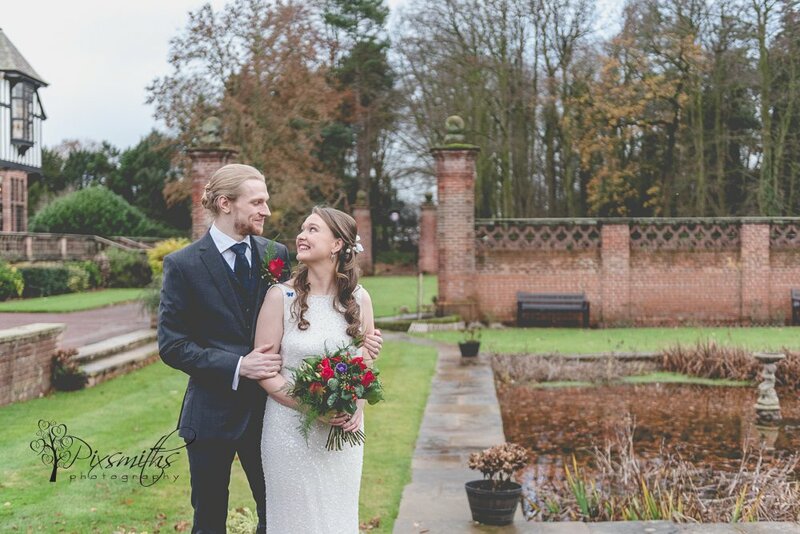 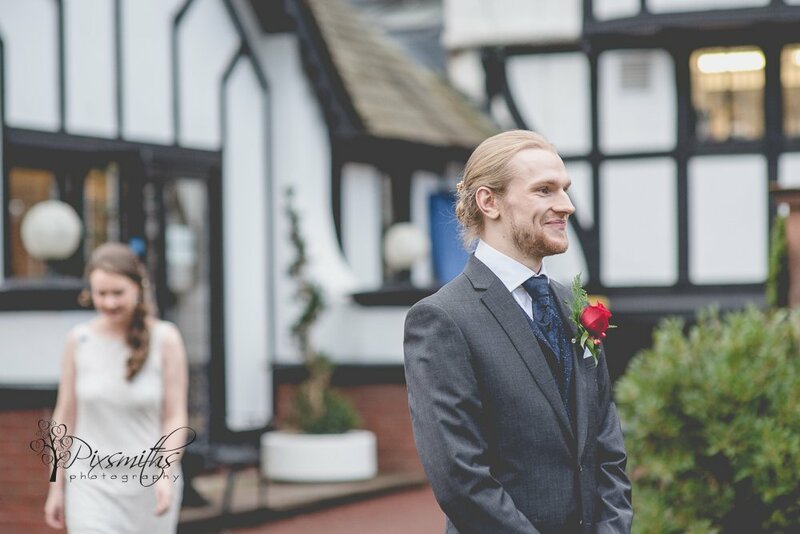 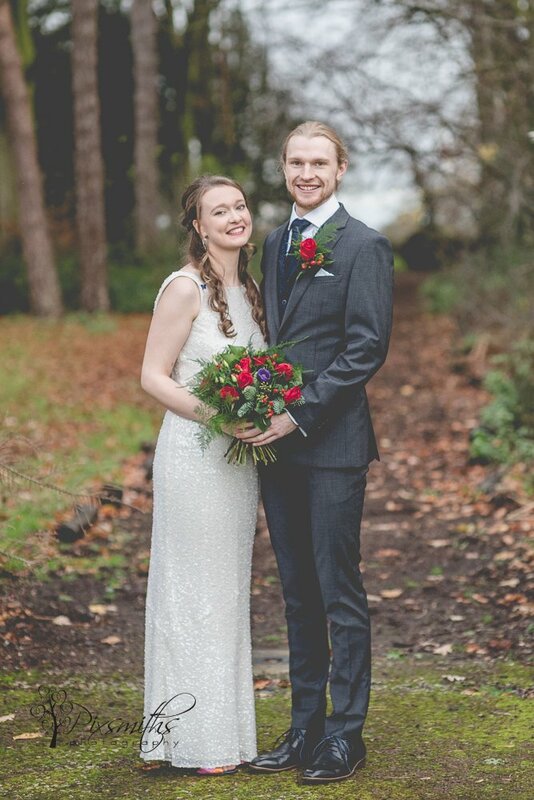 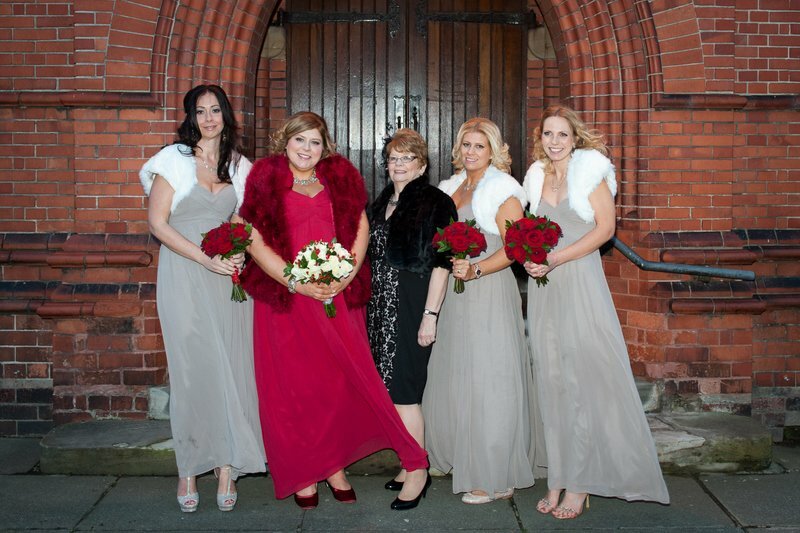 A Christmas Wirral Wedding with all the trimmings! 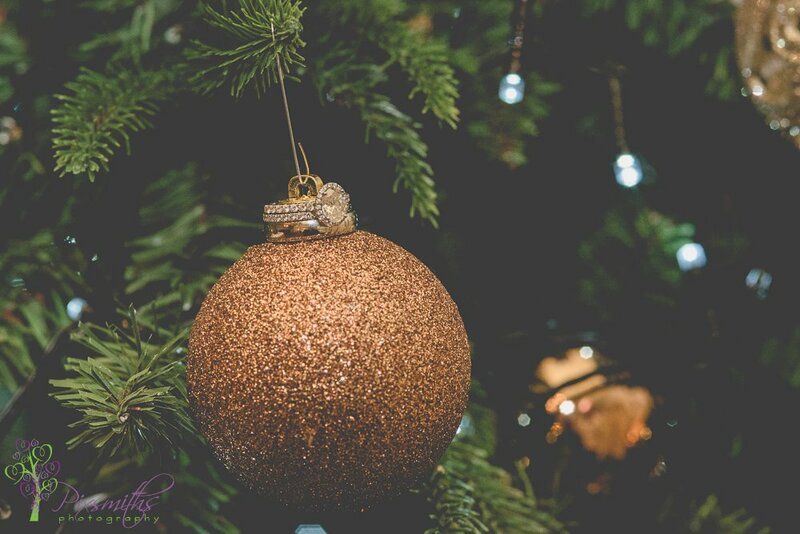 2 weeks to go to Christmas and and Wirral wedding photographers Pixsmiths, had no idea we would soon be shooting a Christmas Wirral wedding. 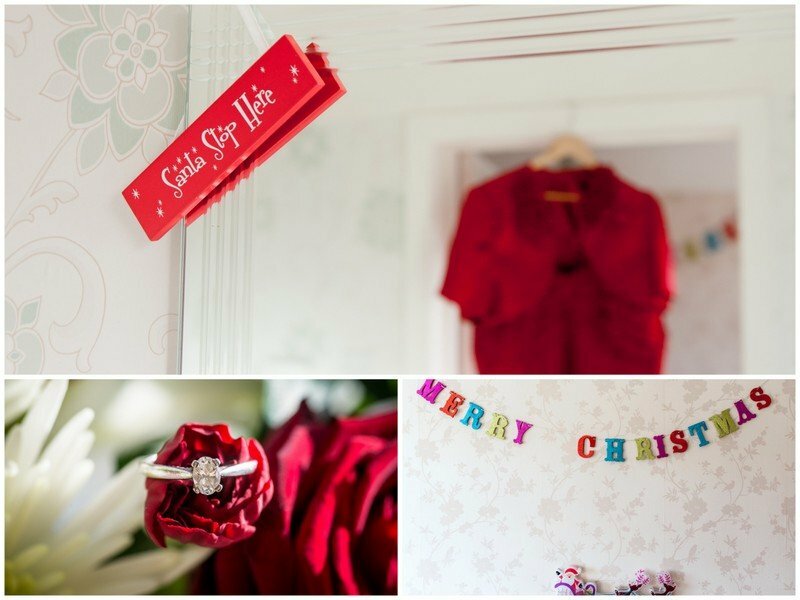 So dash round, shopping done and pressies wrapped time to get ready for a wedding the last Saturday before Christmas – coming to the rescue for Sarah and Richard when their original photographer was now unavailable. 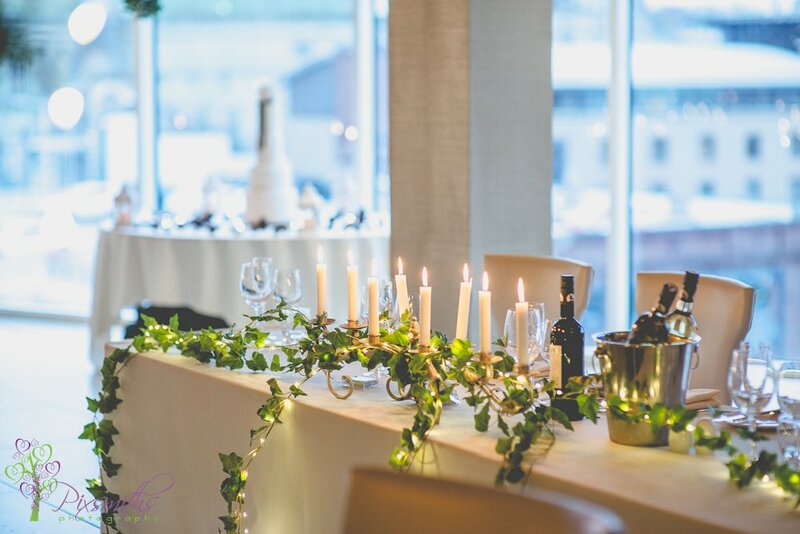 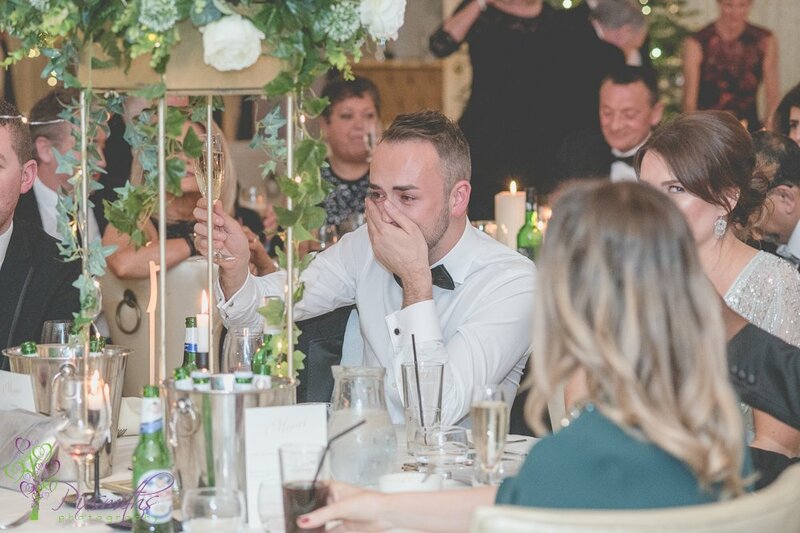 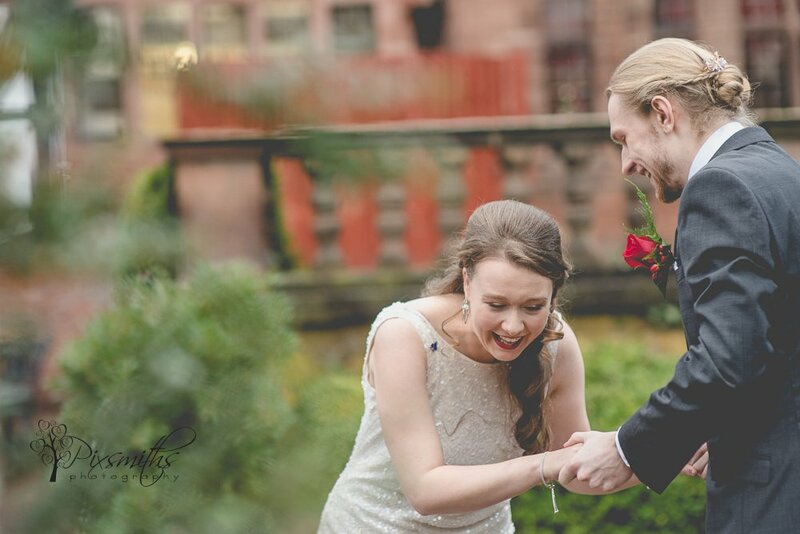 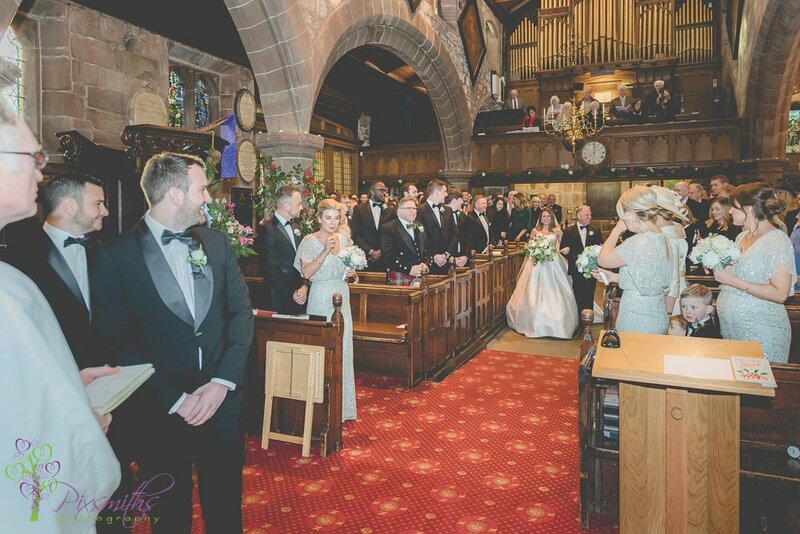 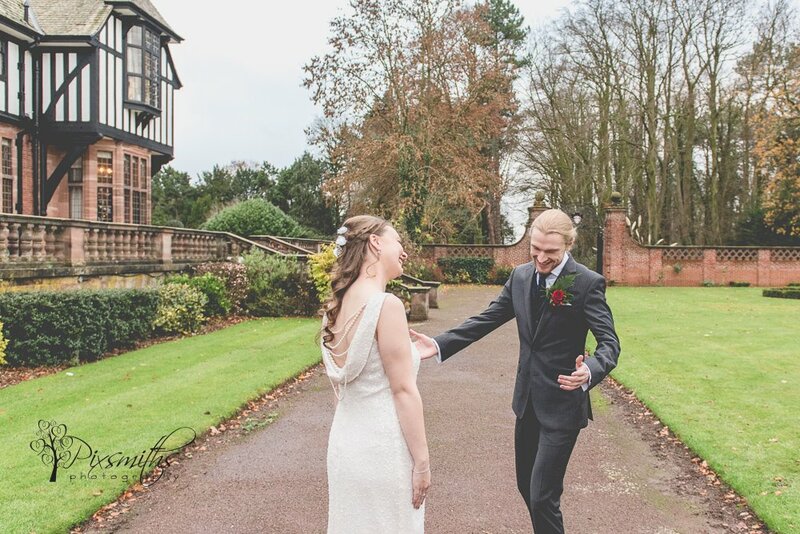 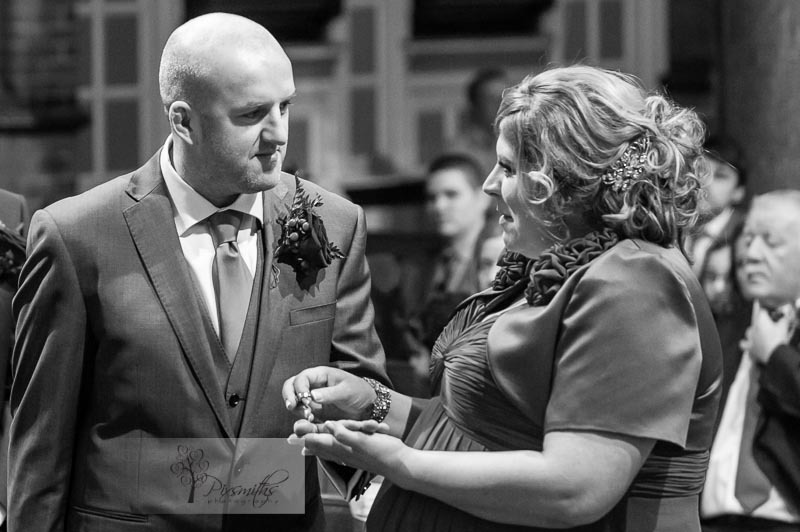 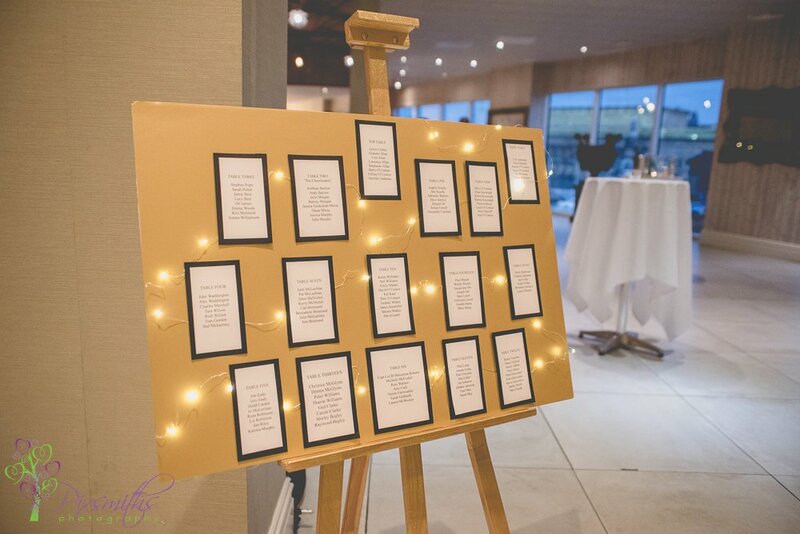 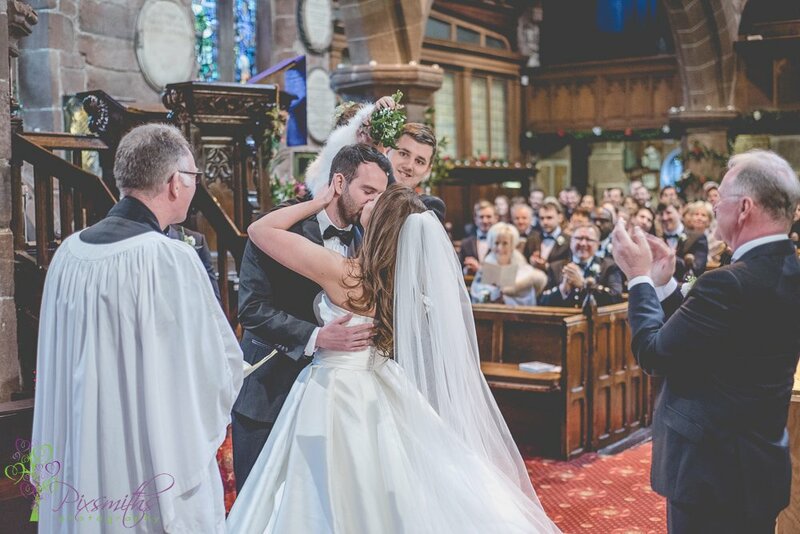 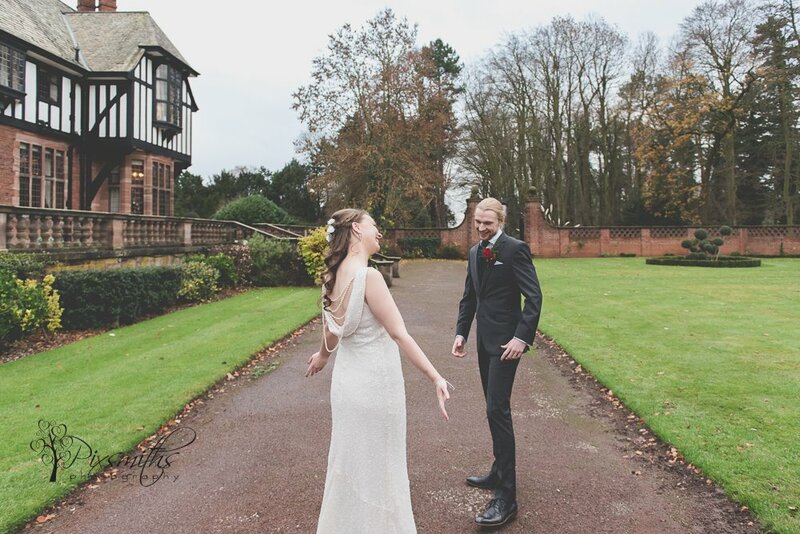 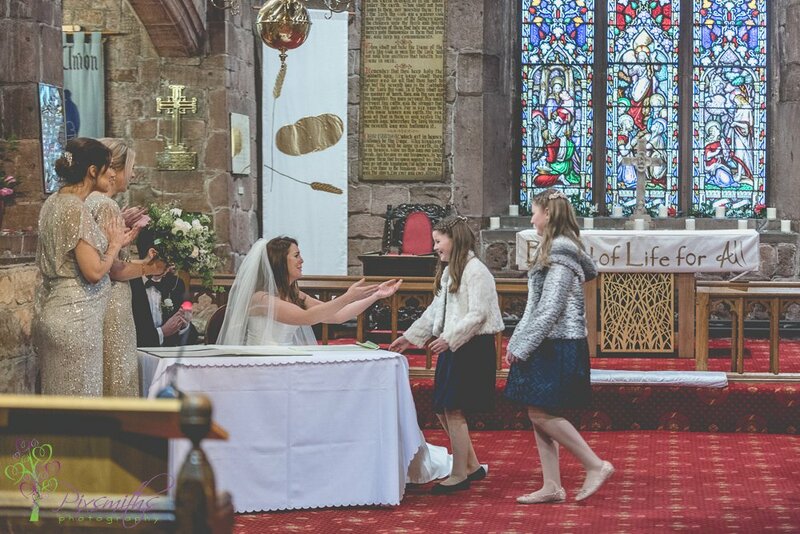 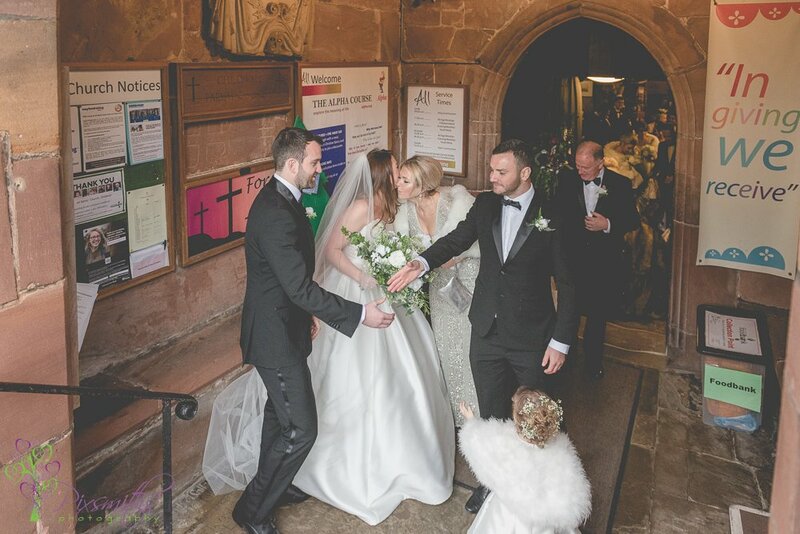 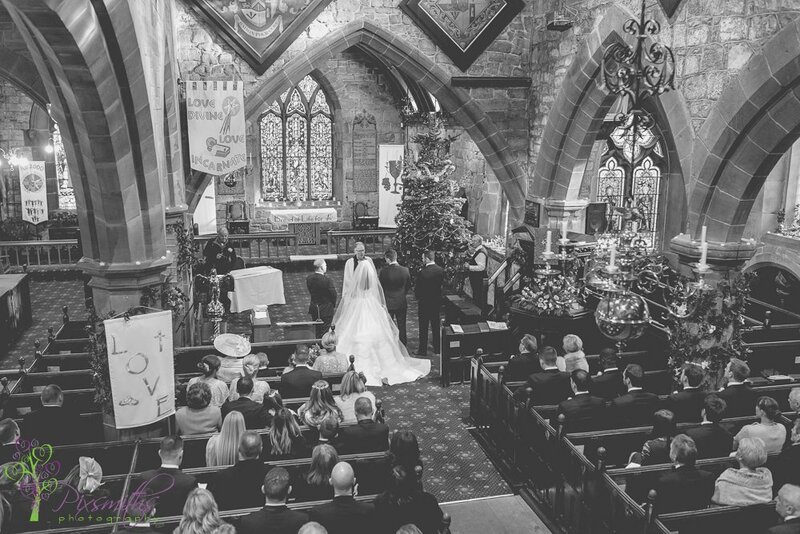 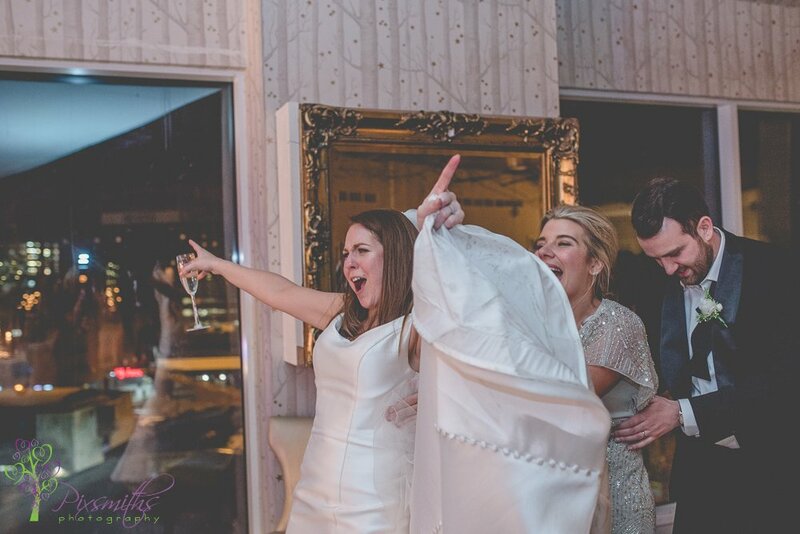 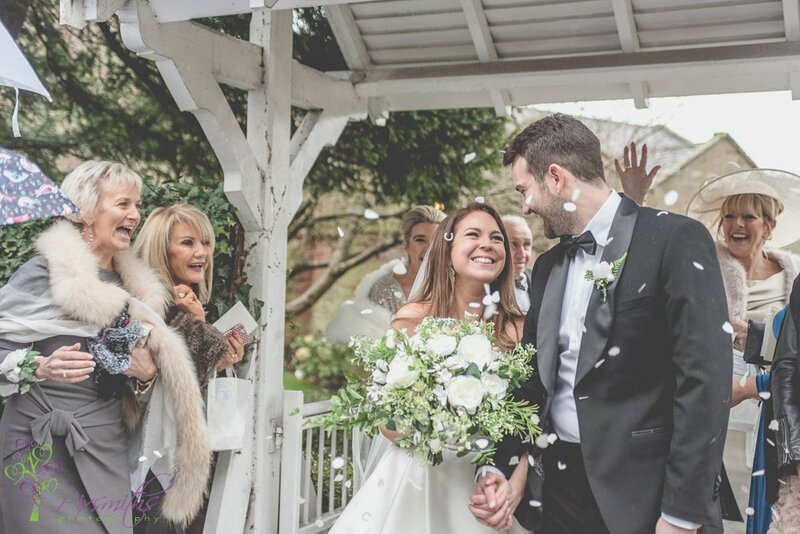 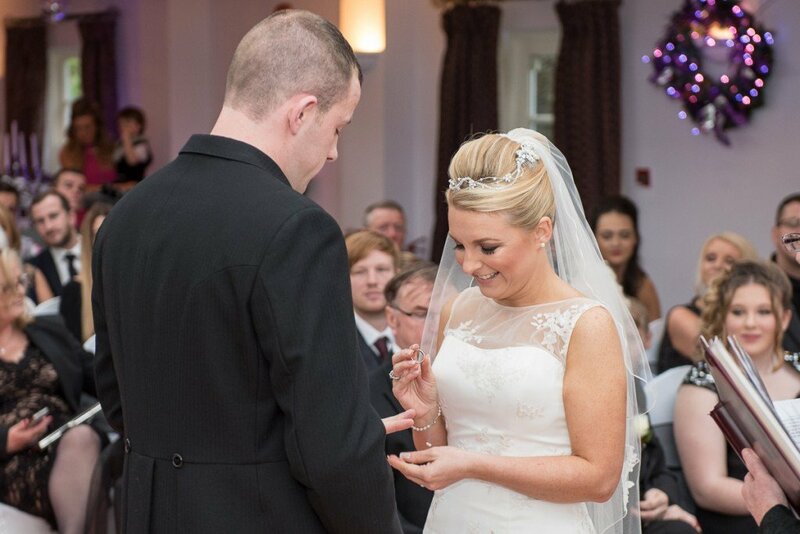 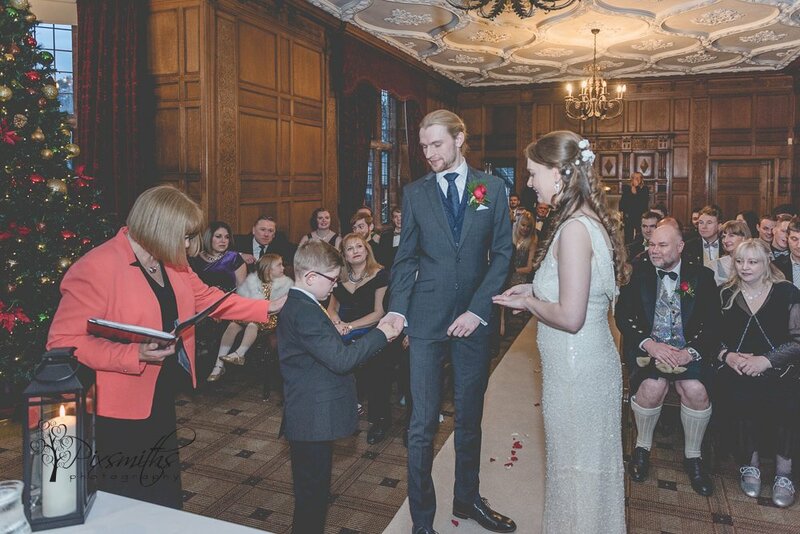 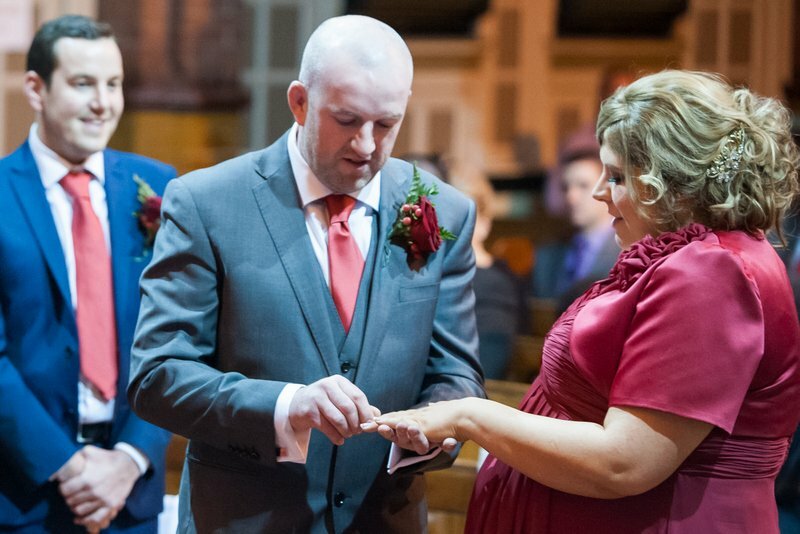 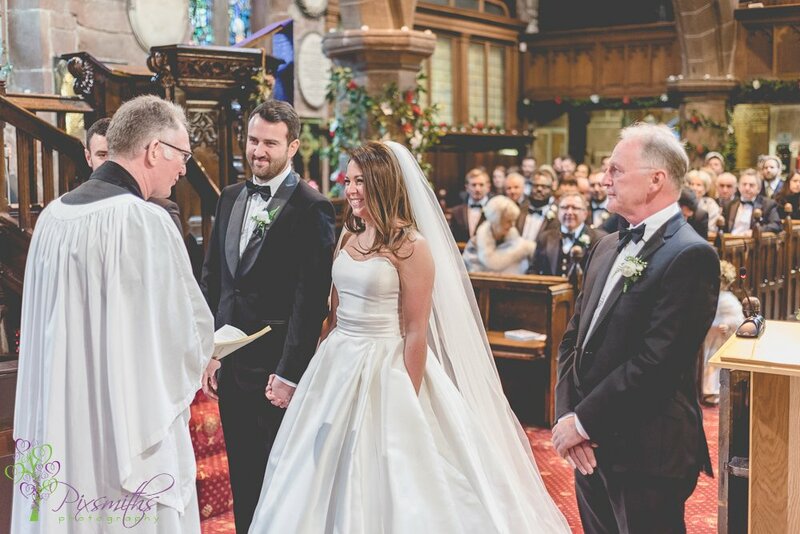 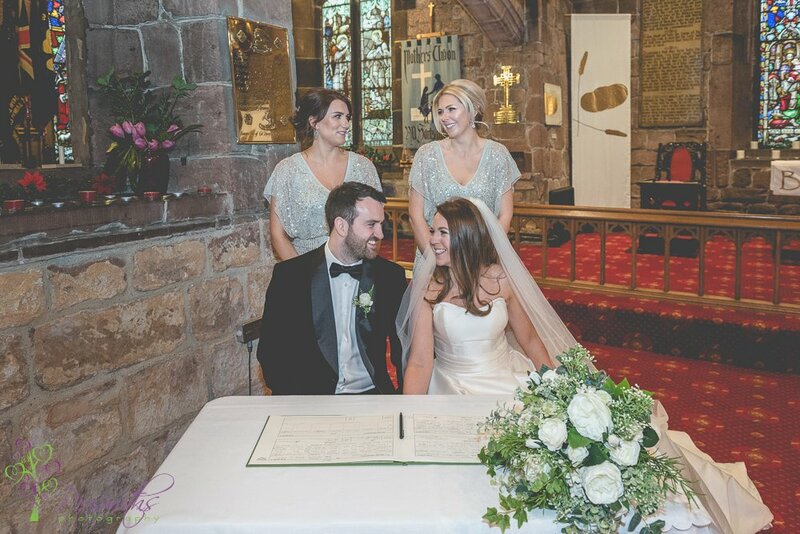 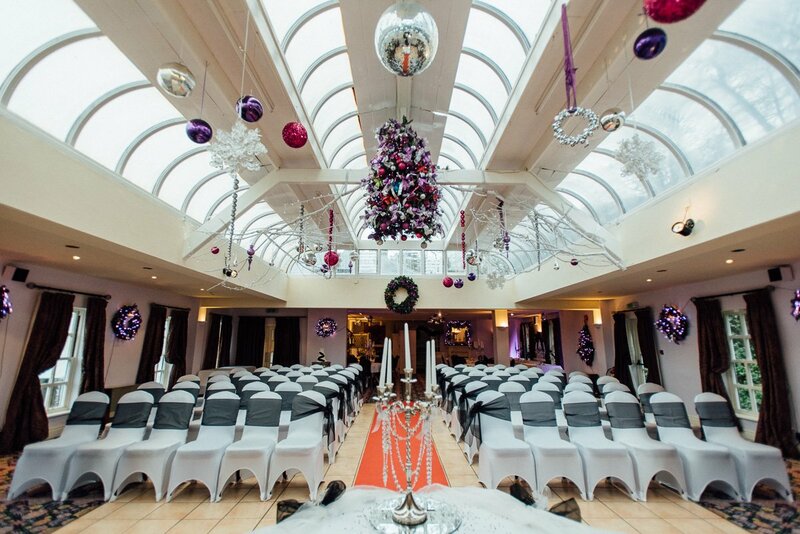 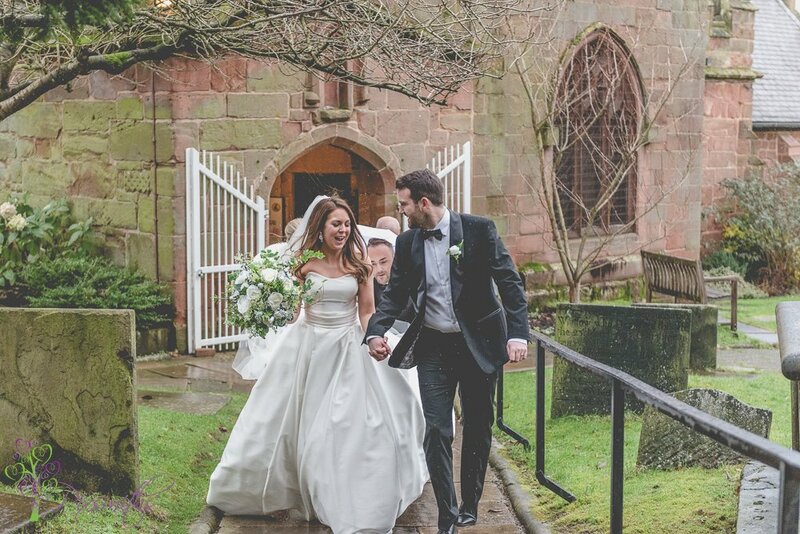 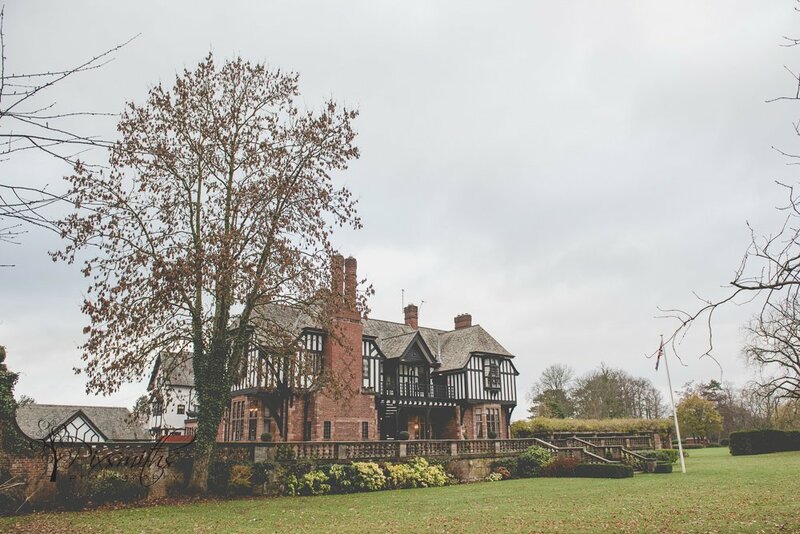 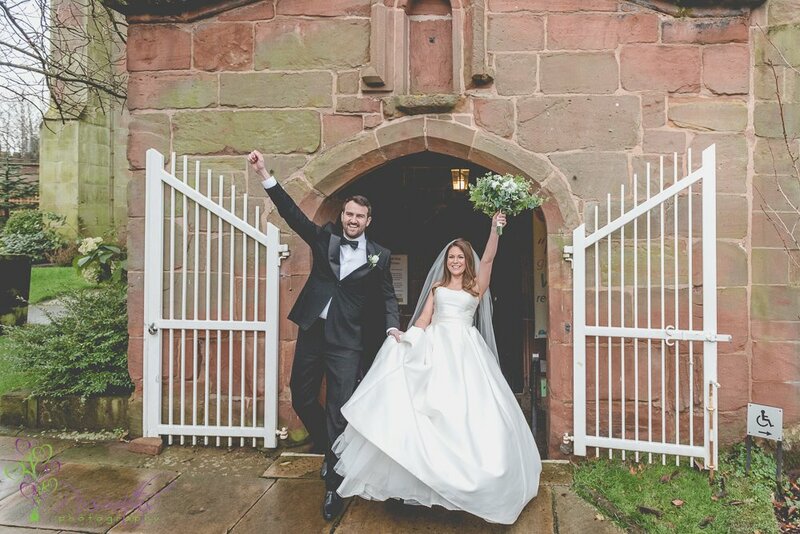 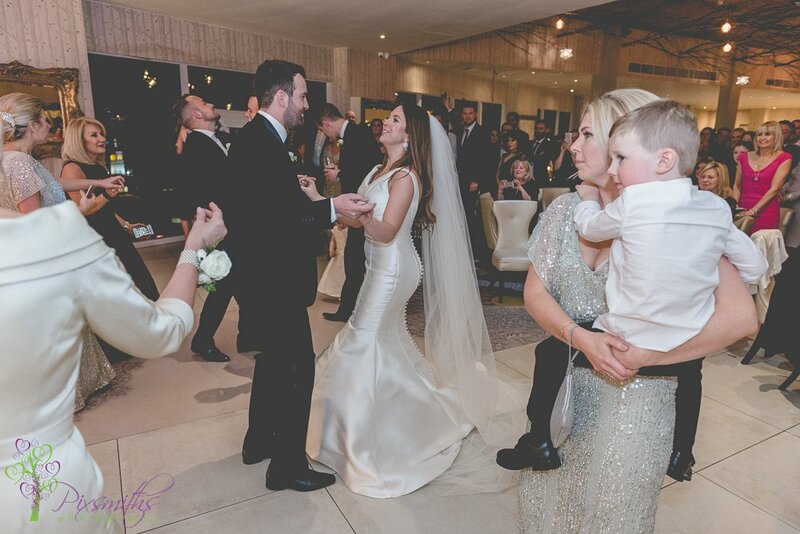 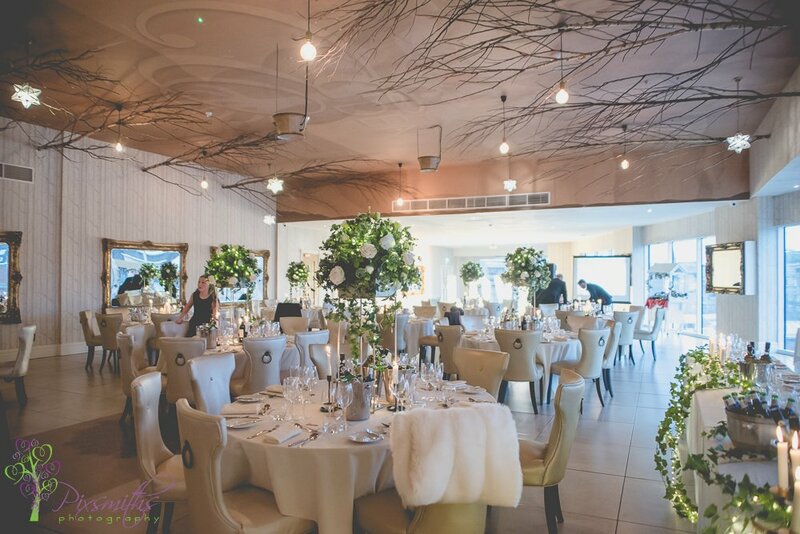 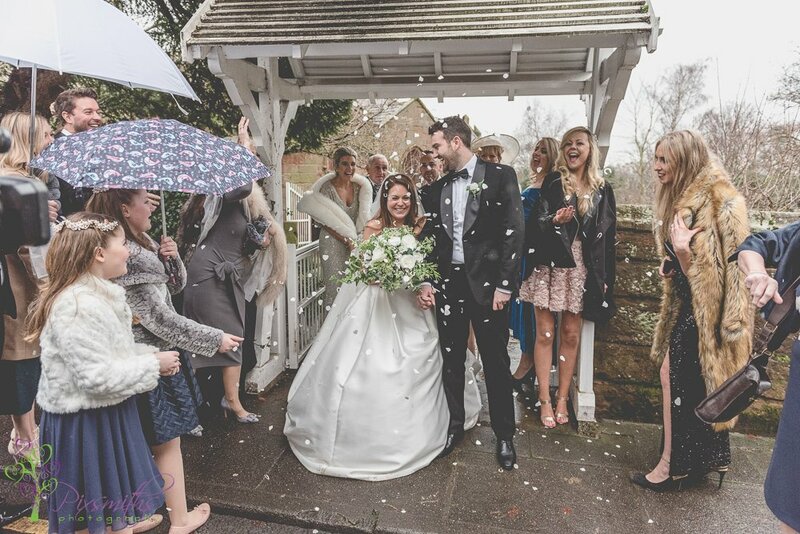 In fact a wedding originally planned for summer 2014…but plans change …and so Sarah planned her Christmas Wirral wedding in the space of just 2 months..and with probably less stress! 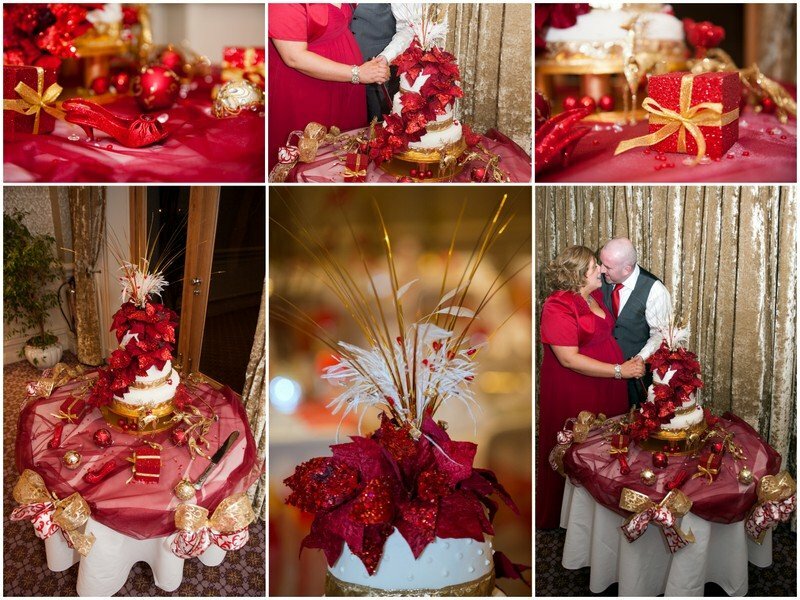 Friends and family were amazing with their generous contributions., a cake beautifully decoration and festively displayed, flowers paid for, venue dressing befitting the seasonal theme with reindeer, sleighs and Christmas movies adding to the festive colours. 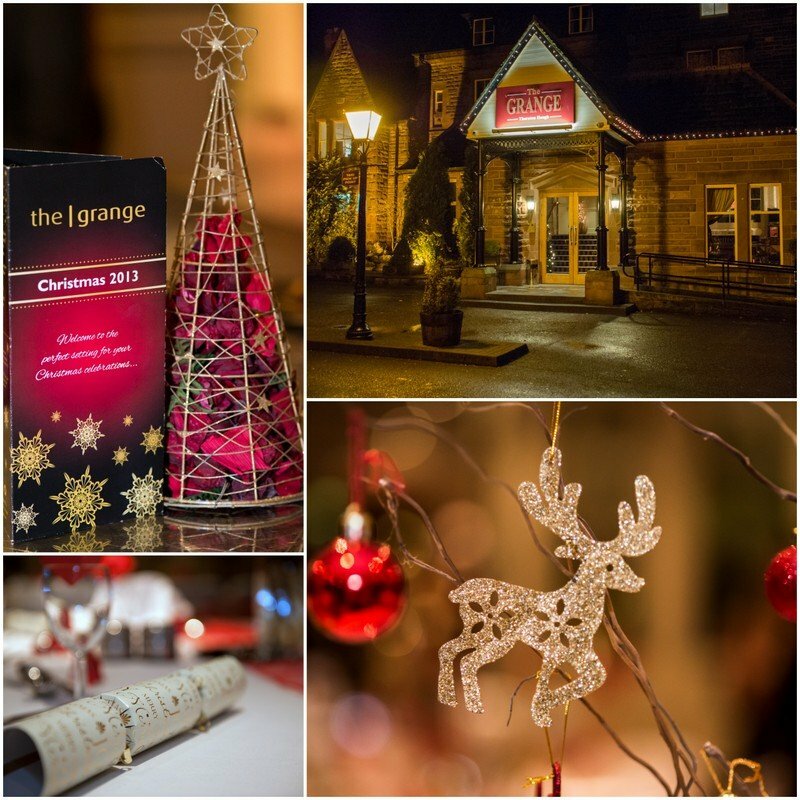 The Grange wedding venue looked resplendent with the decorations too.